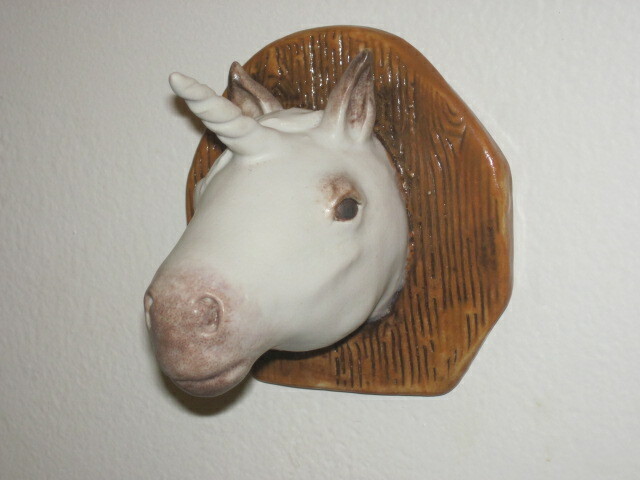 If you are interested in seeing what I have available right now, check my Etsy or Amazon pages, links below. 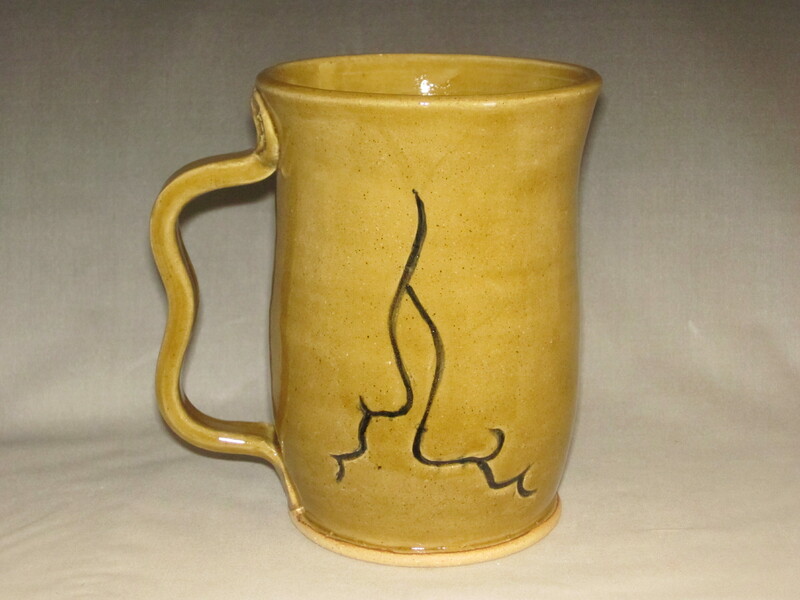 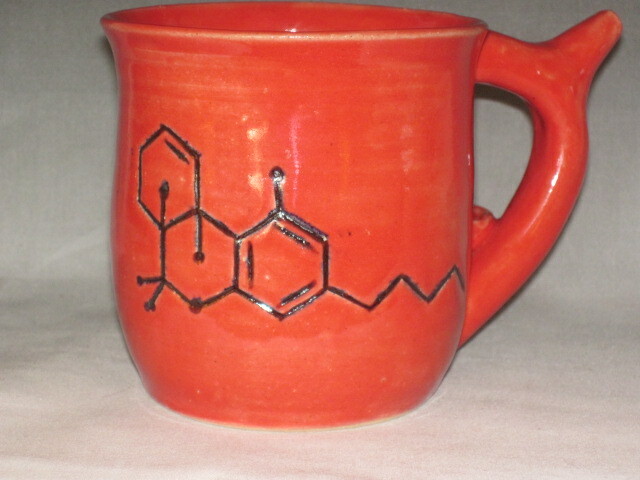 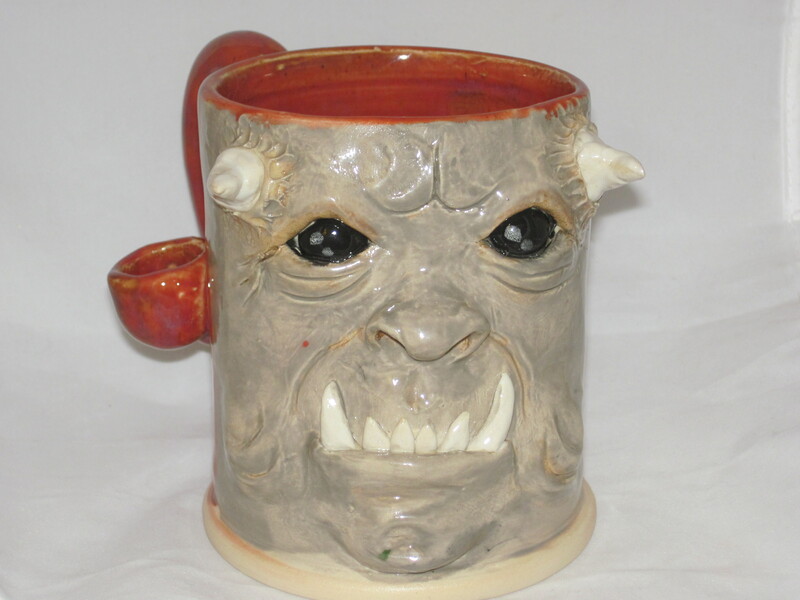 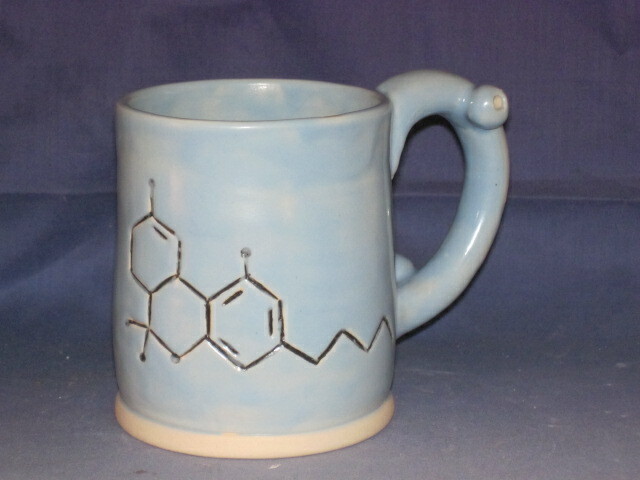 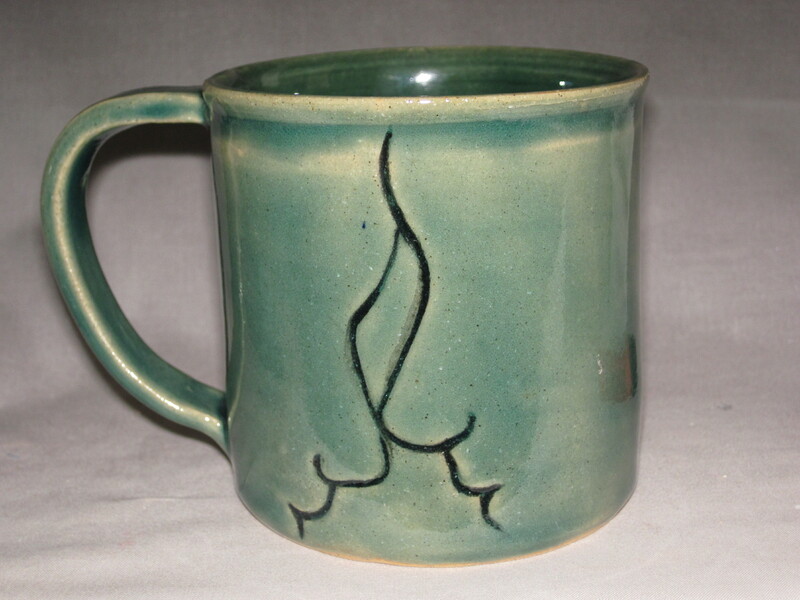 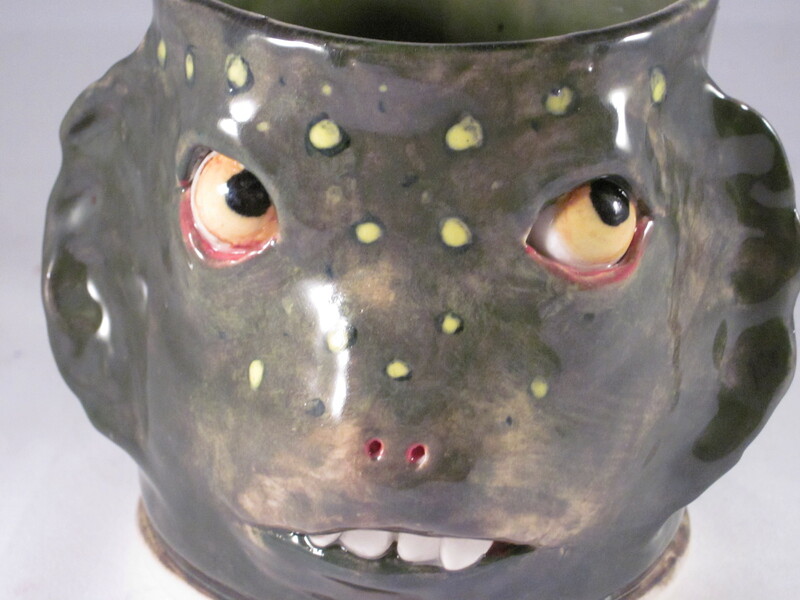 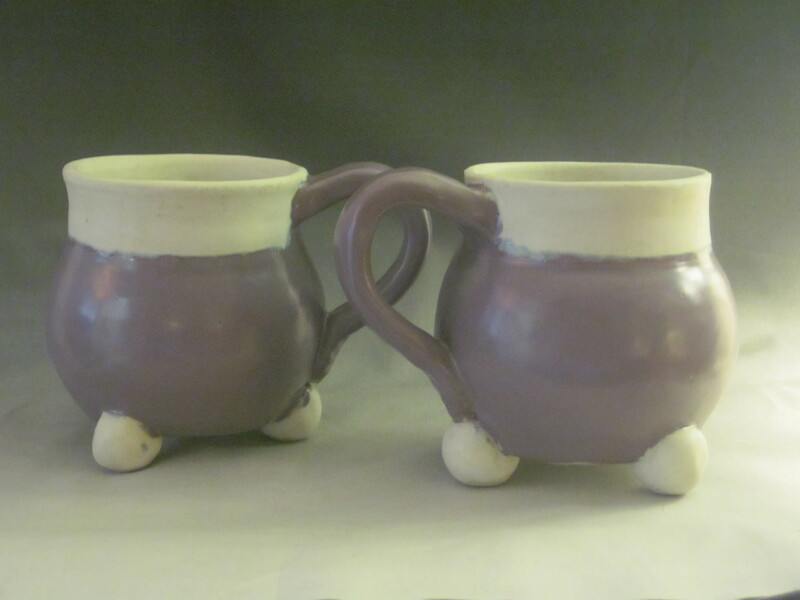 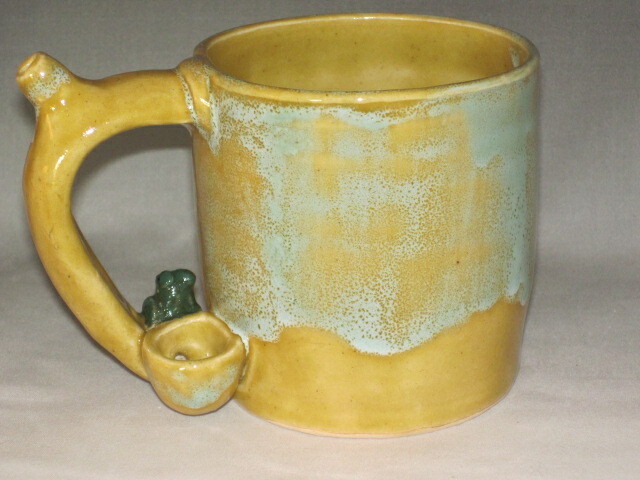 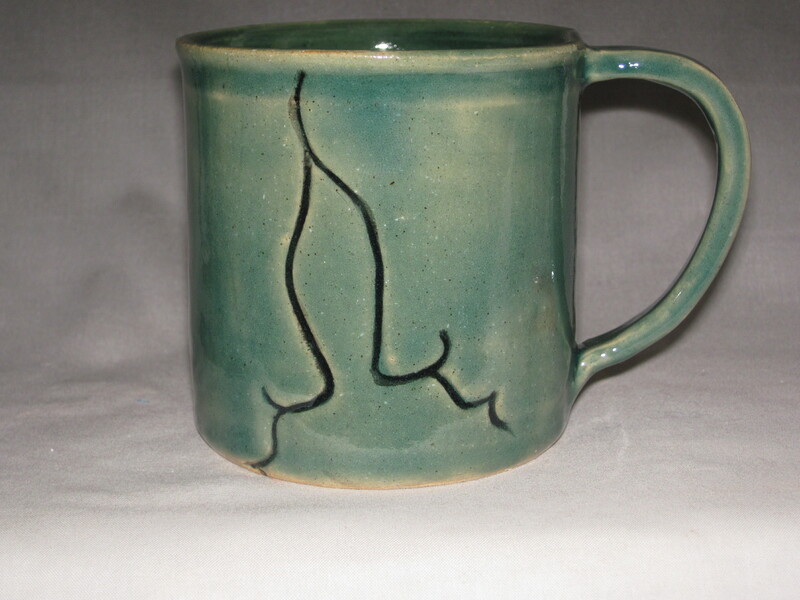 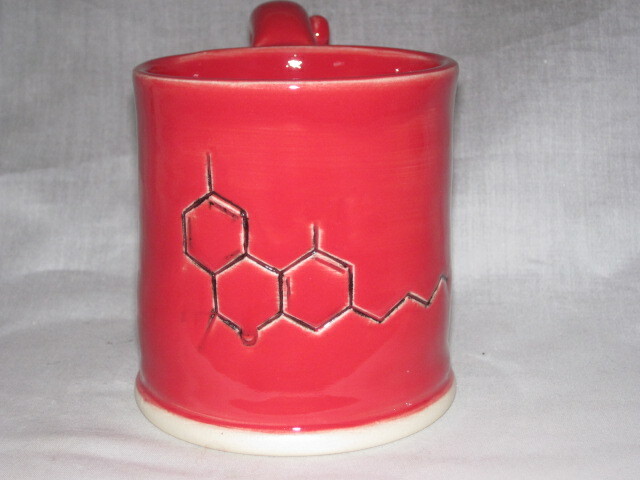 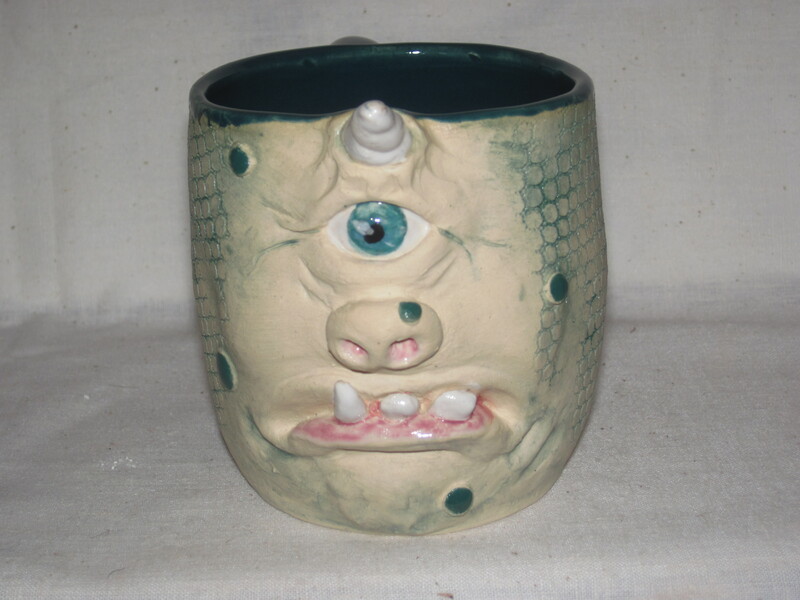 I have been working on new Dragon mugs, The first ones are wake and bakes. 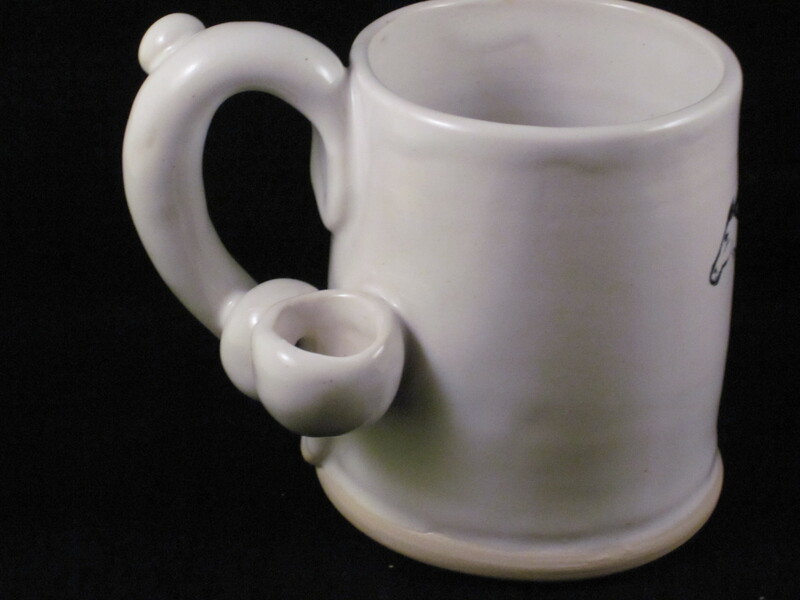 2017 has made it. 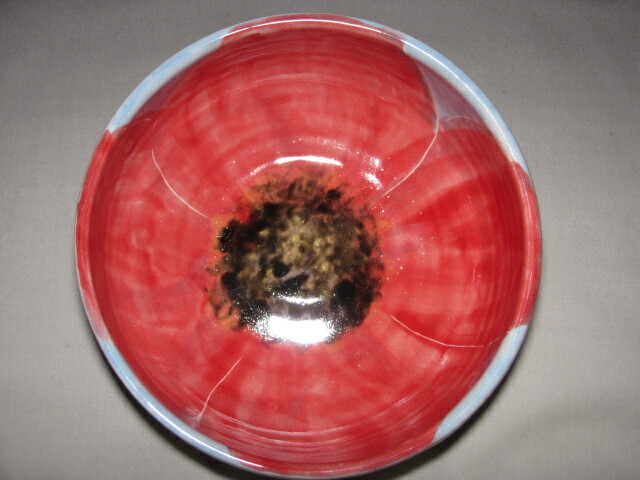 First kiln load of the year. 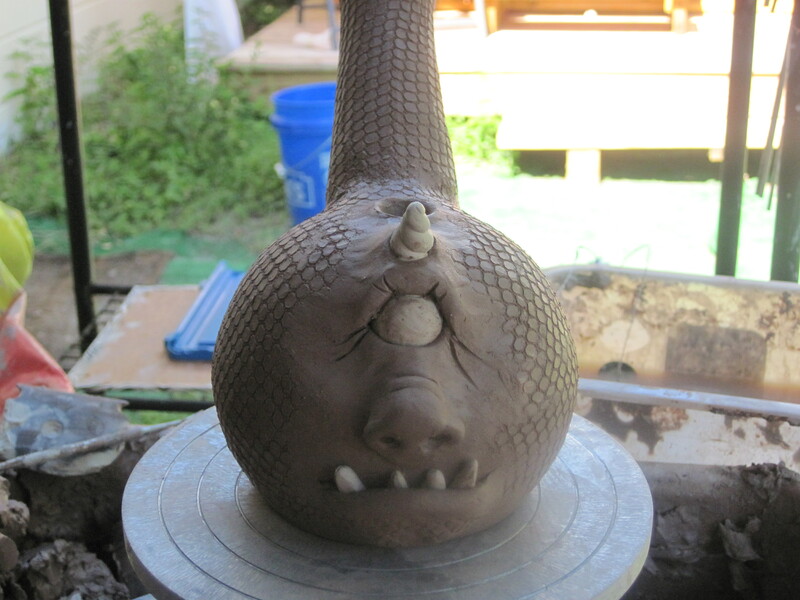 Working hard for 2 shows in December. 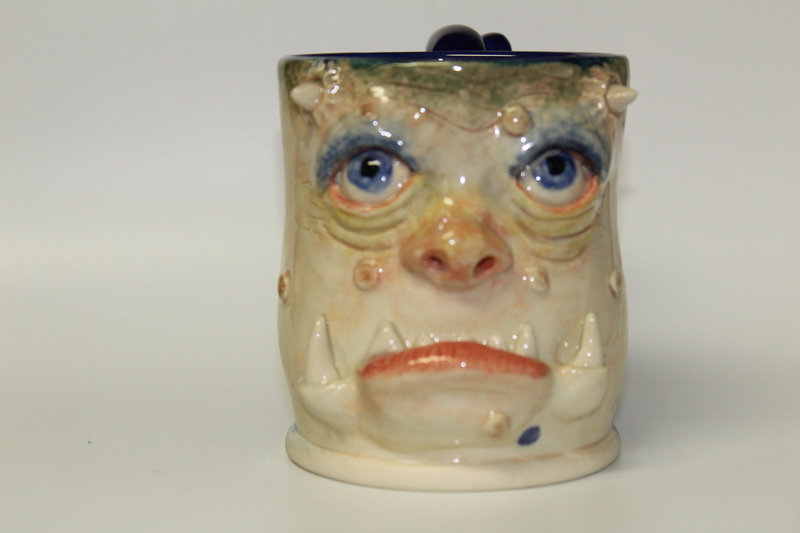 I am making myself leave the studio and do shows and meet people. 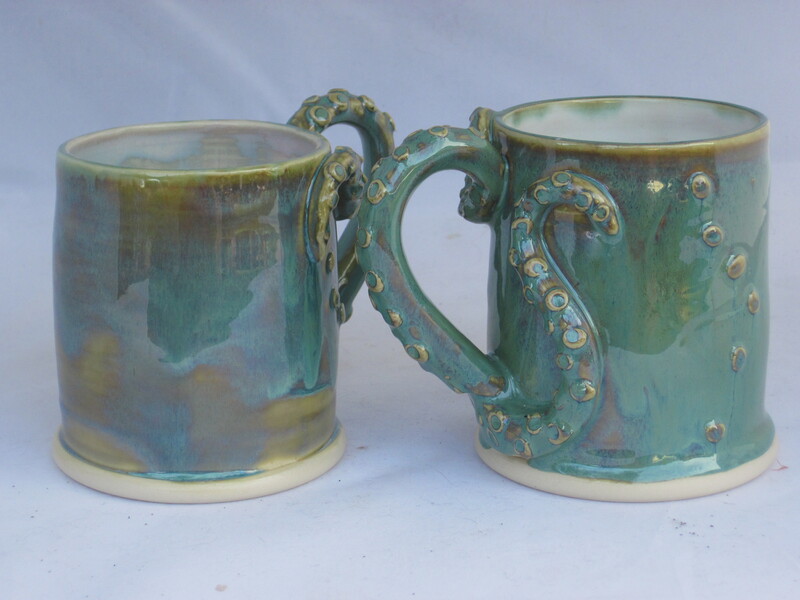 This batch of cephalapods are a bit darker, when i made the glaze I added a small amount of cobalt carbonate to the recipe. 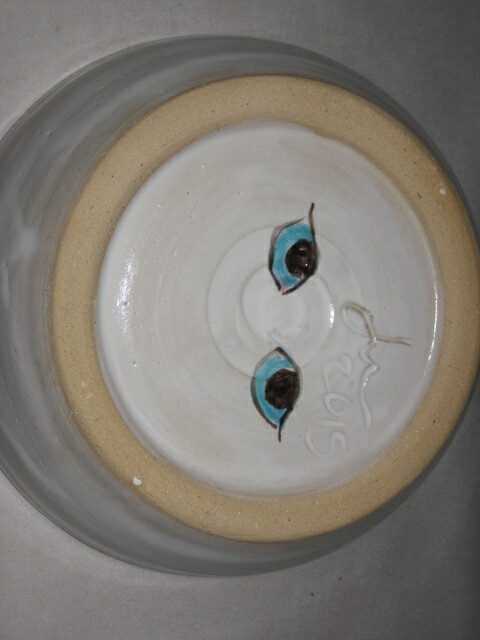 I use a nice white liner glaze on the inside so as to not have to concern about food safety. 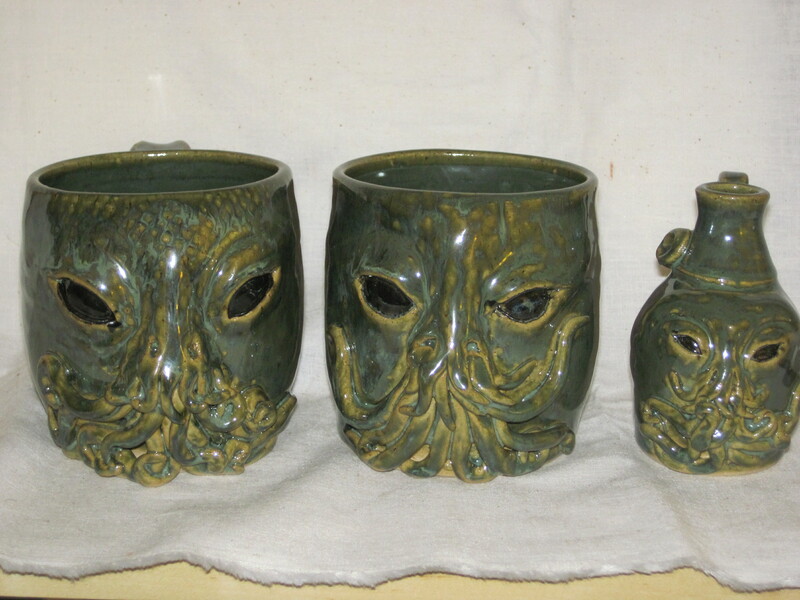 Here are a few more freshly finished pieces ready for my Hauntizaar show. 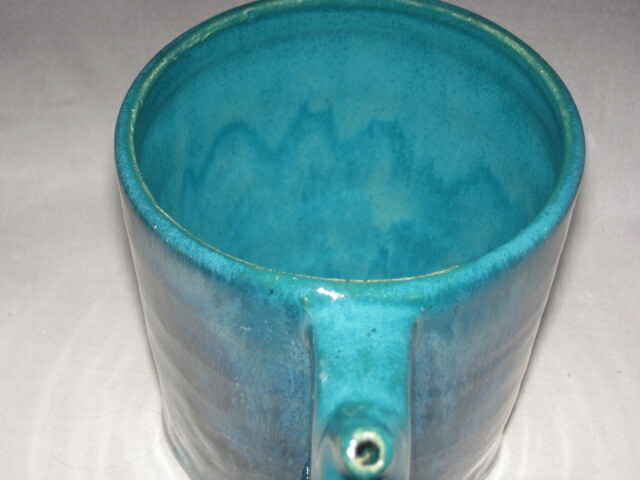 Been busy making and not blogging. 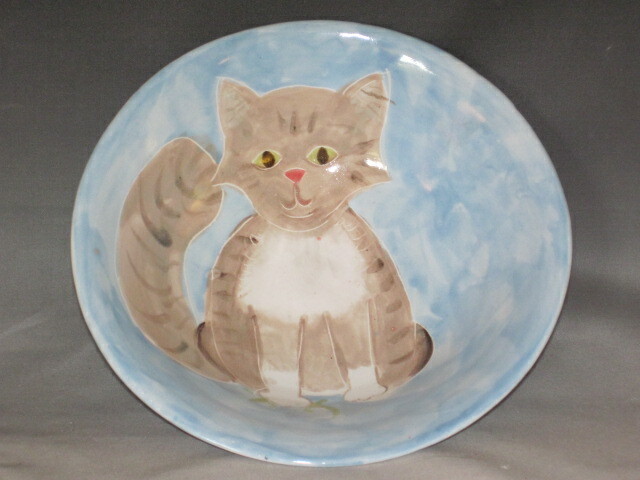 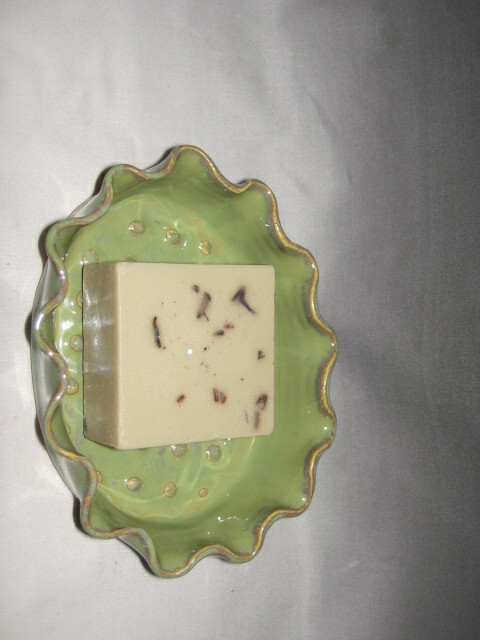 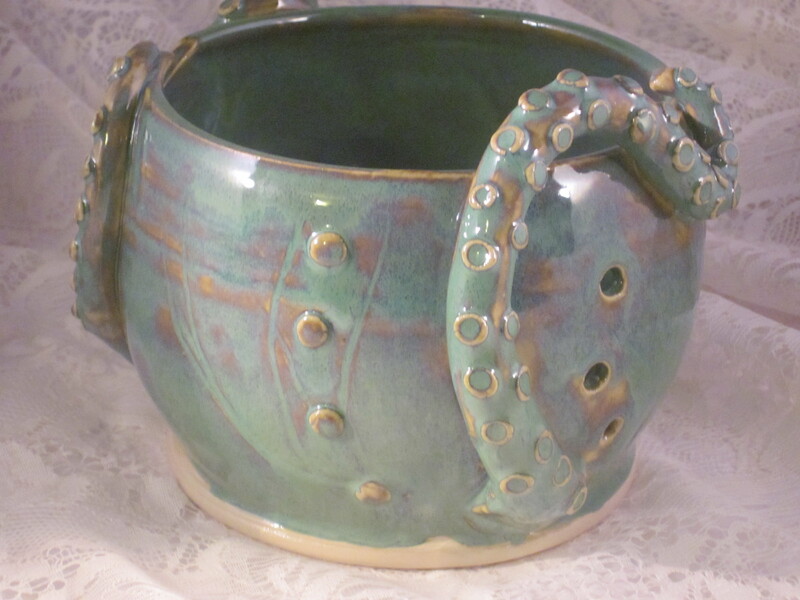 As always you can see what I have new by stopping by my etsy page listed above. 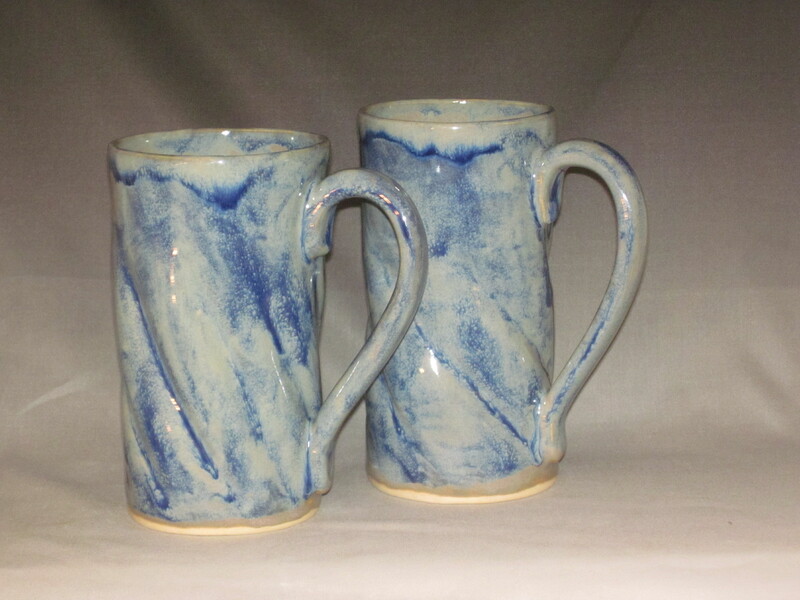 Here are my latest. 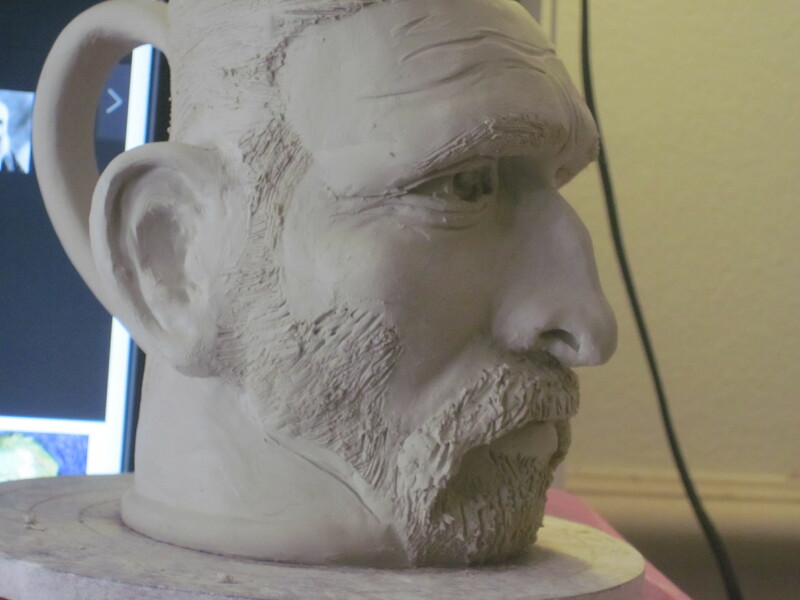 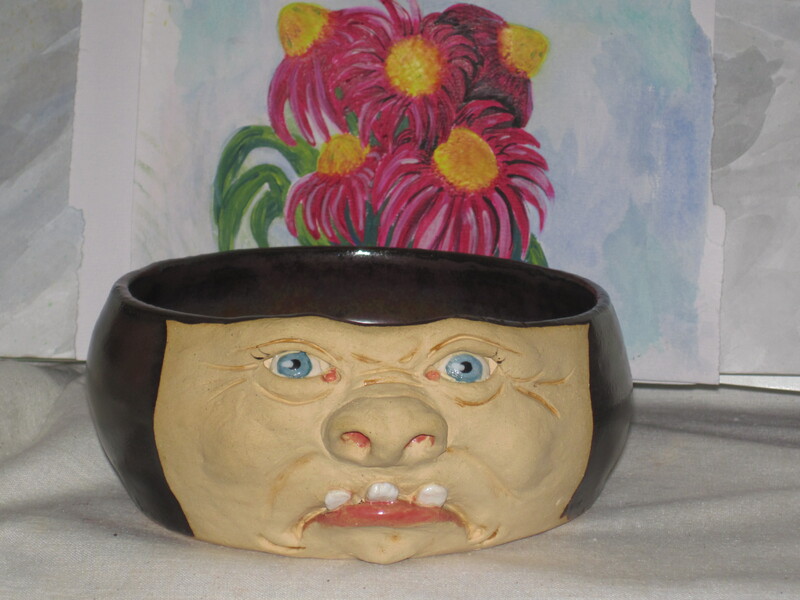 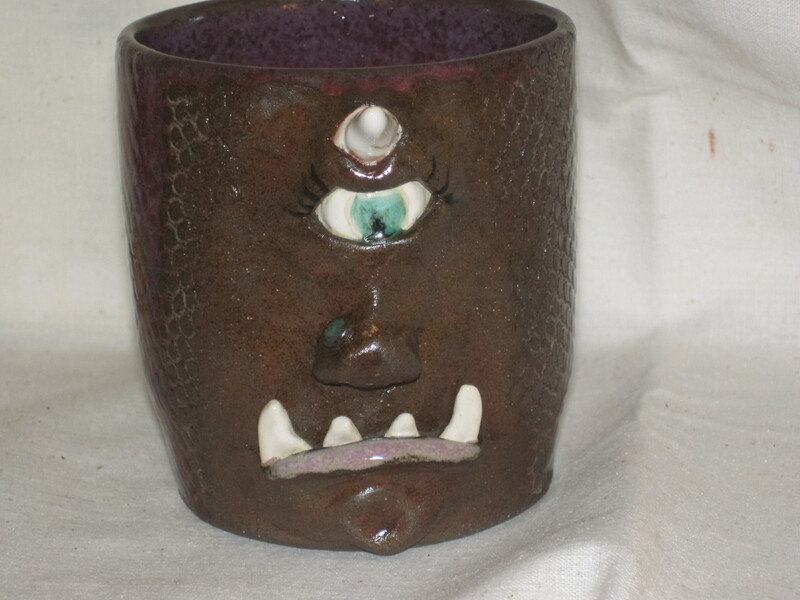 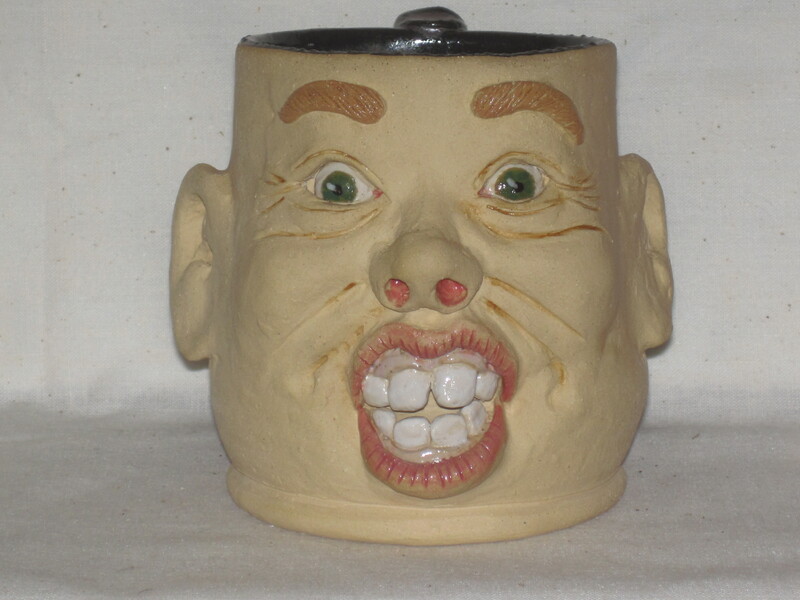 I am back to doing more face mugs since everyone and his brother has been making poor quality wake and bakes, I decided to make some that can’t be copied. 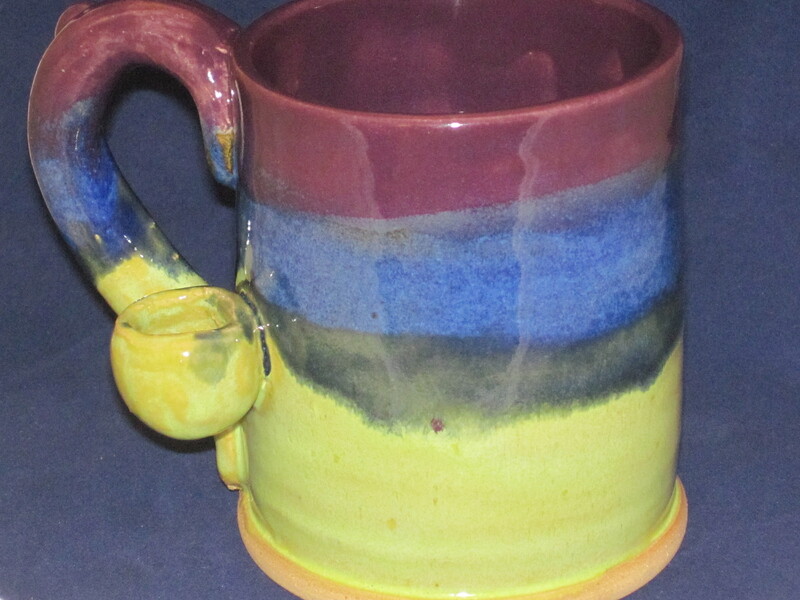 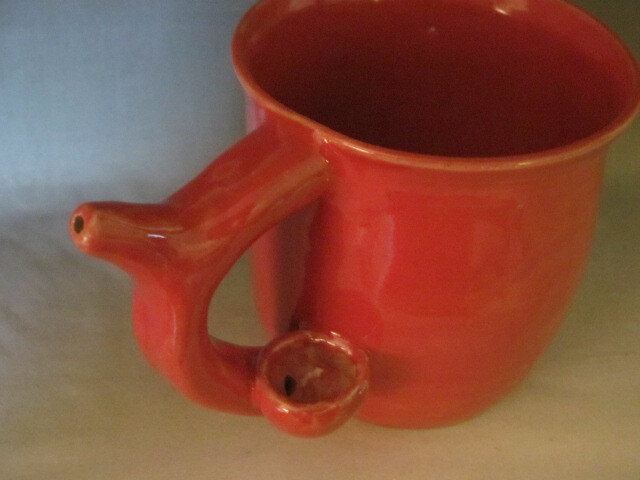 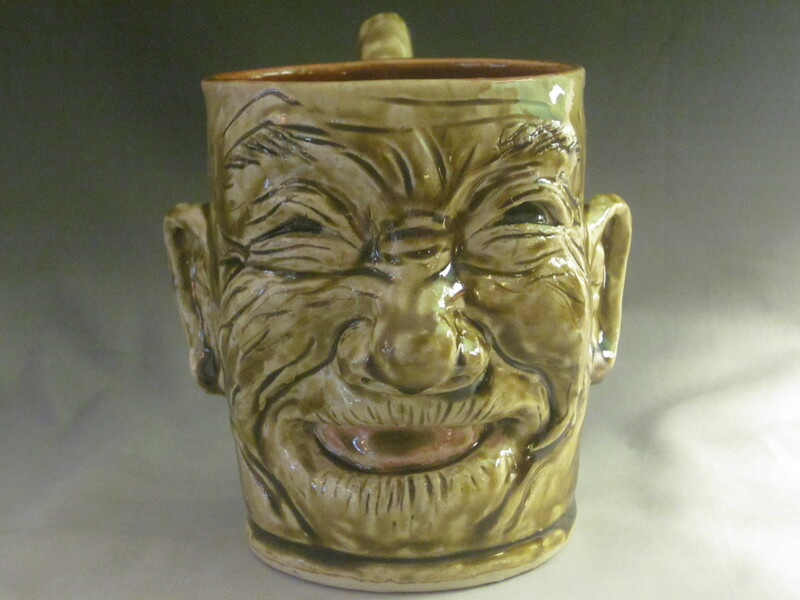 Wake and Bake , Coffee mug and pipe combo, all on a face mug! 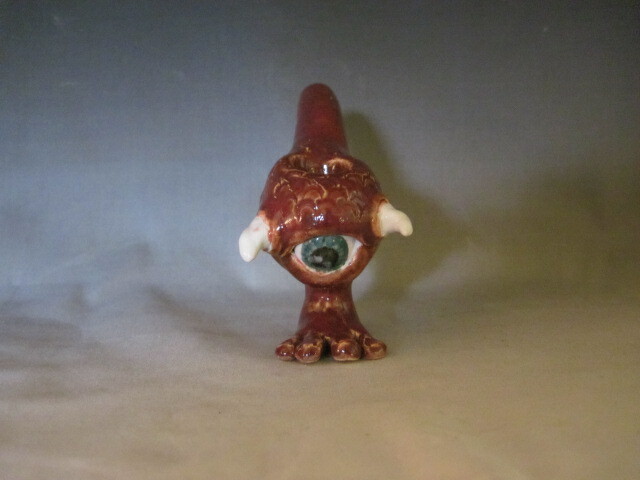 A few more of this weeks pieces. 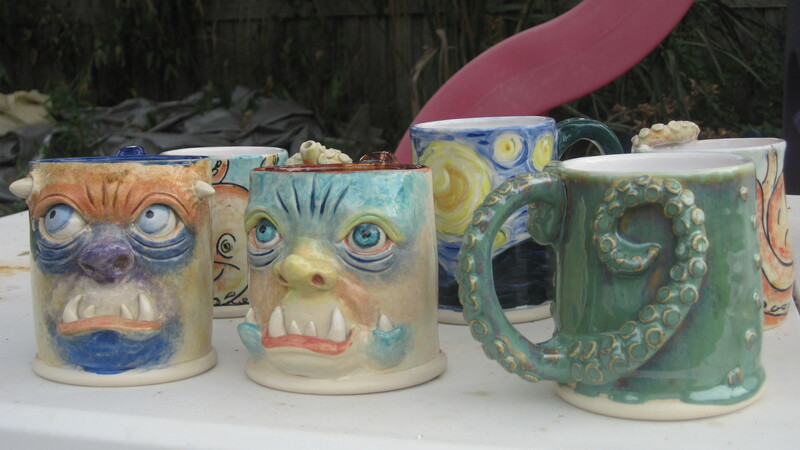 I love the caramel ice cream one. 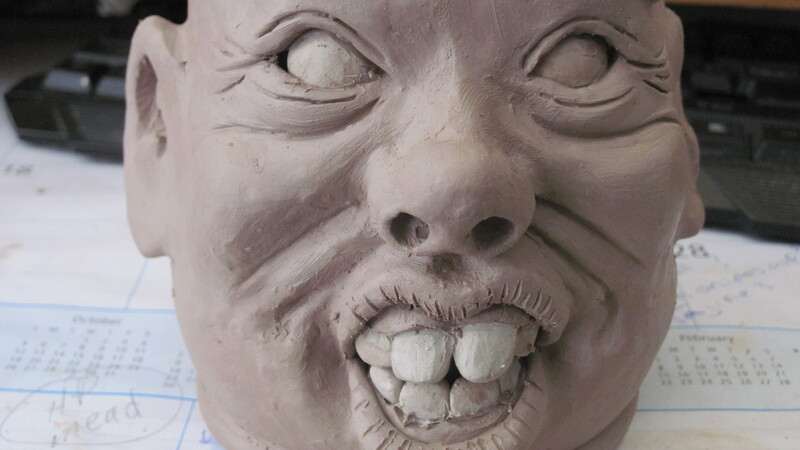 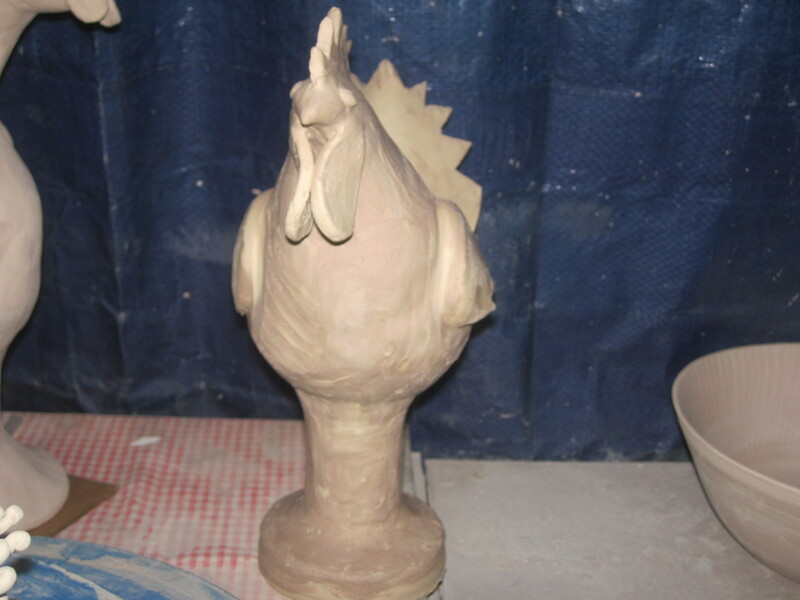 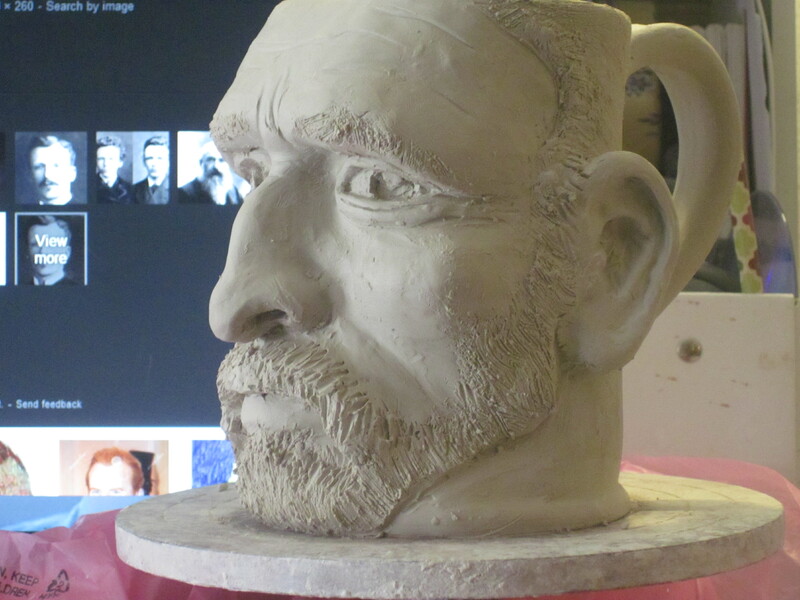 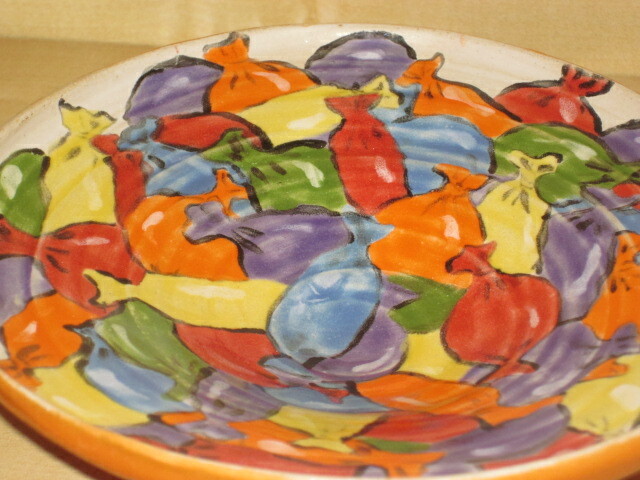 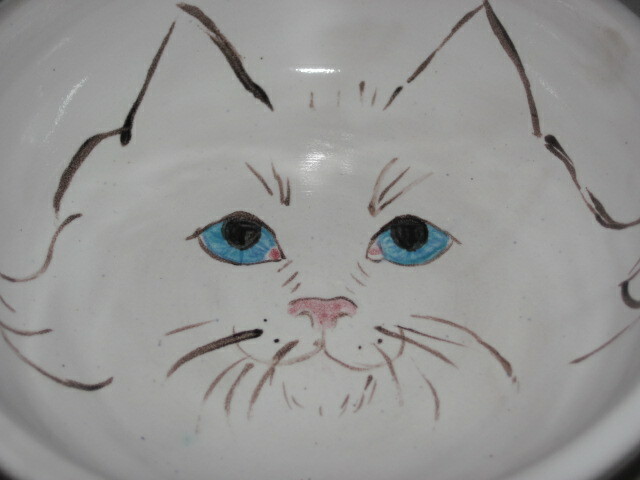 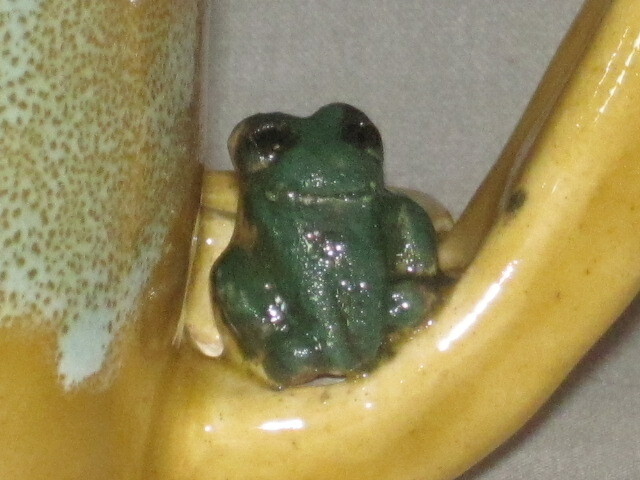 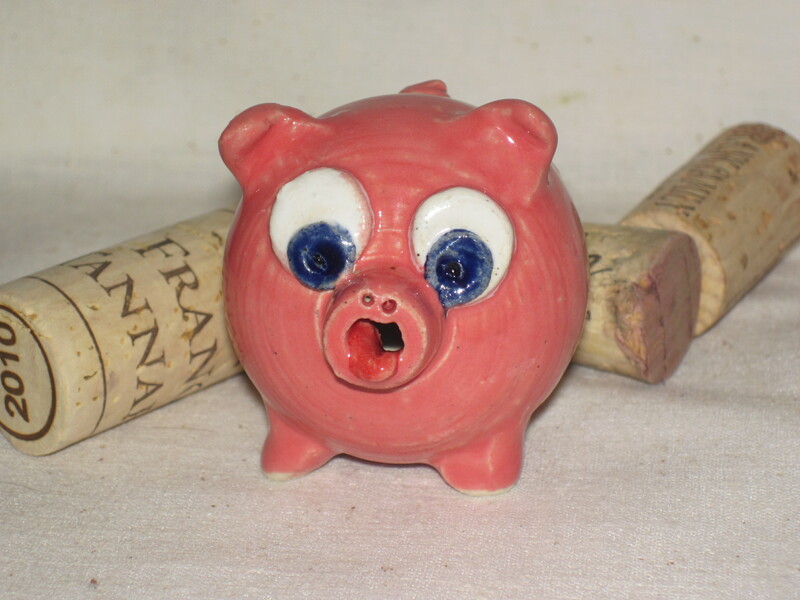 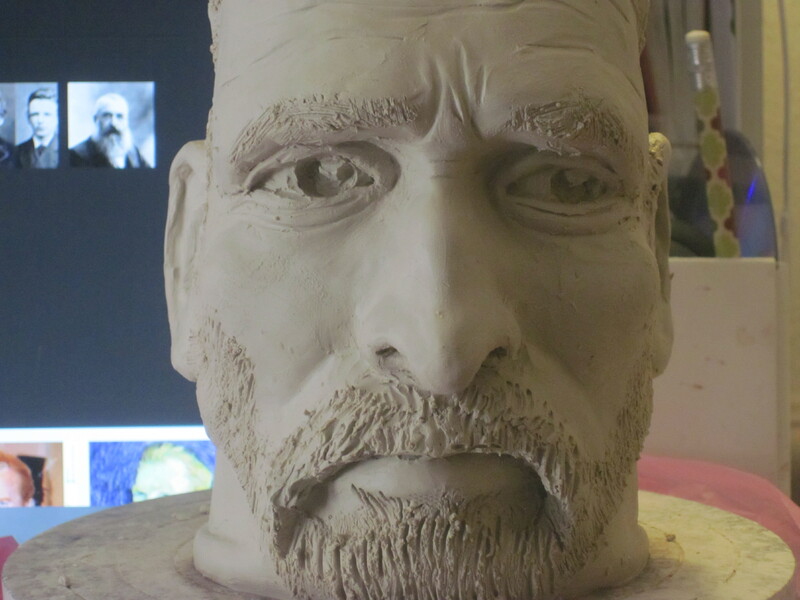 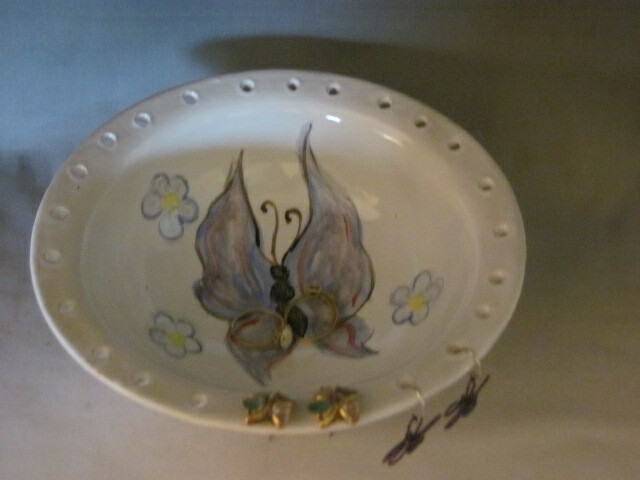 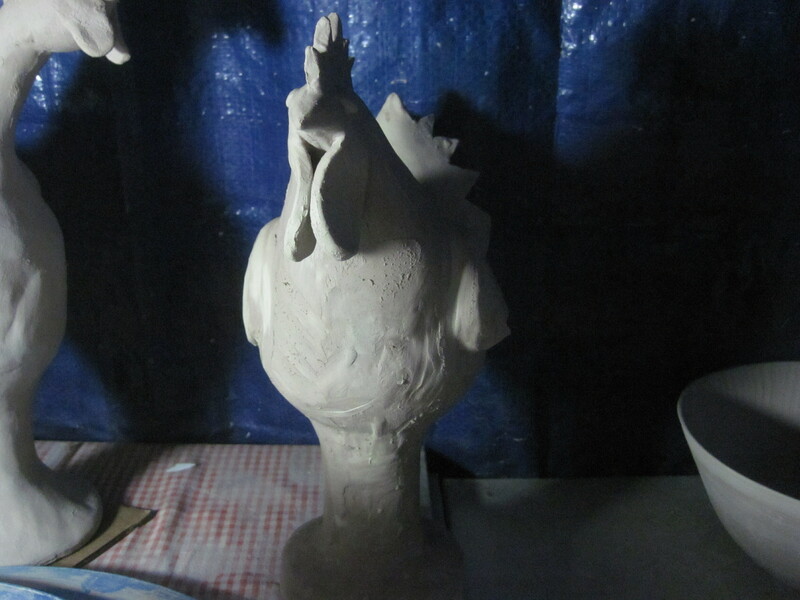 Working on Majolica ware and I like my progress. 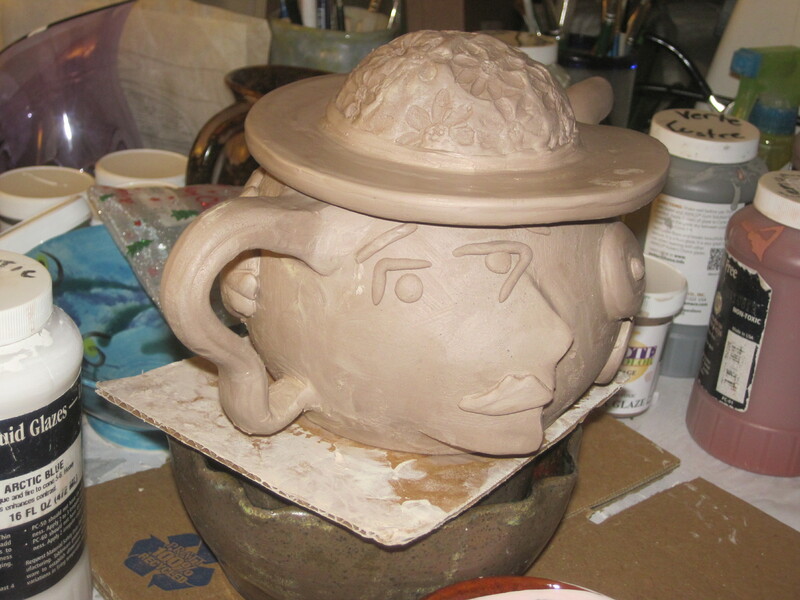 I am doing a portrait wake and bake, posting the progress just for fun. 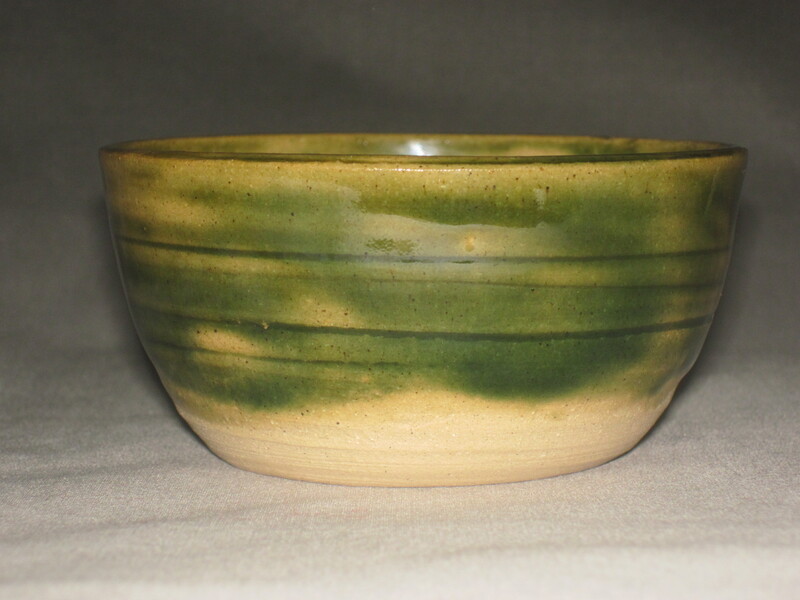 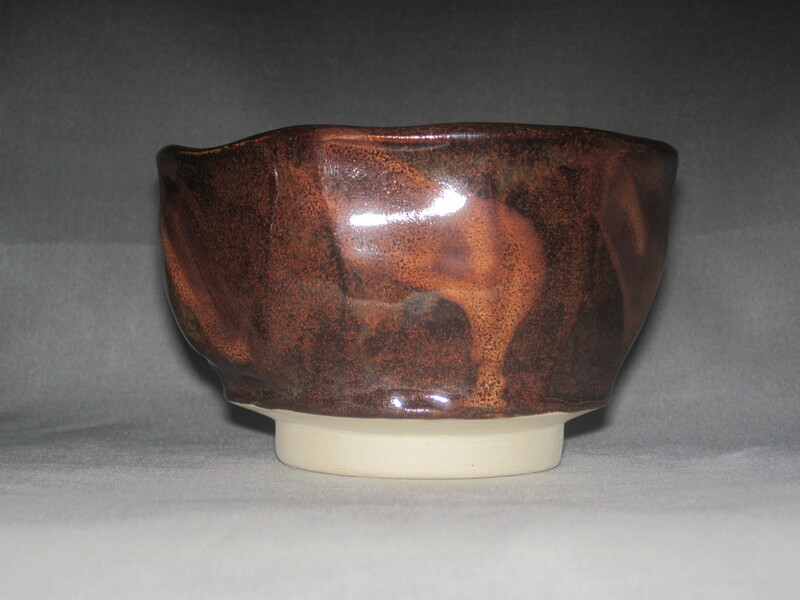 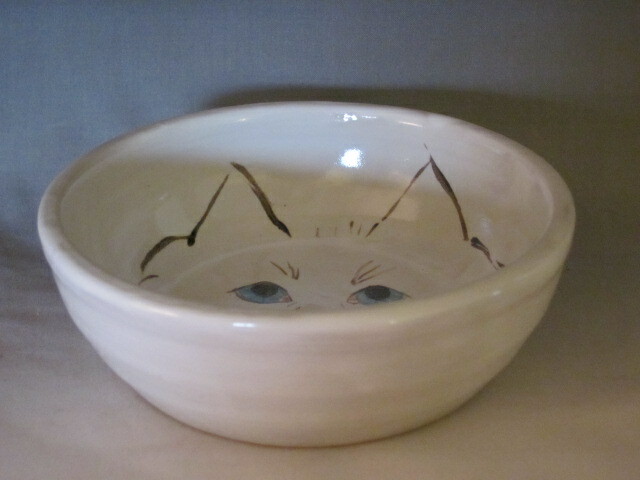 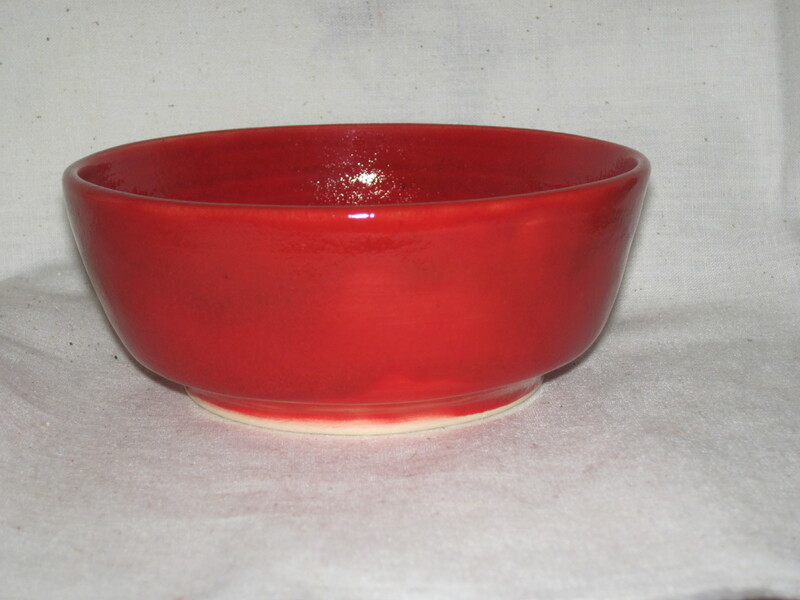 Last year ended with a bang and this year I plan to learn so much more about what I do but I am starting the year out by working on bowls for “The Empty Bowls” project. 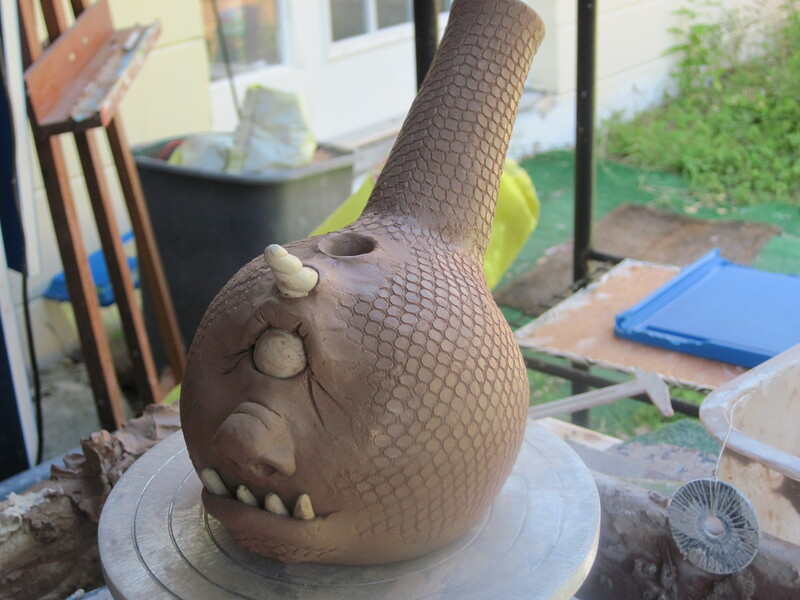 Last year ended with me making at a furious pace trying to keep up. 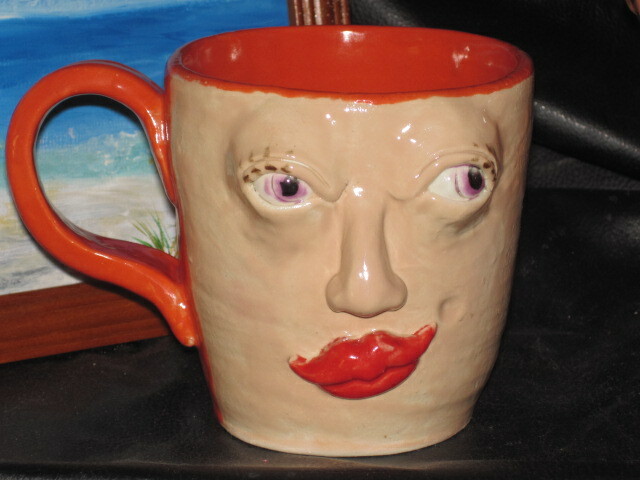 I had Will it happen again? 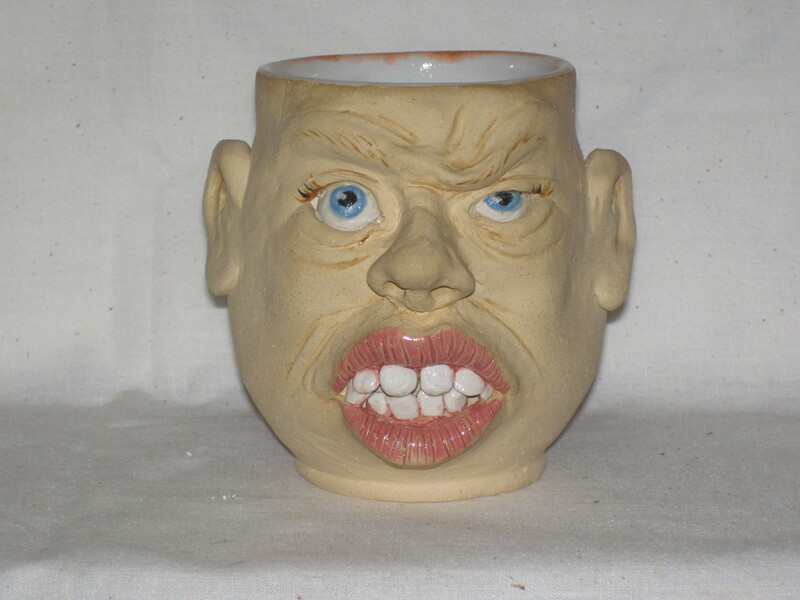 Hard to say. 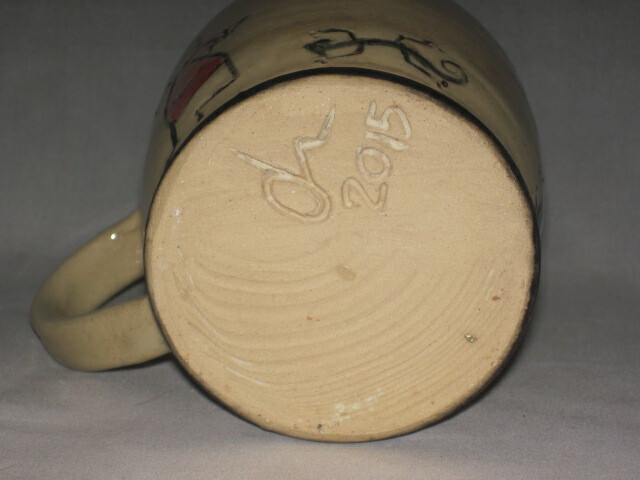 I had a stamp made for on my work, no more scribbled names in clay…. 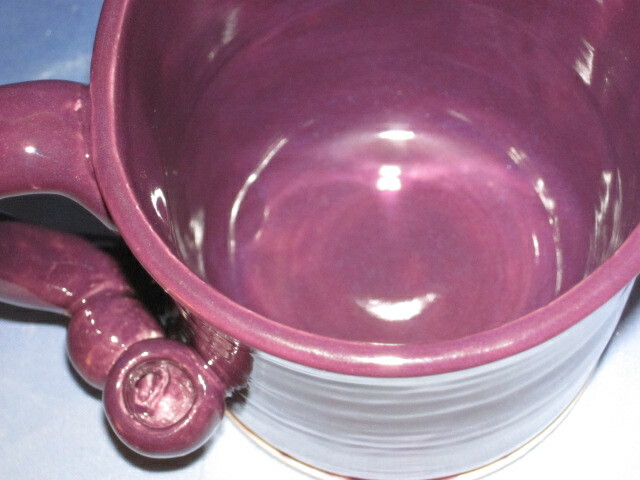 The first holiday to target will be Valentines day. 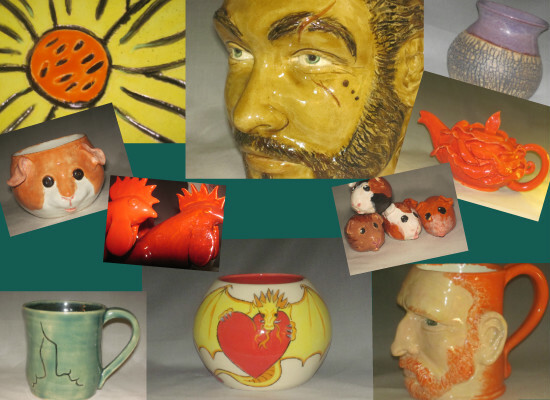 Some of my recent work. 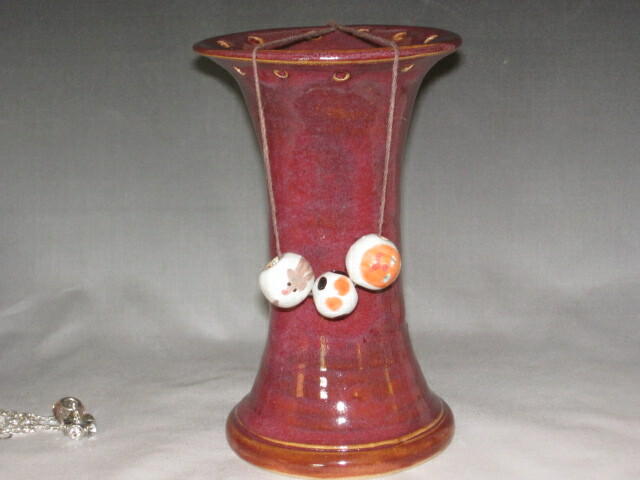 I am constantly playing with form and colors keep checking back for new items. 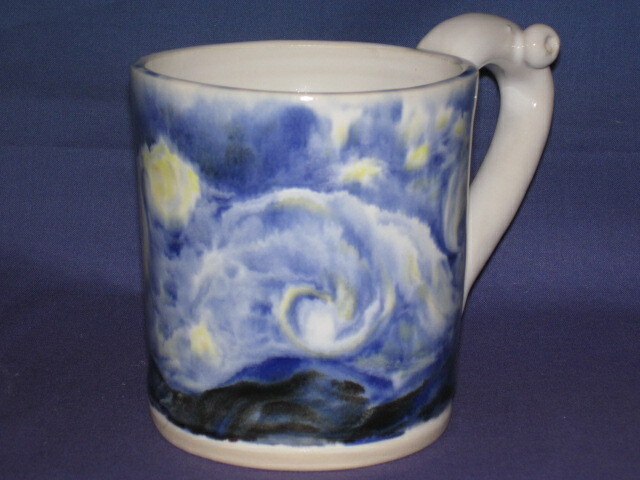 I did a lot of custom work leading up to Christmas. 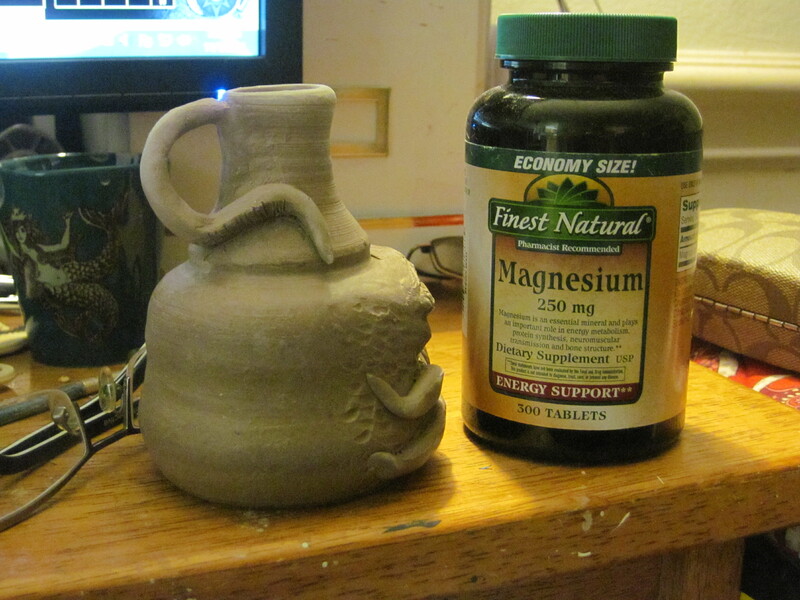 Looking forward to simple stuff for a few weeks. 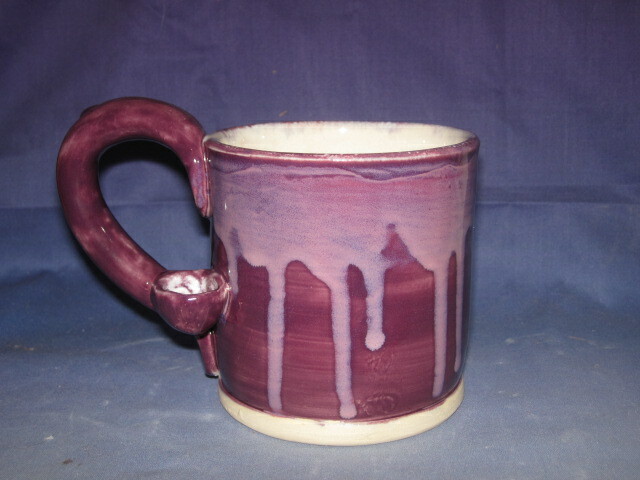 Playing with different designs instead of just one or two colors. 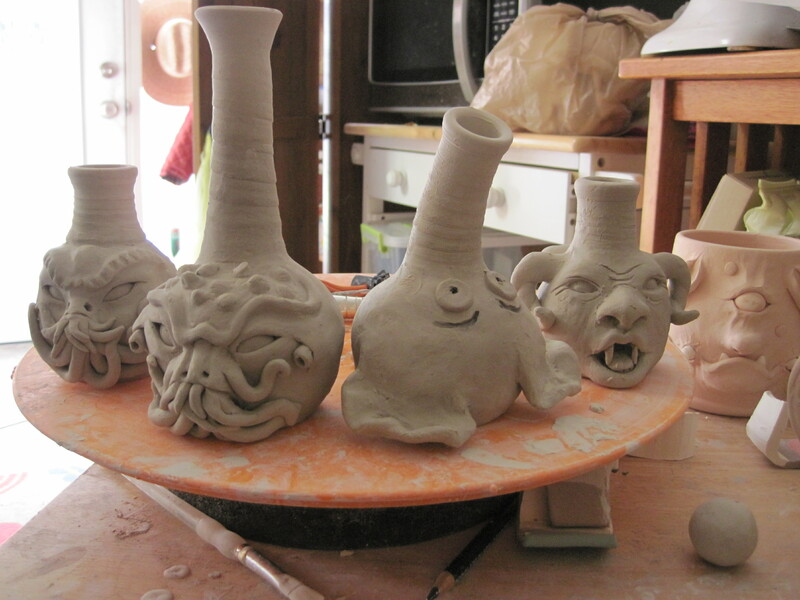 Those were so popular I made more! 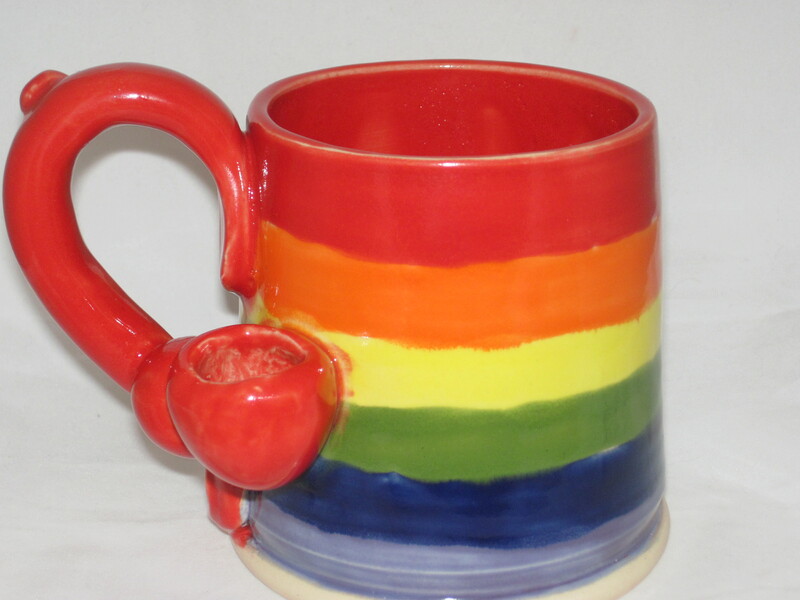 I Especially like the red one. 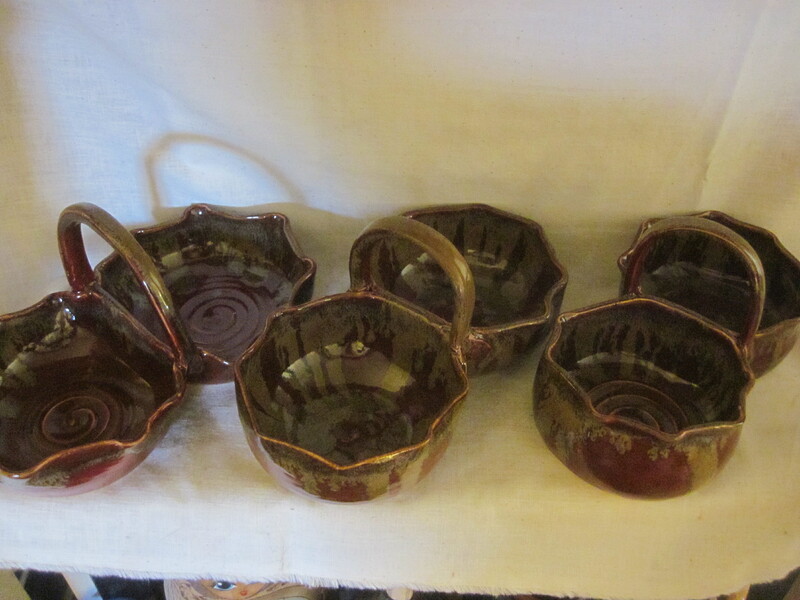 I had a nice firing yesterday and got some great pieces, I am in love with the Majolica style Pitcher and plan to expand the set. 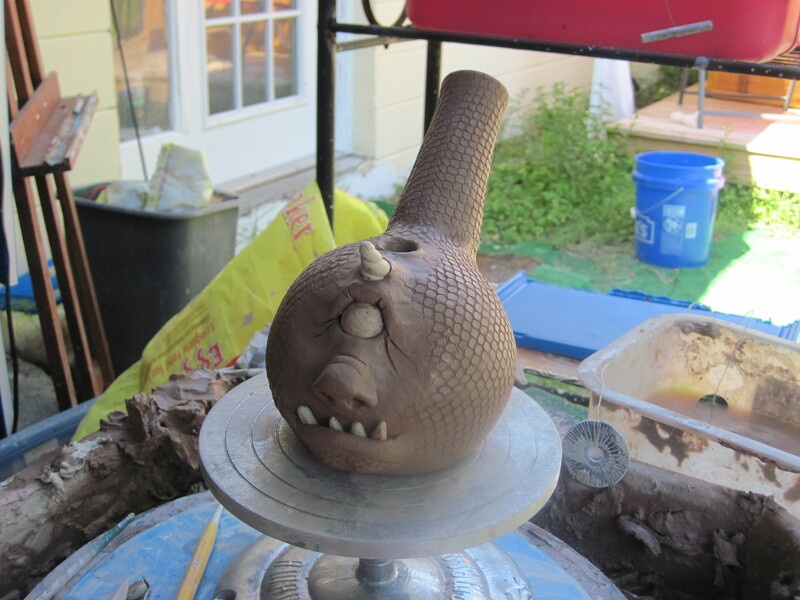 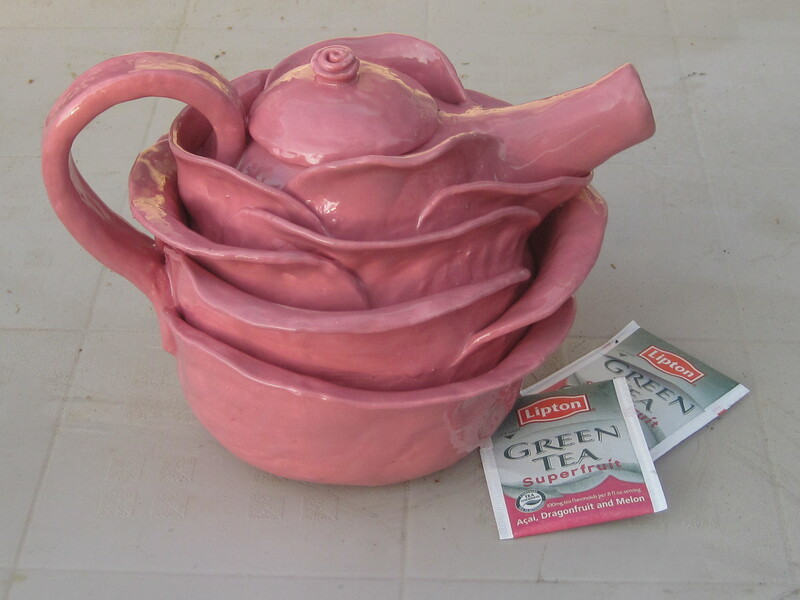 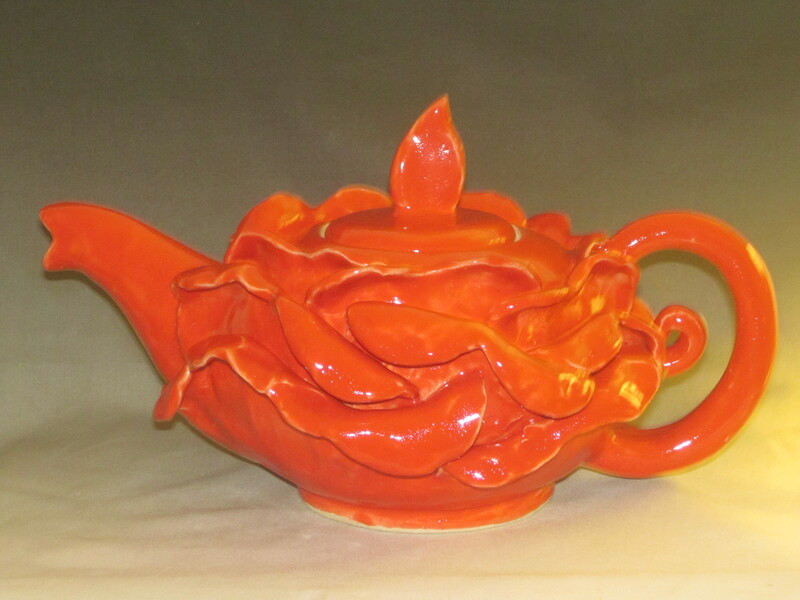 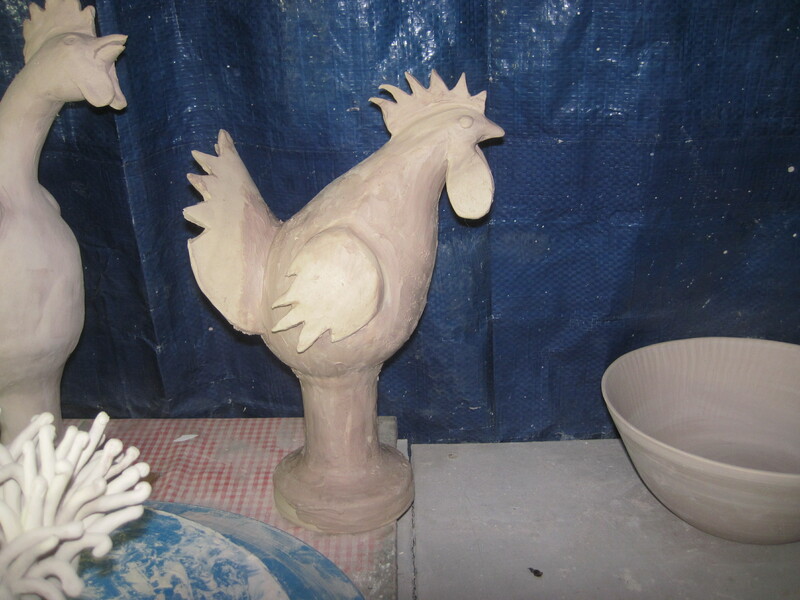 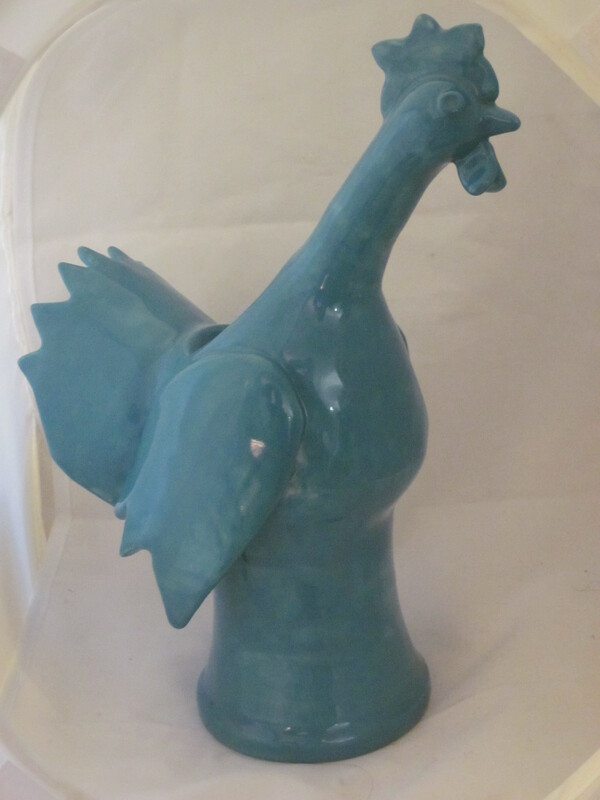 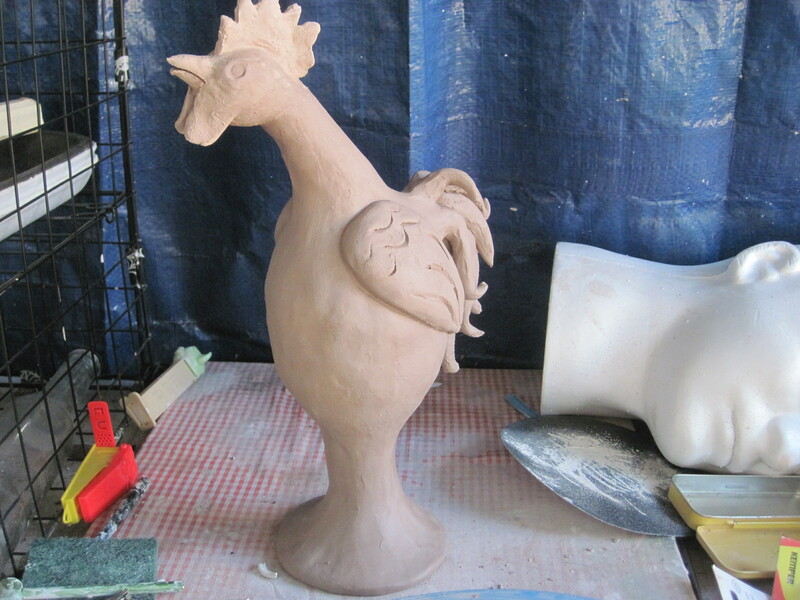 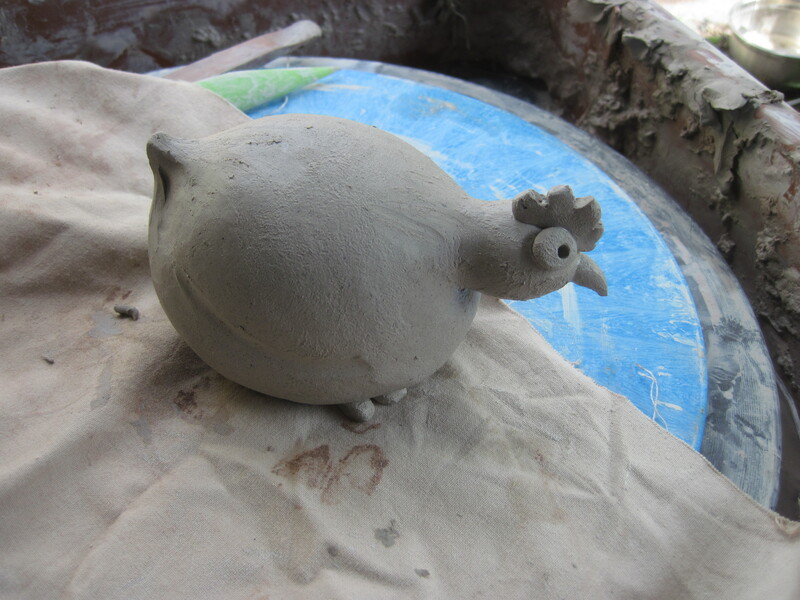 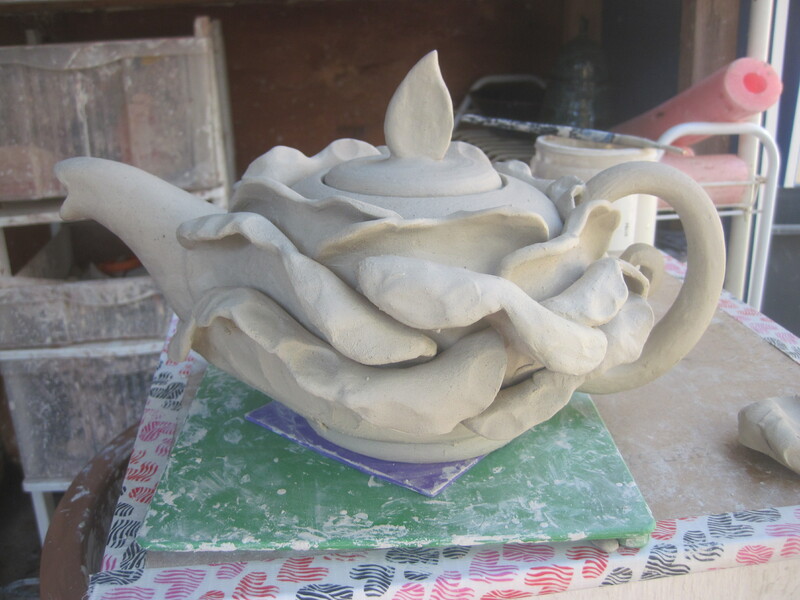 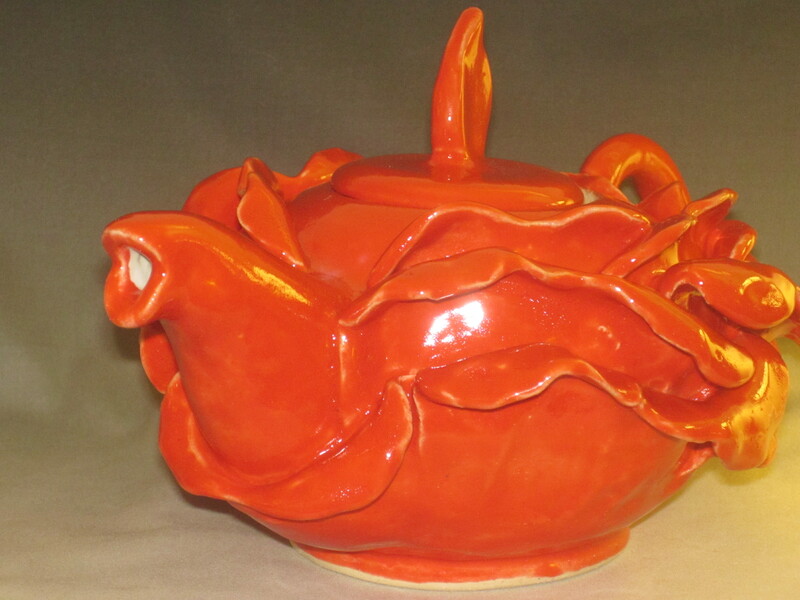 My new teapot, today it will go in the kiln for its glaze fire. 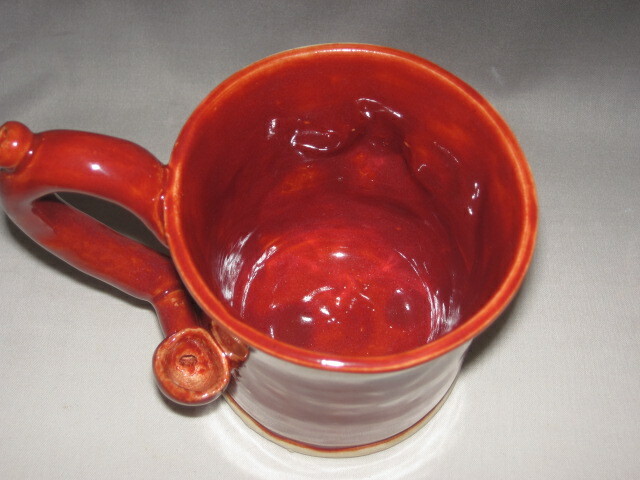 it will be red. 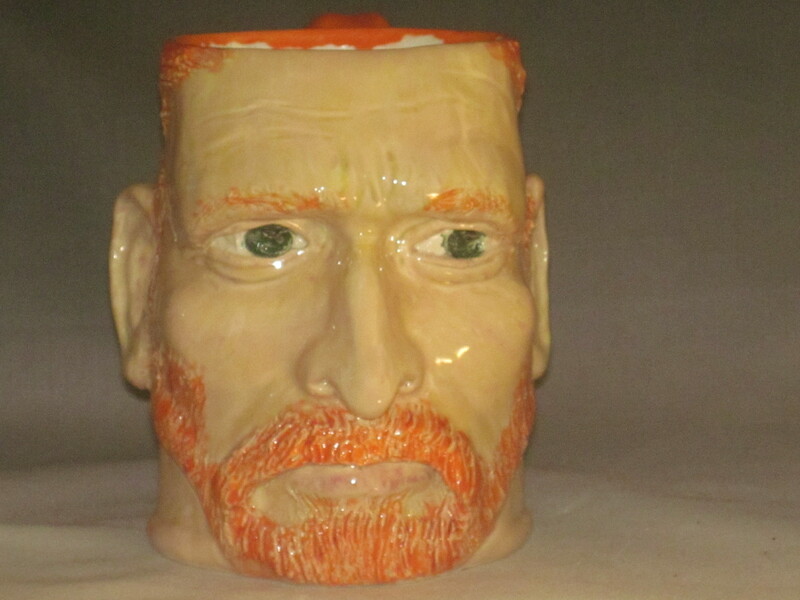 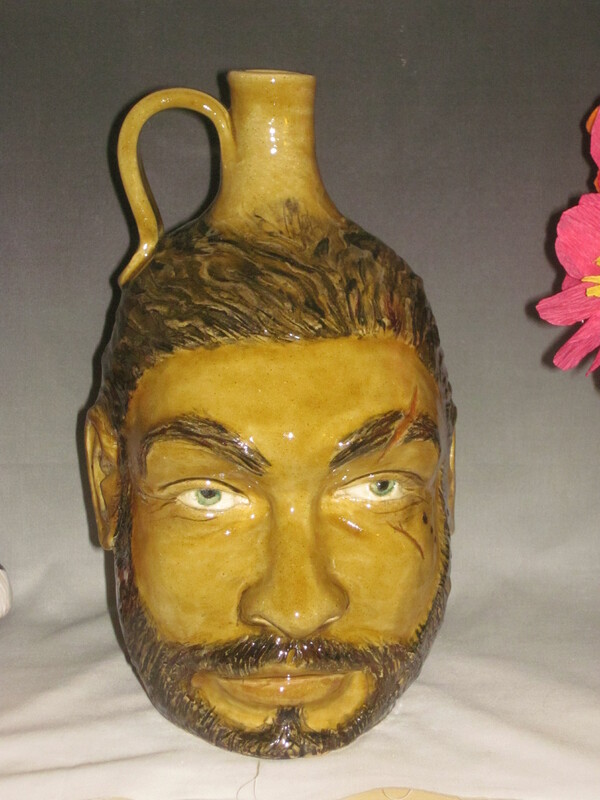 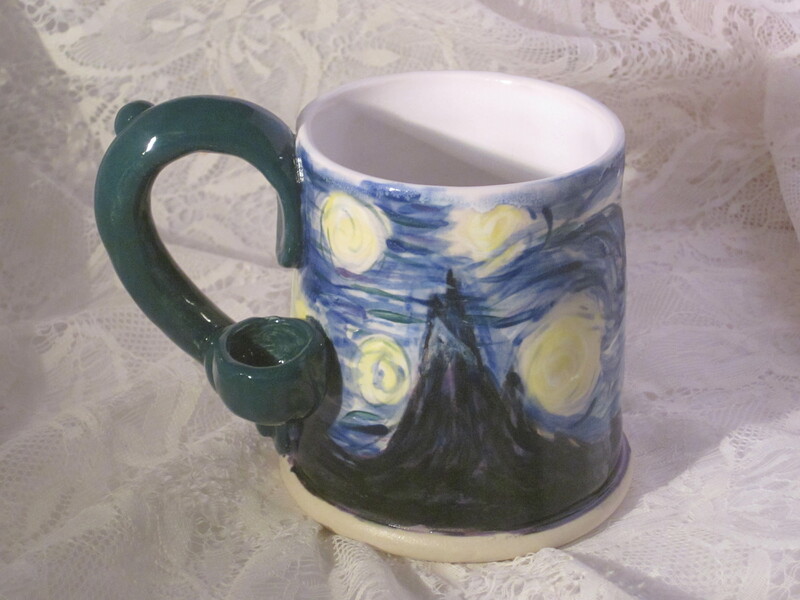 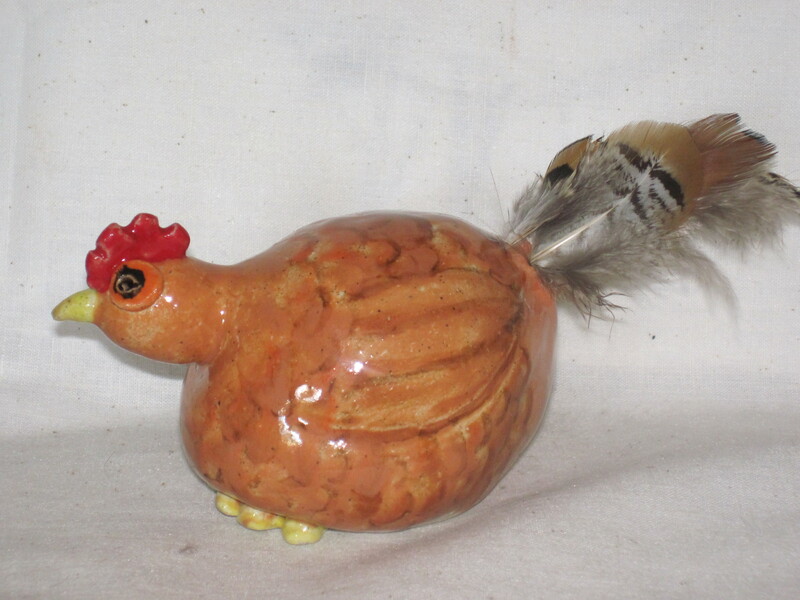 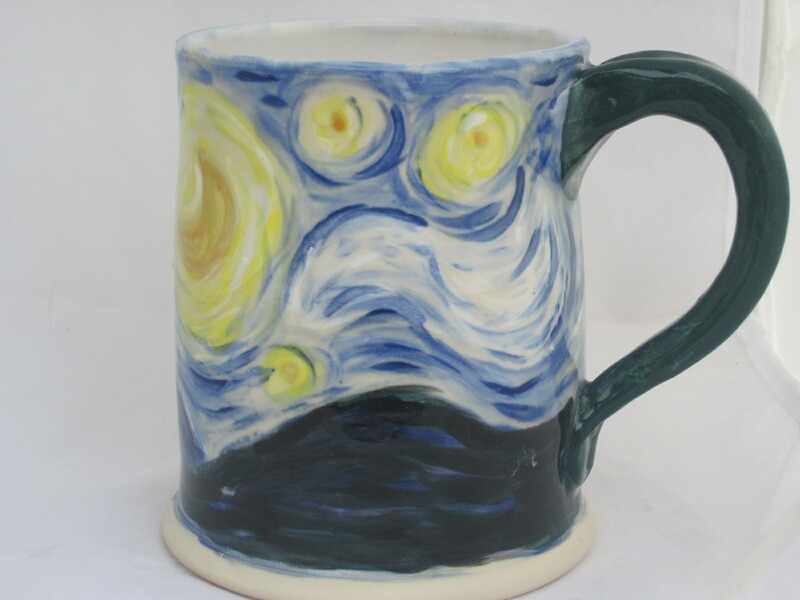 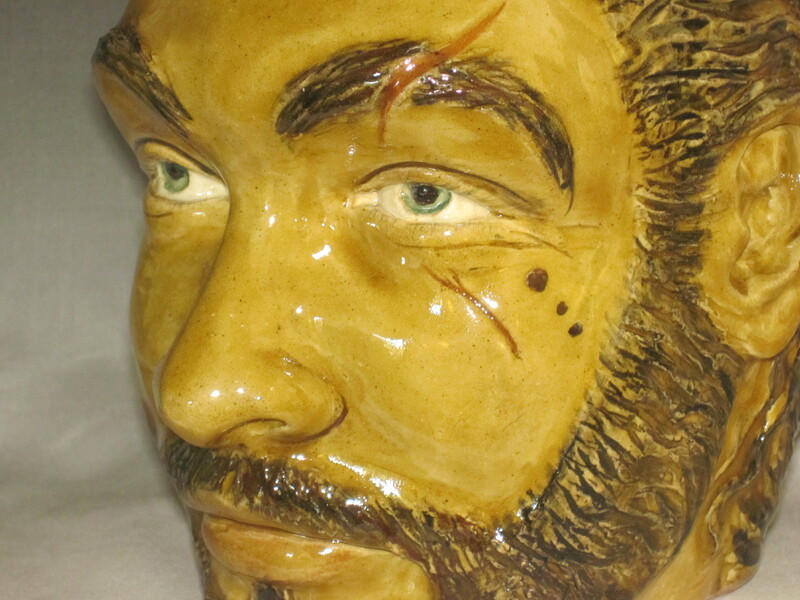 I been working hard at getting more items for my etsy page… Vincent is finished. 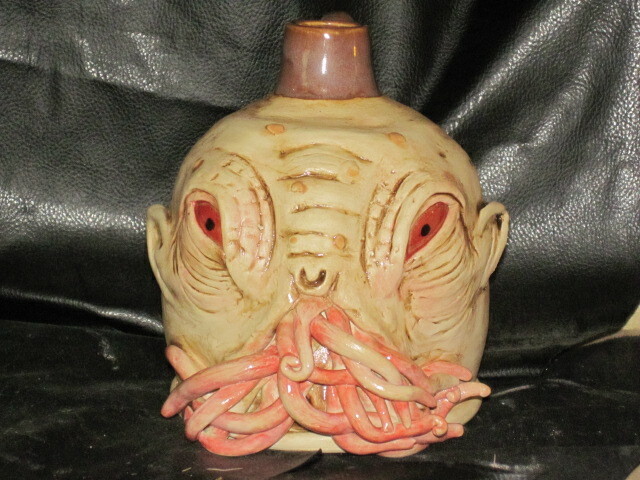 He turned out Great. 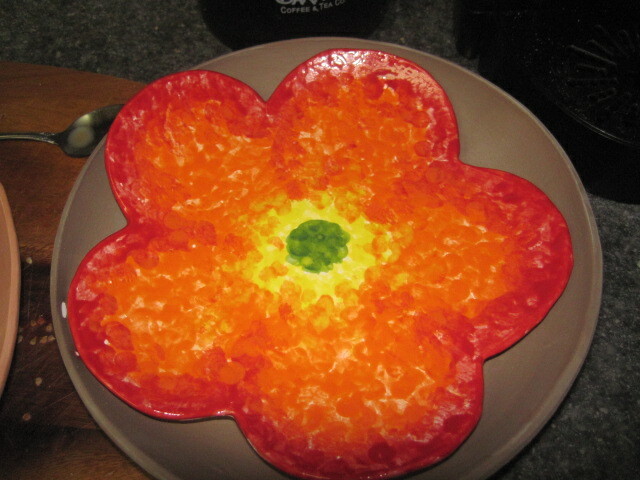 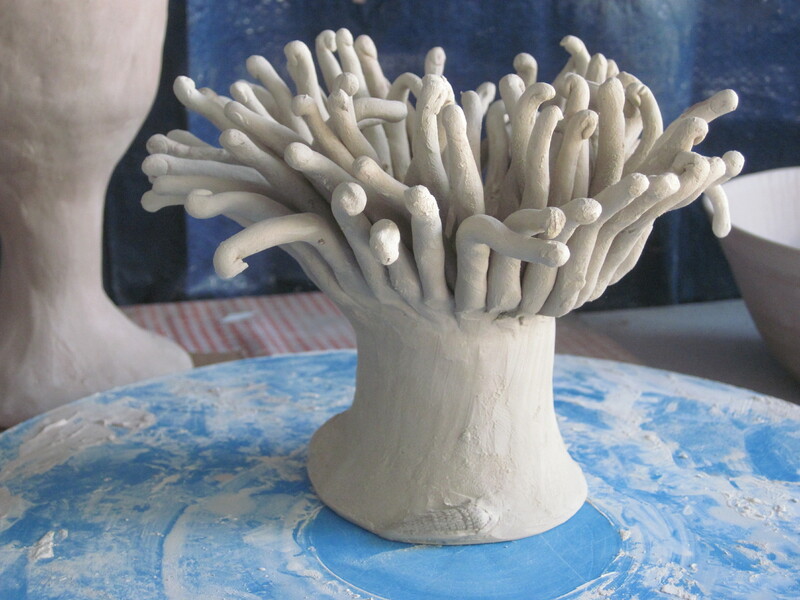 I never posted the finished sea anemone…. 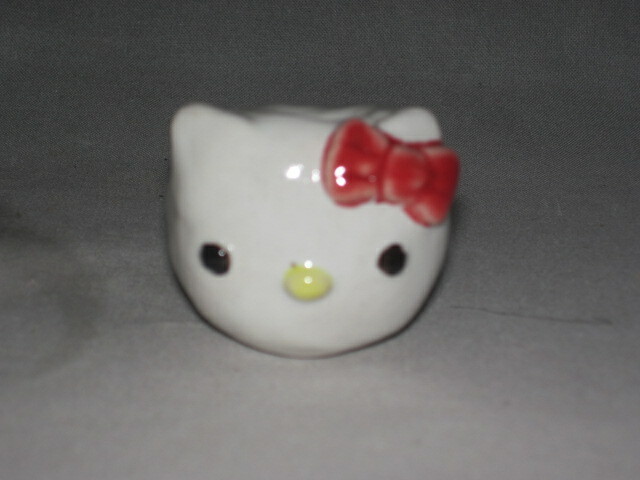 so here she is. 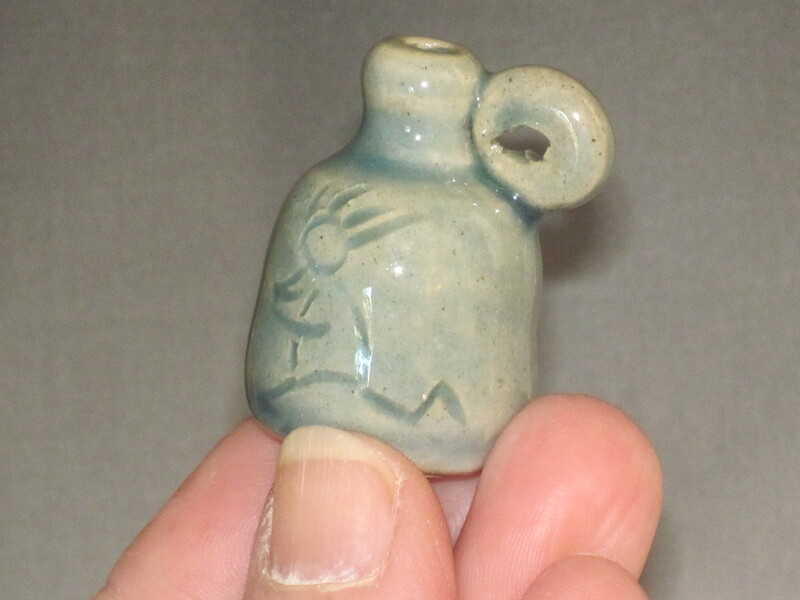 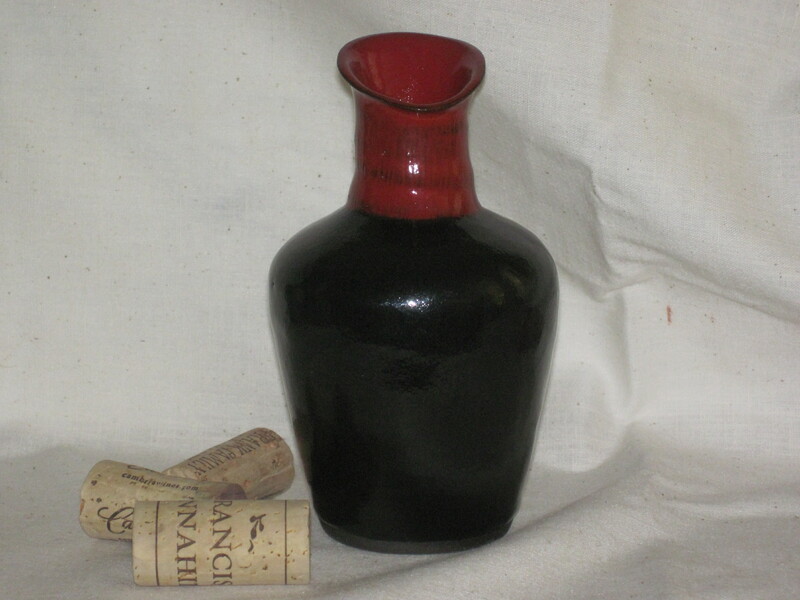 Just finished a small bottle with a swing top lid, 8 oz. 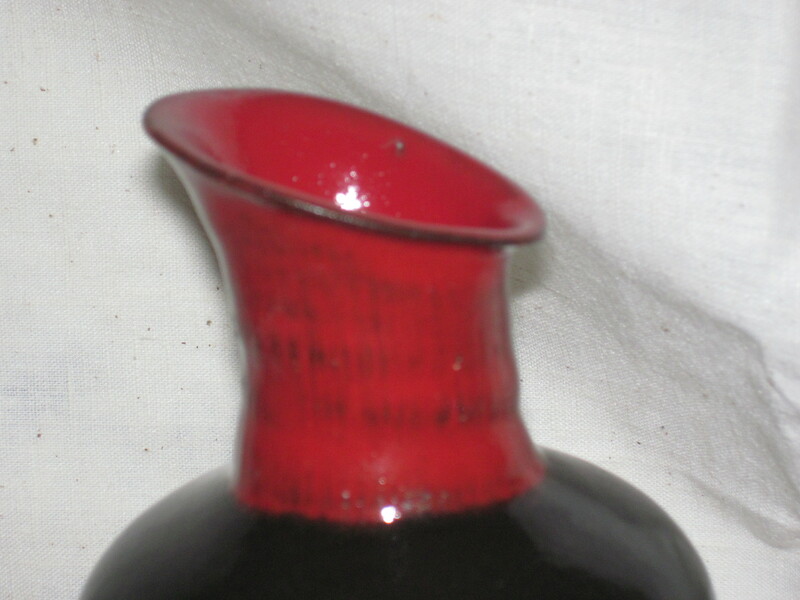 Perfect for olive oil. 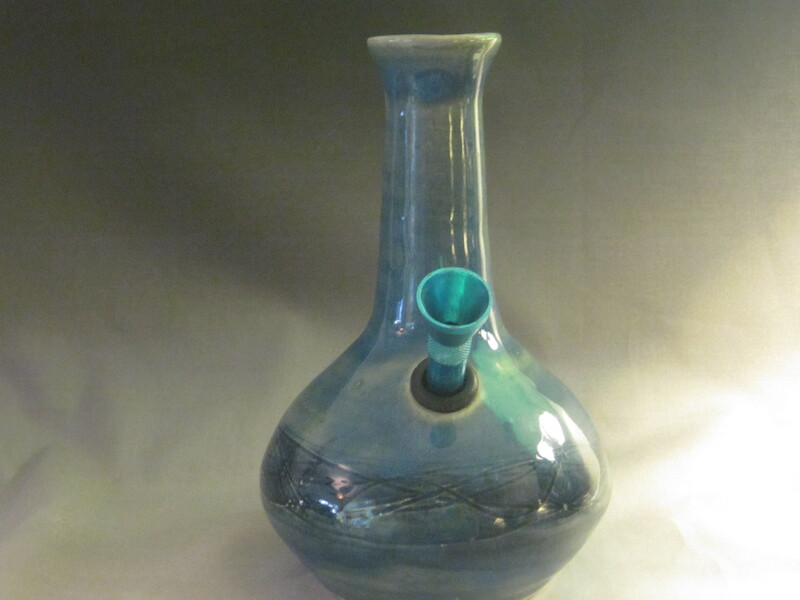 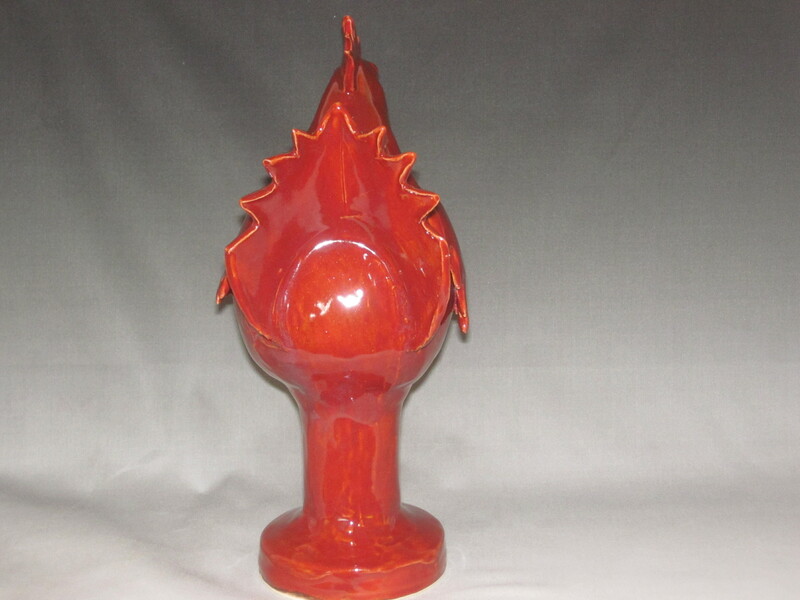 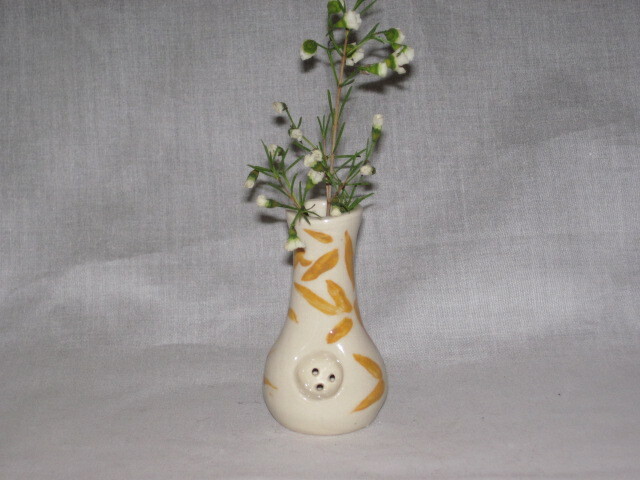 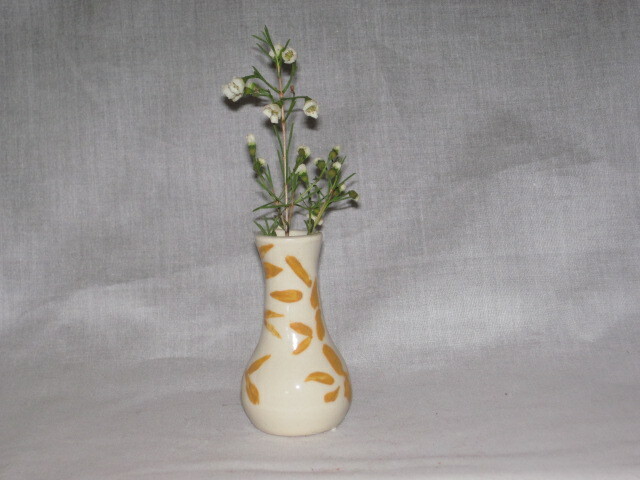 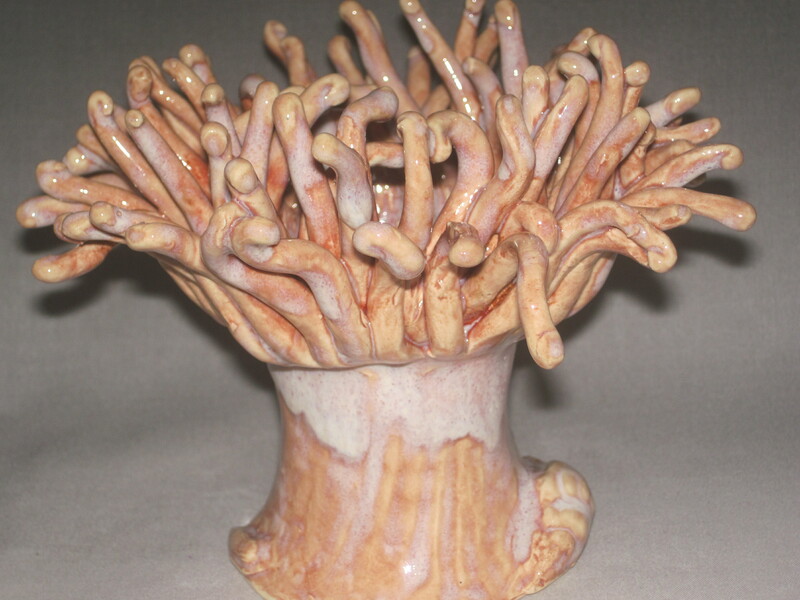 I tried something new recently, the vase was made with the use of sodium silicate applied to the outer wall. 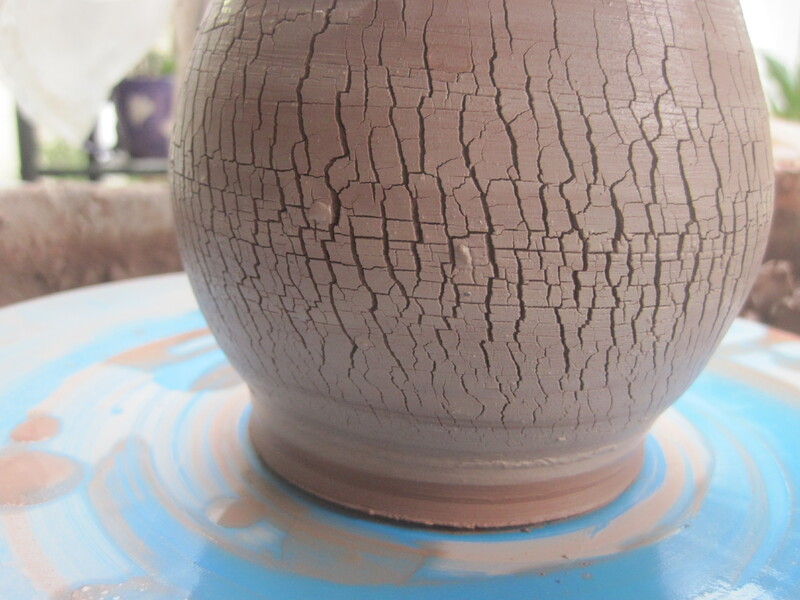 With the application of heat, the process of shaping the wall created the vase’s crackle pattern. 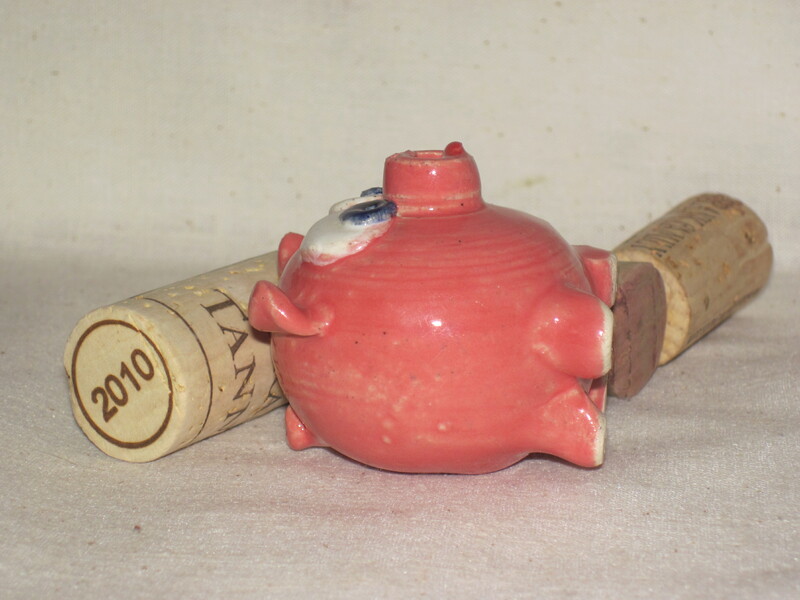 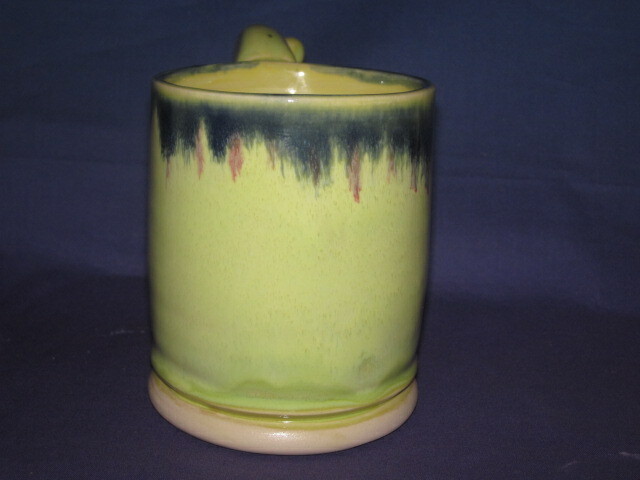 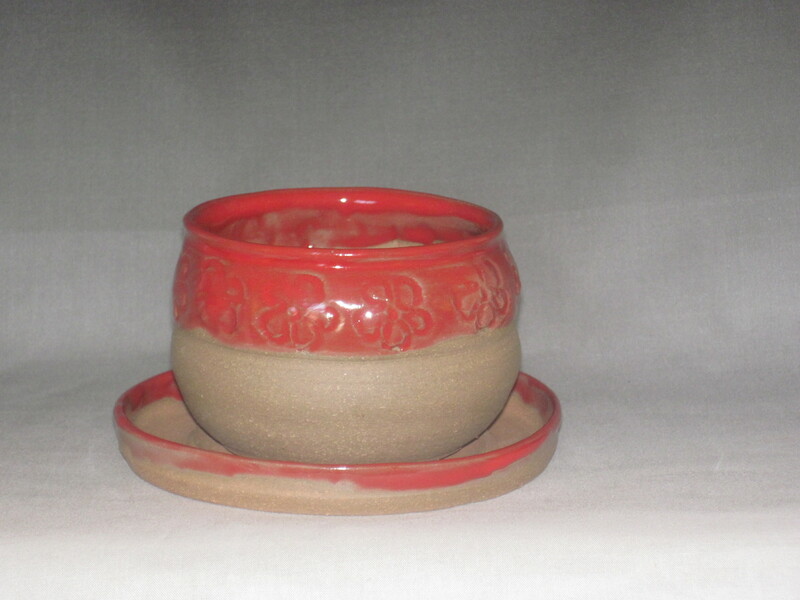 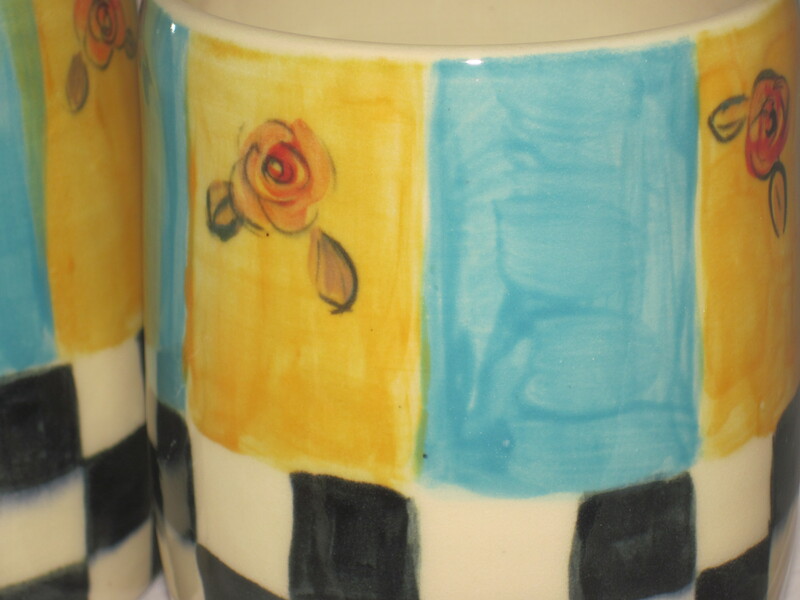 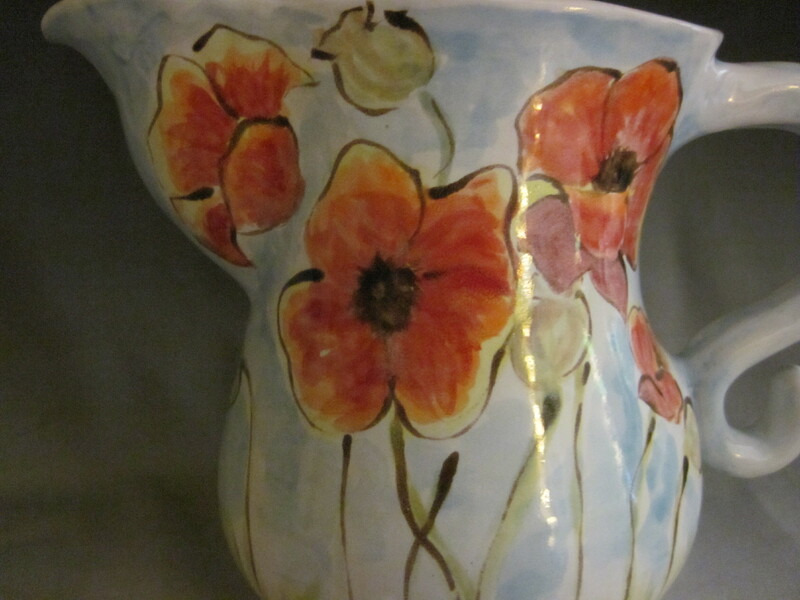 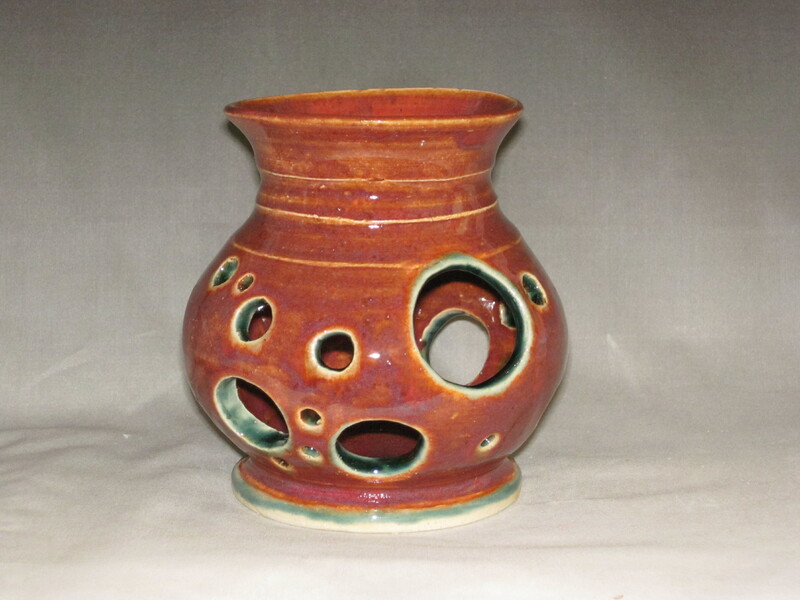 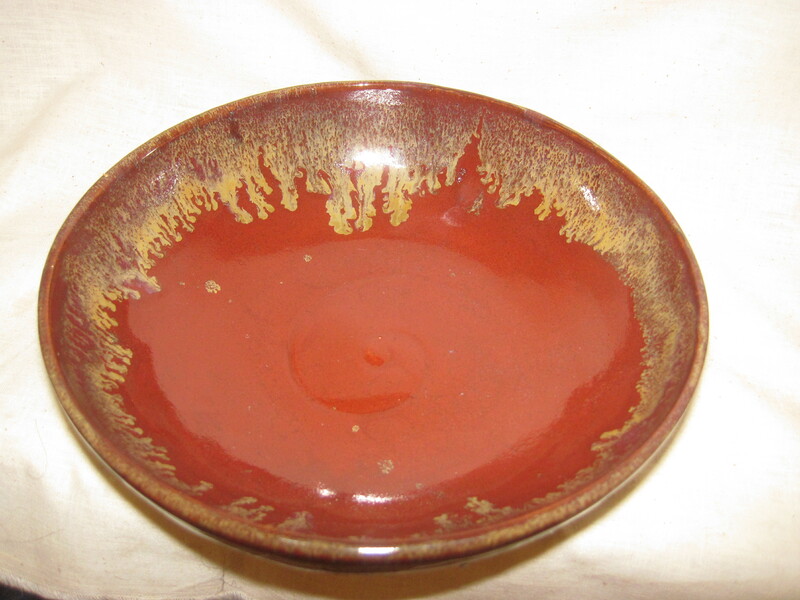 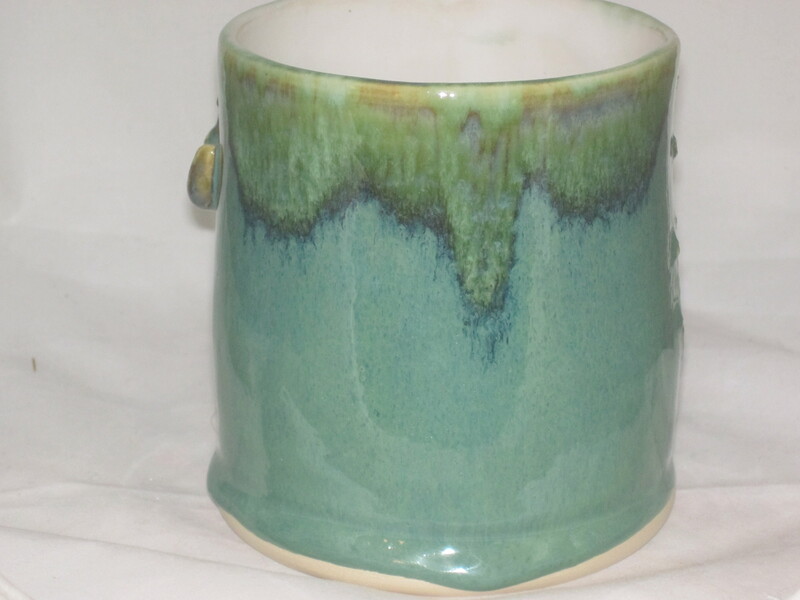 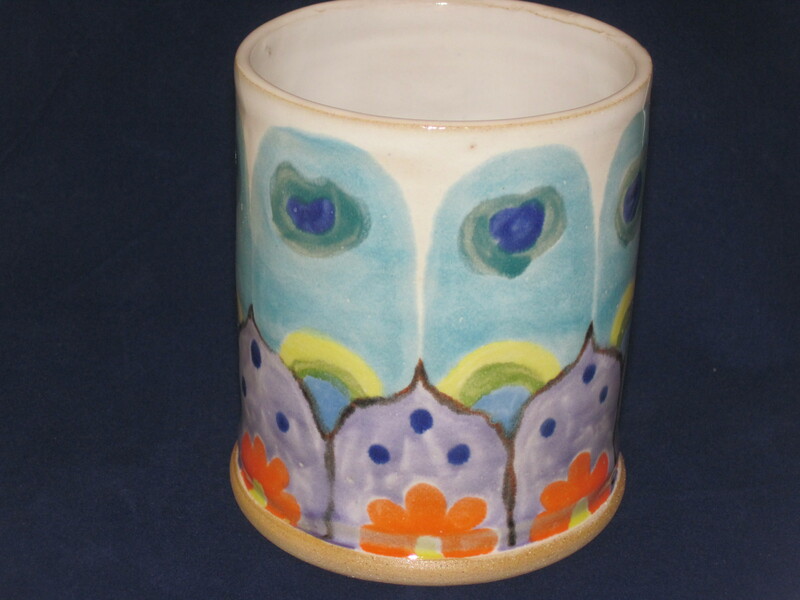 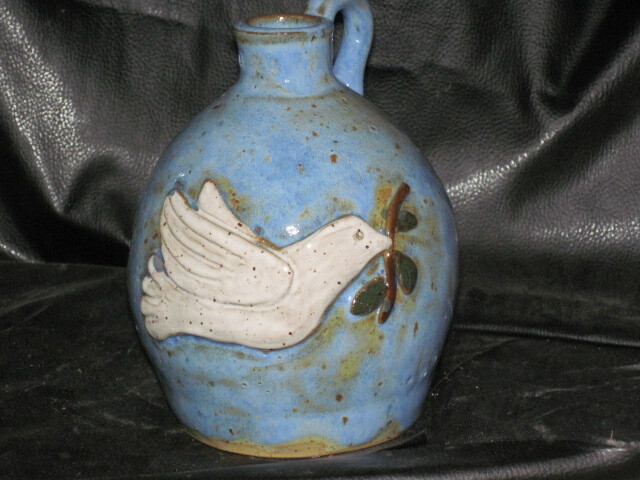 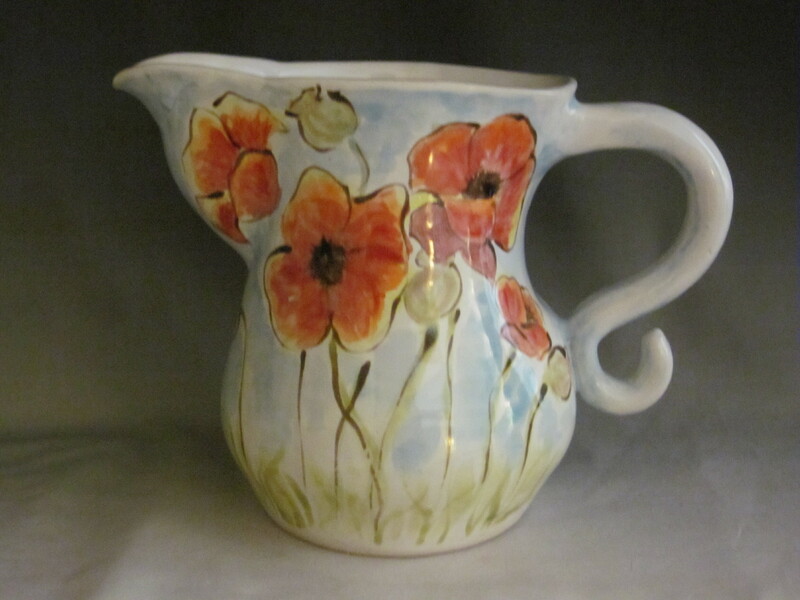 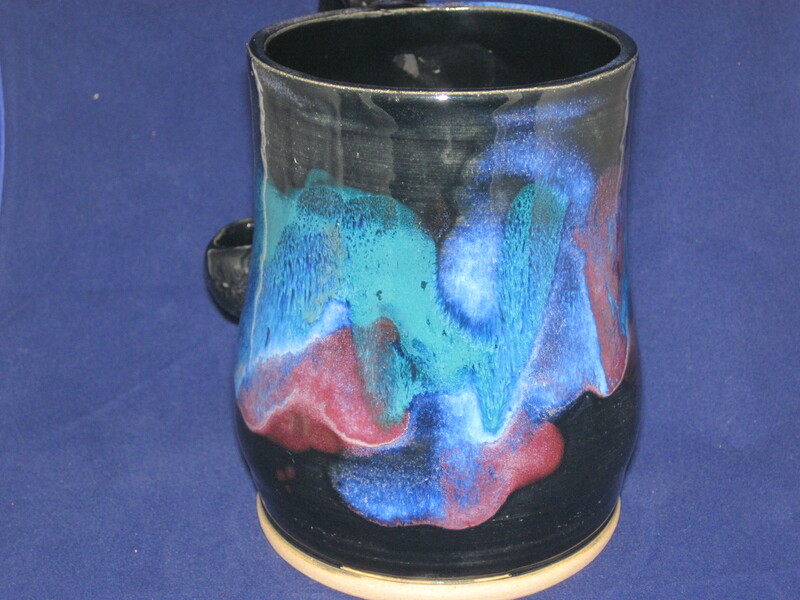 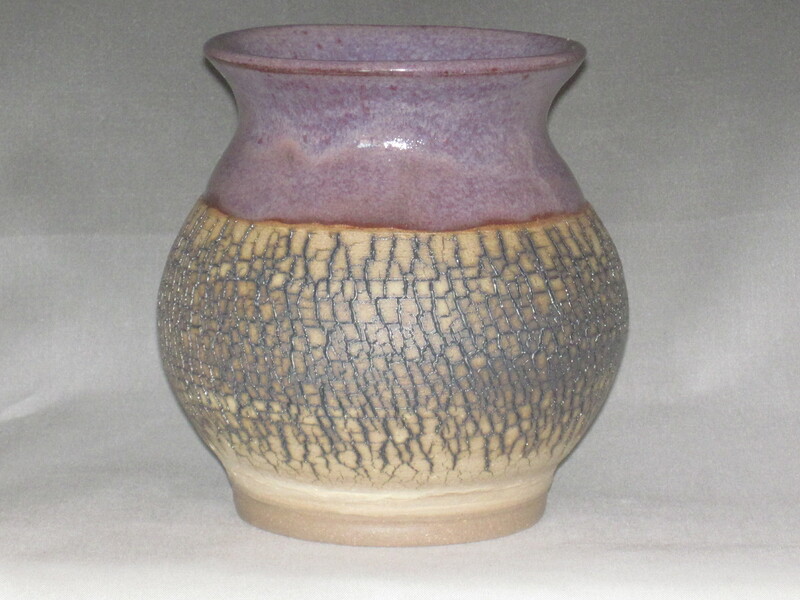 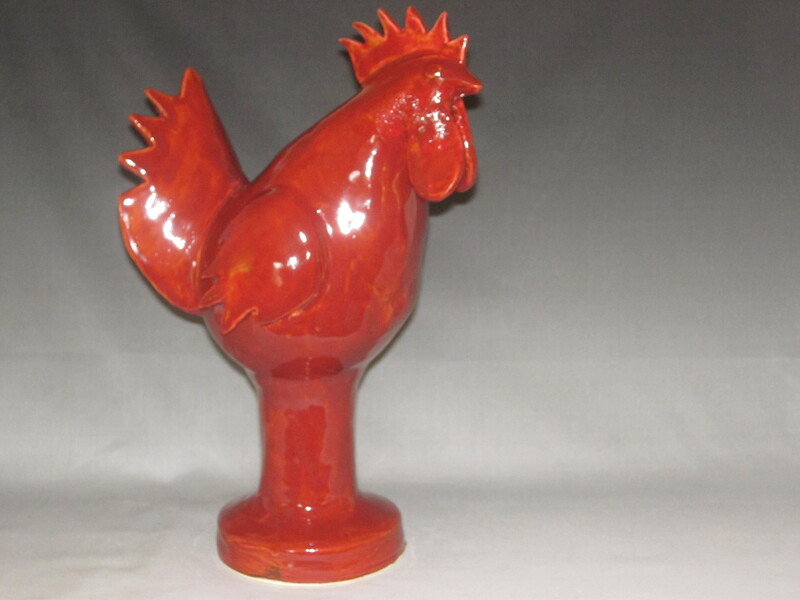 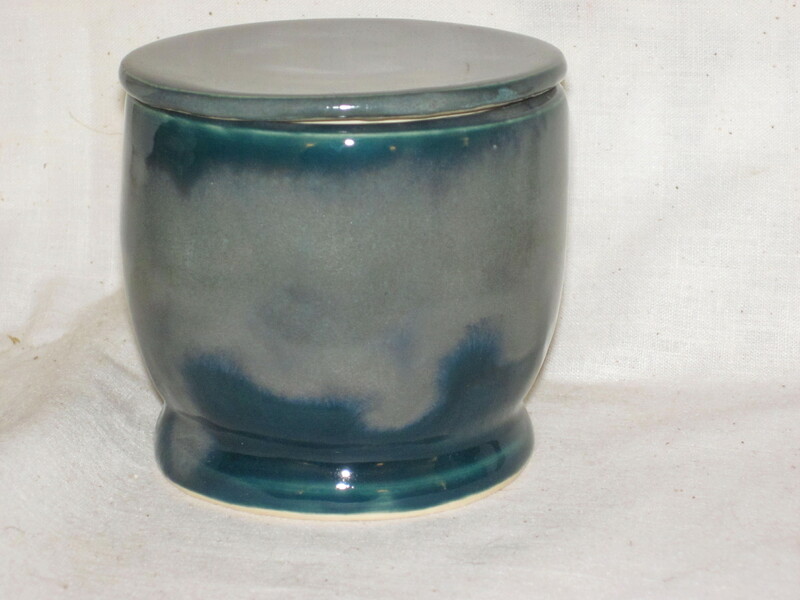 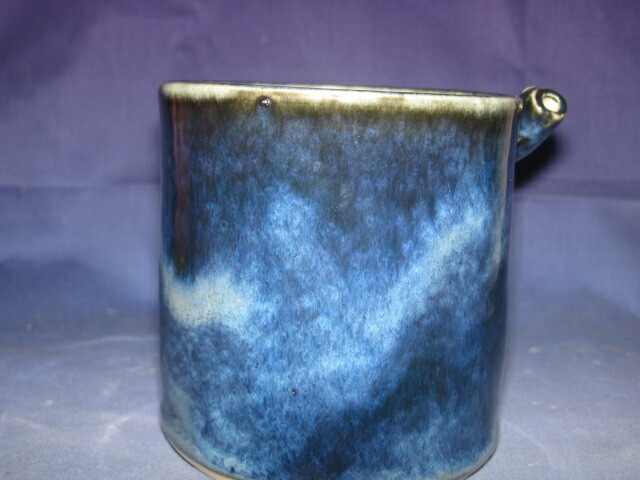 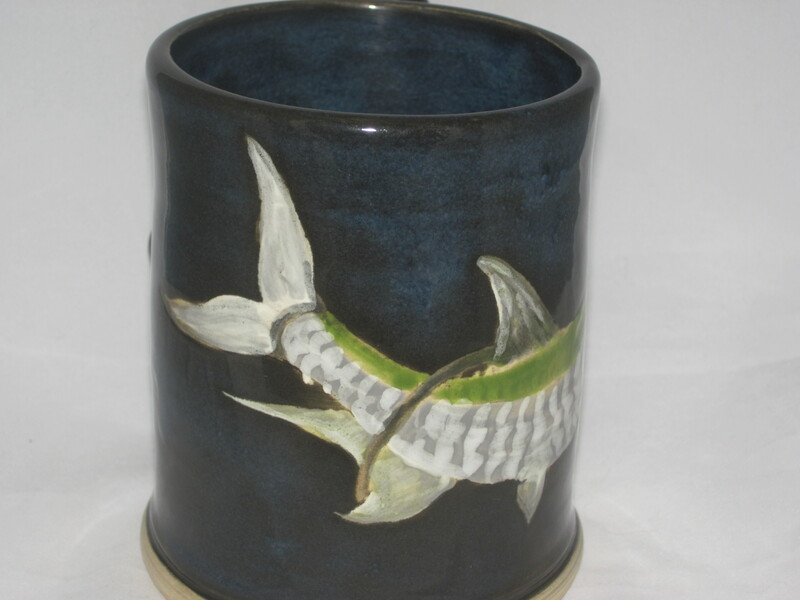 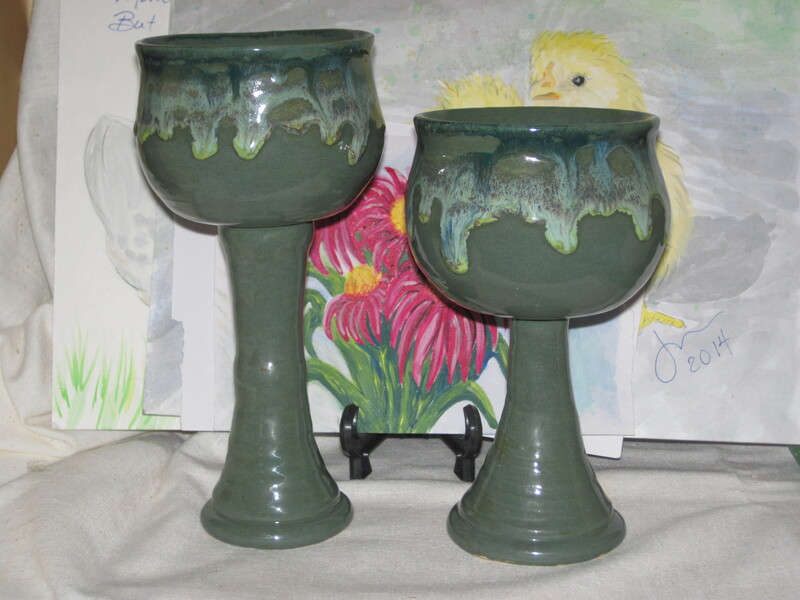 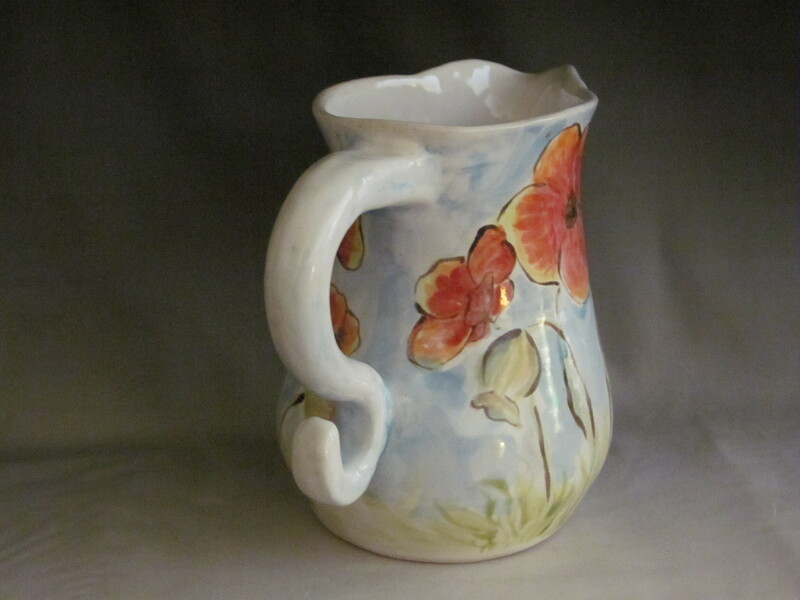 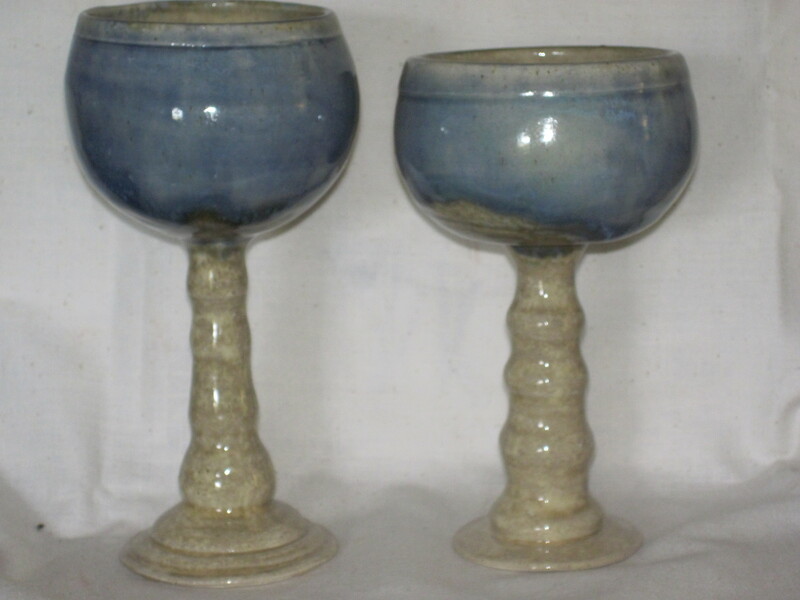 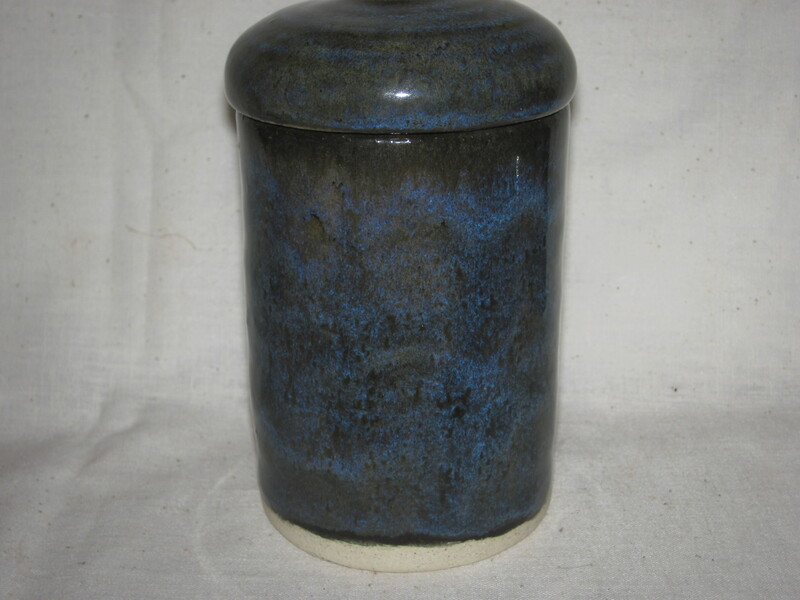 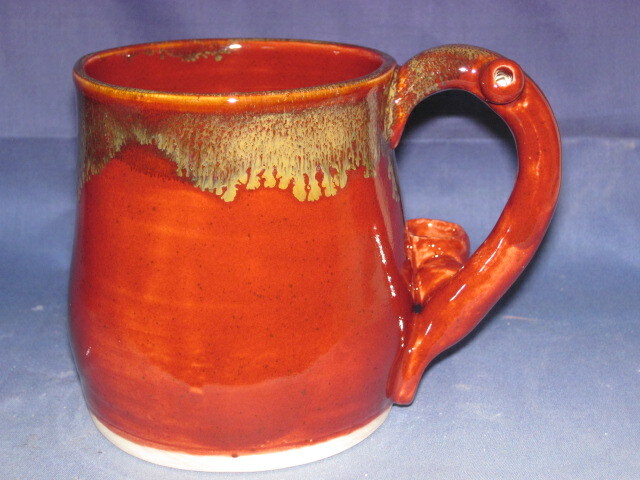 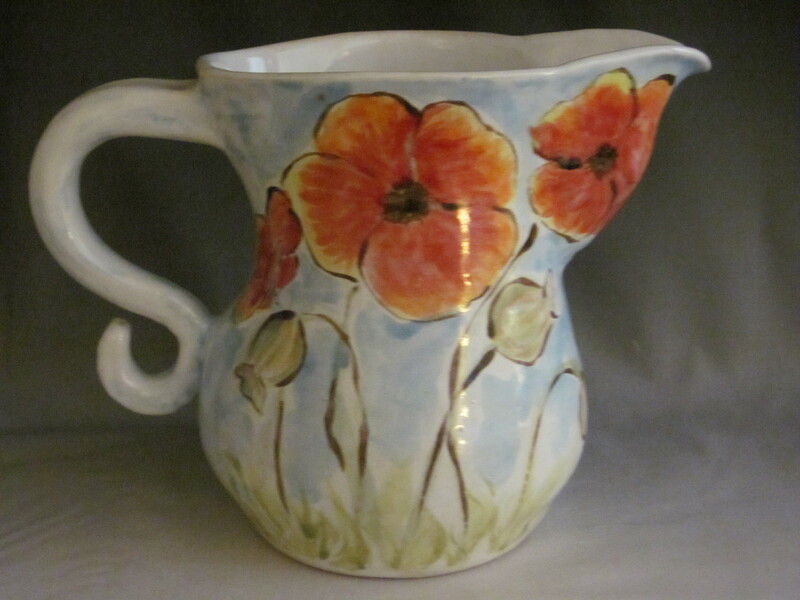 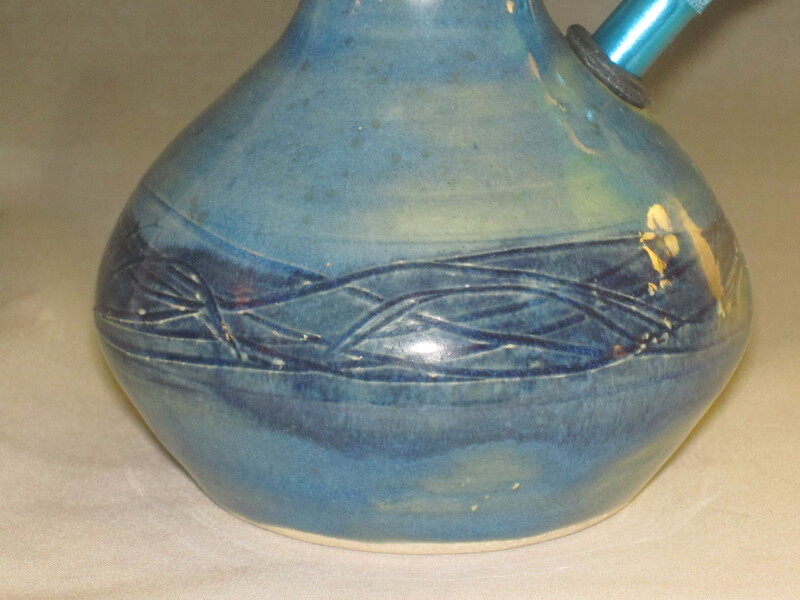 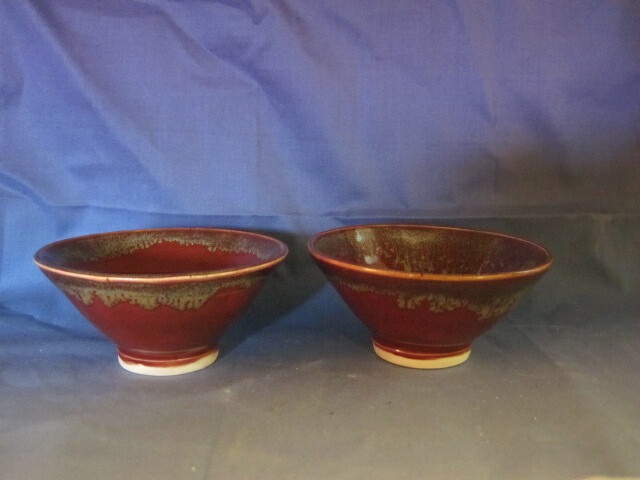 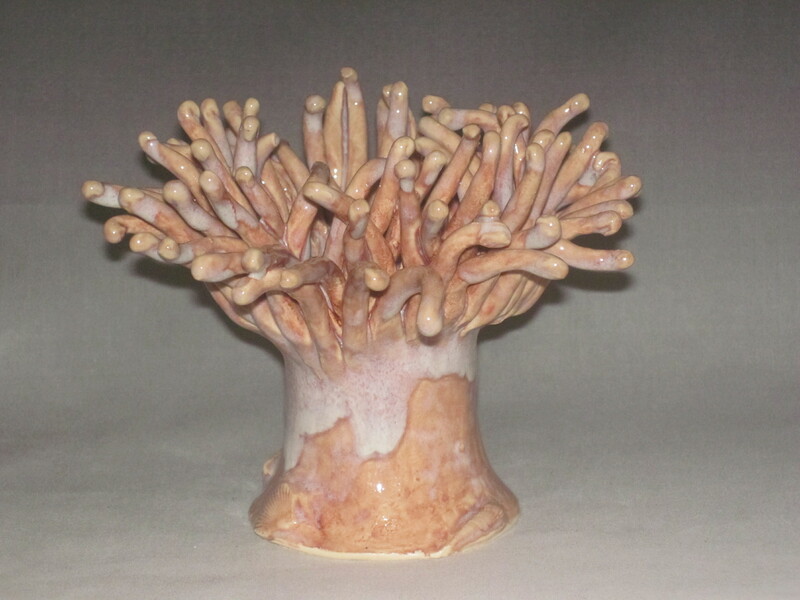 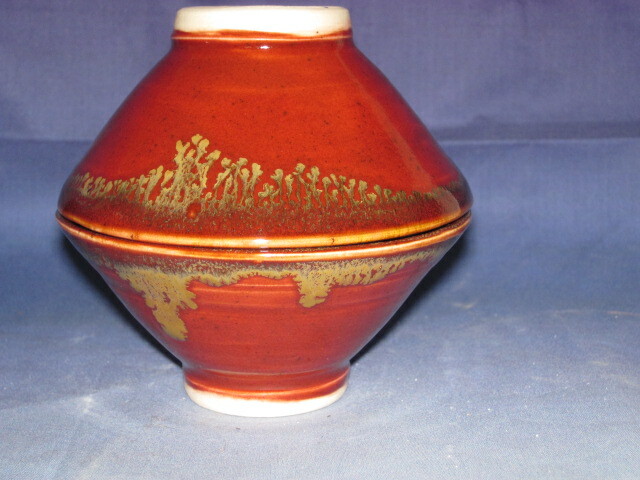 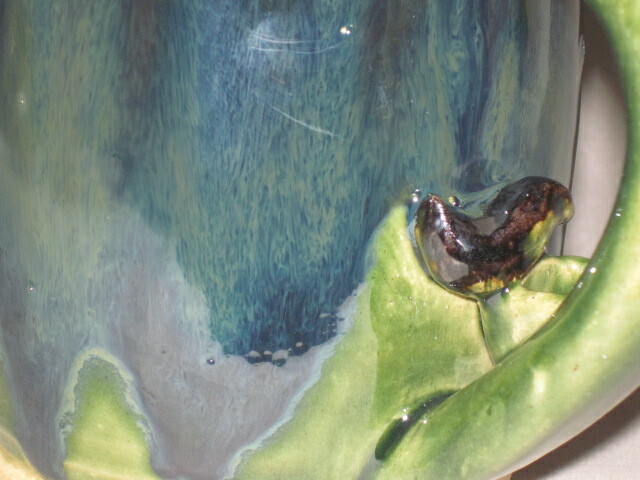 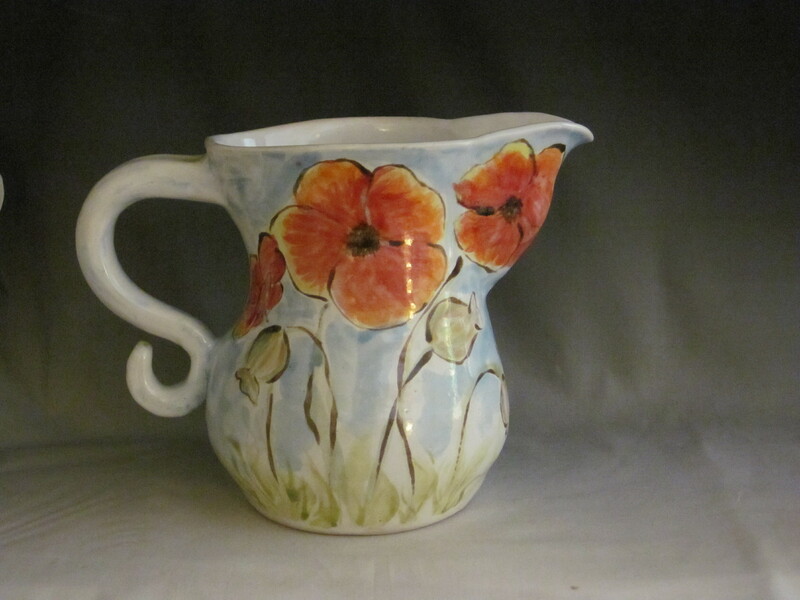 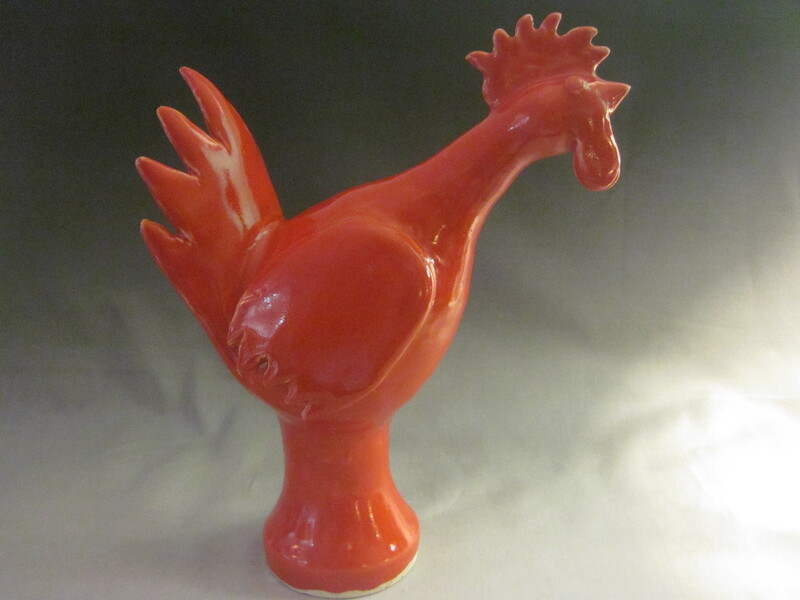 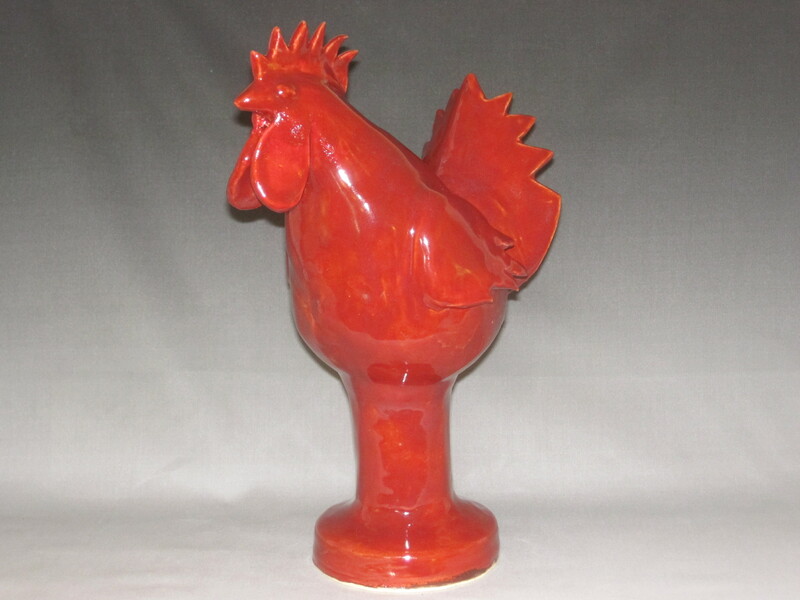 The vase was fired and then treated with a copper wash to enhance the cracks and glazed on the top rim. 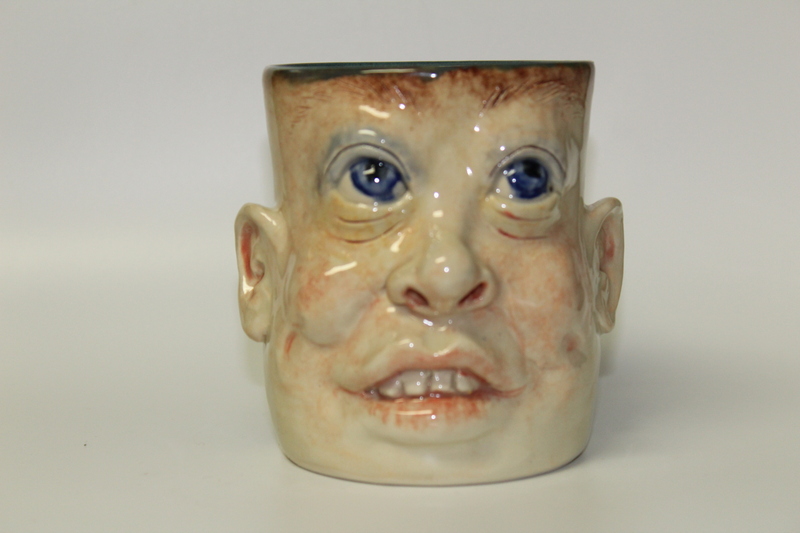 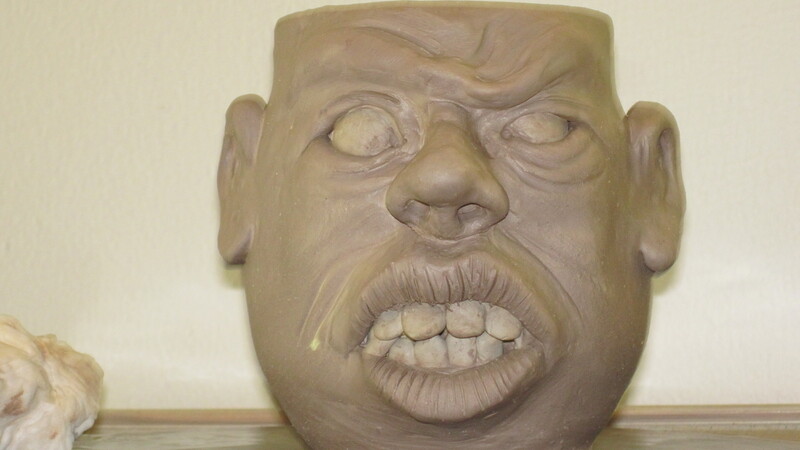 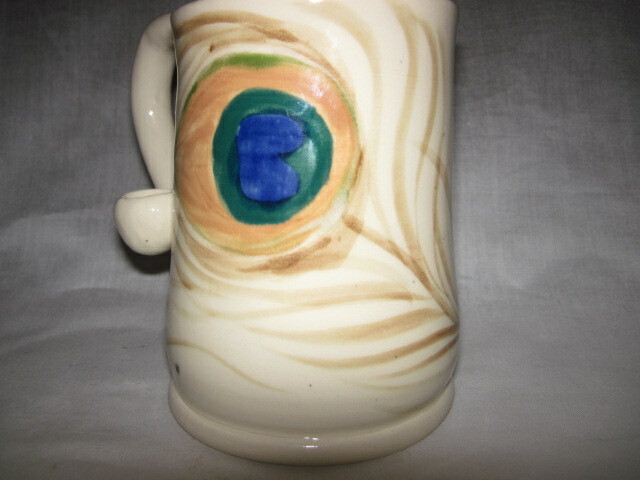 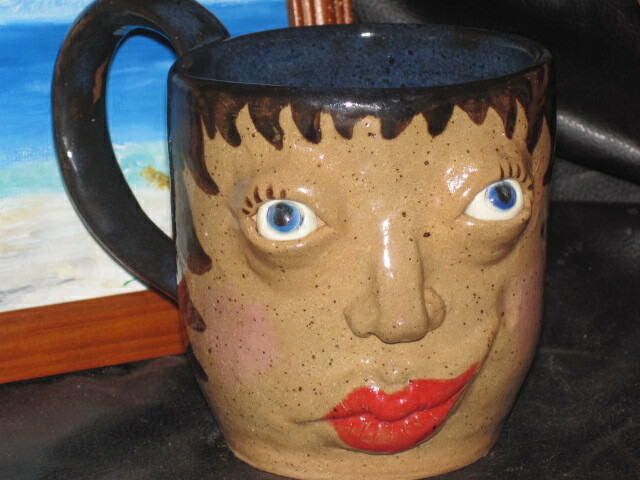 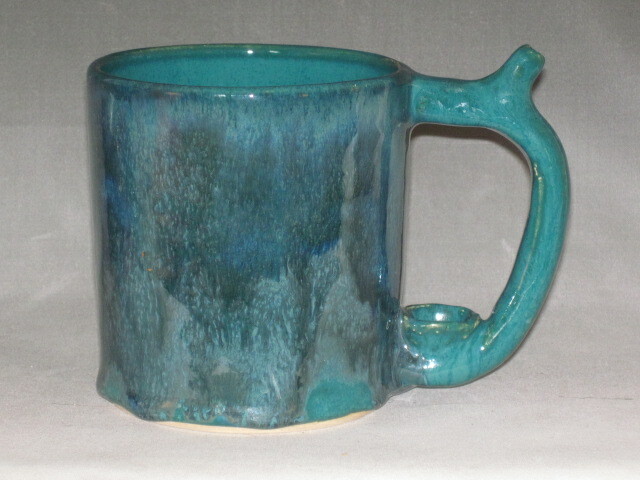 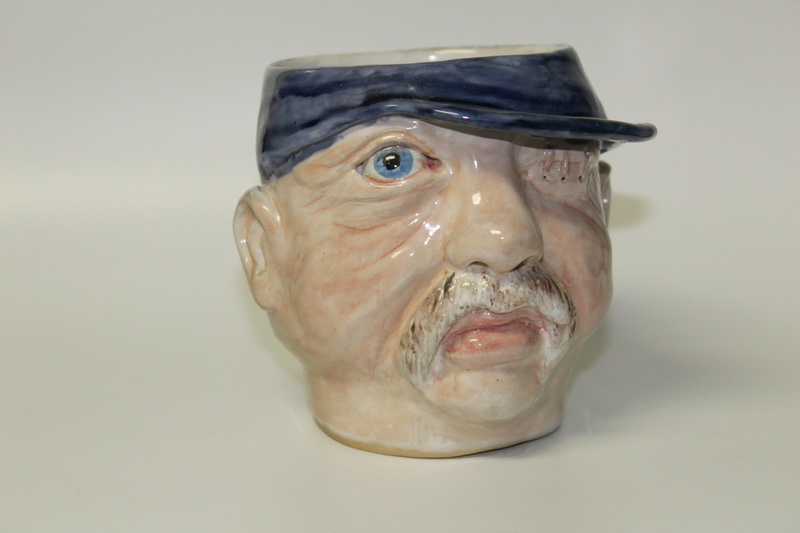 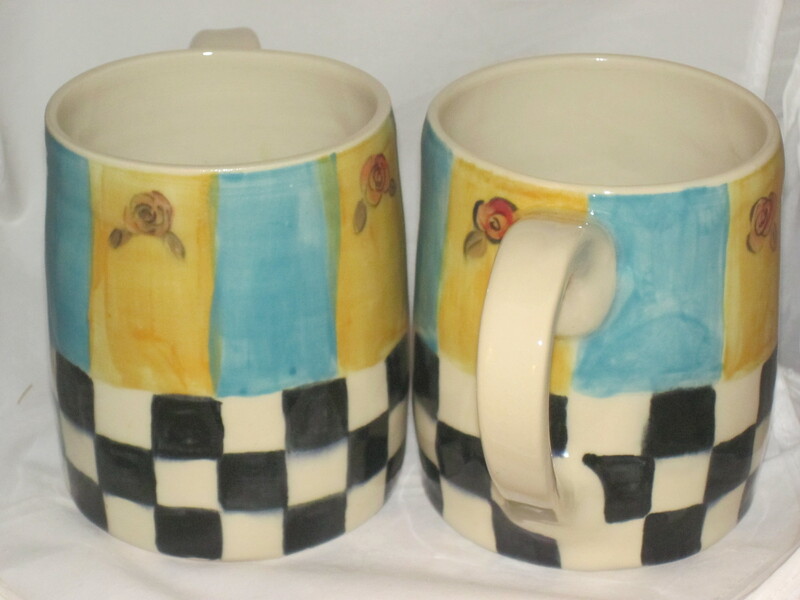 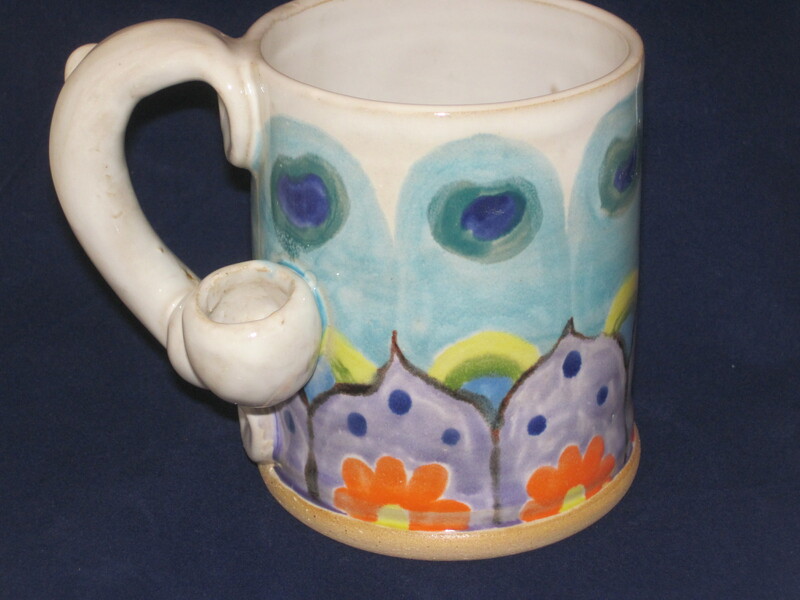 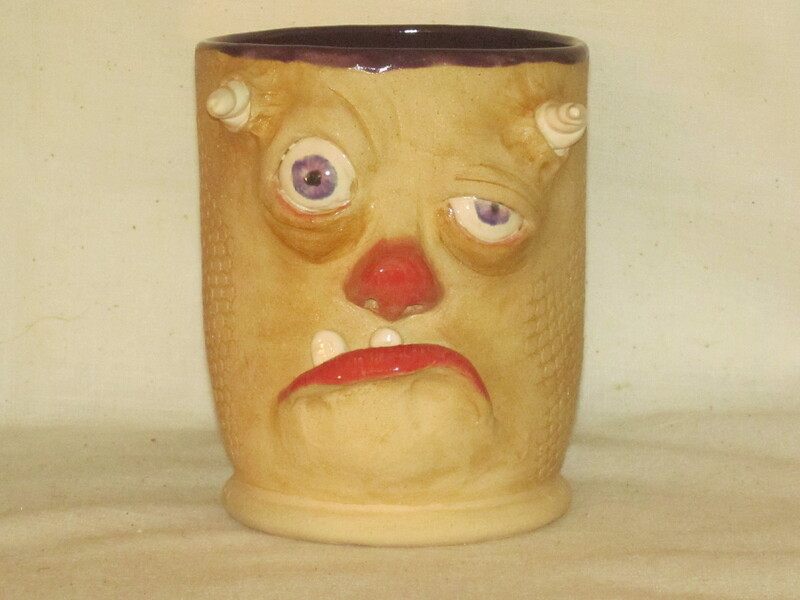 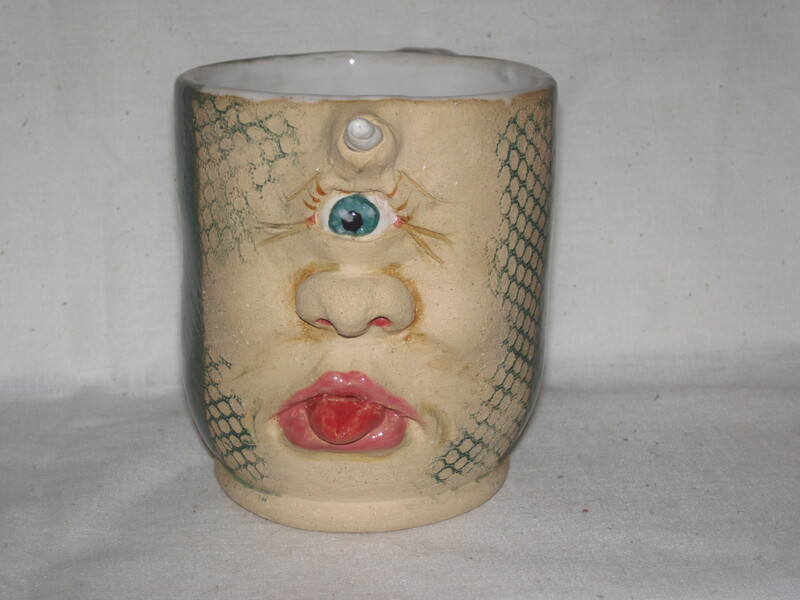 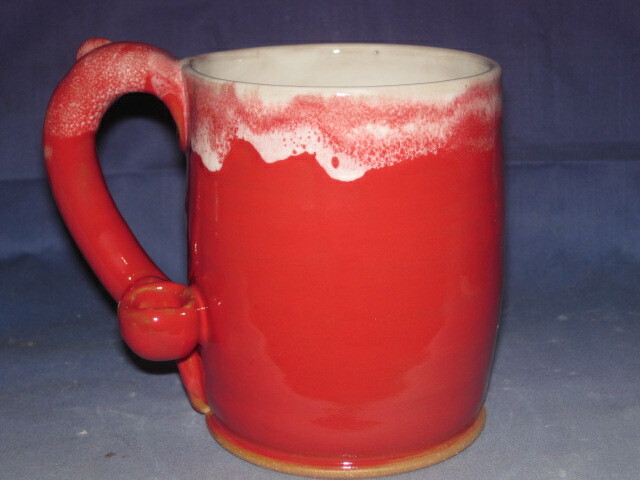 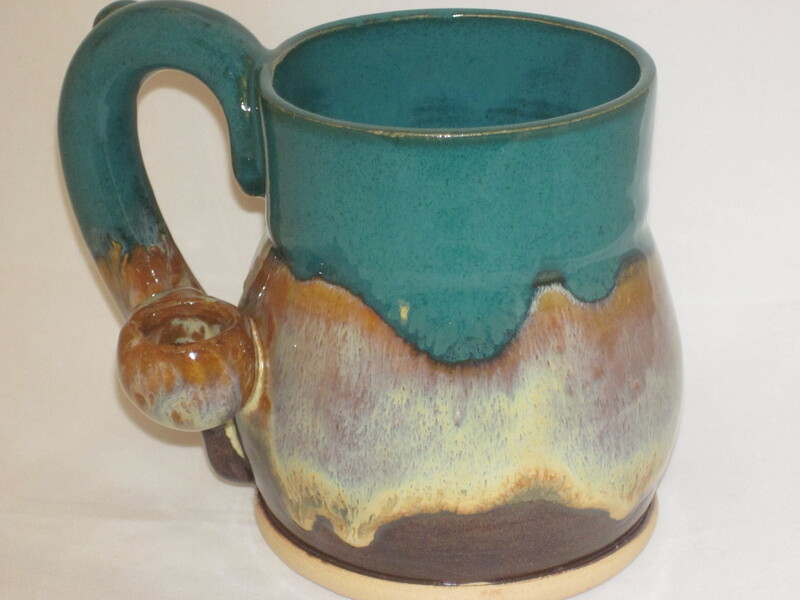 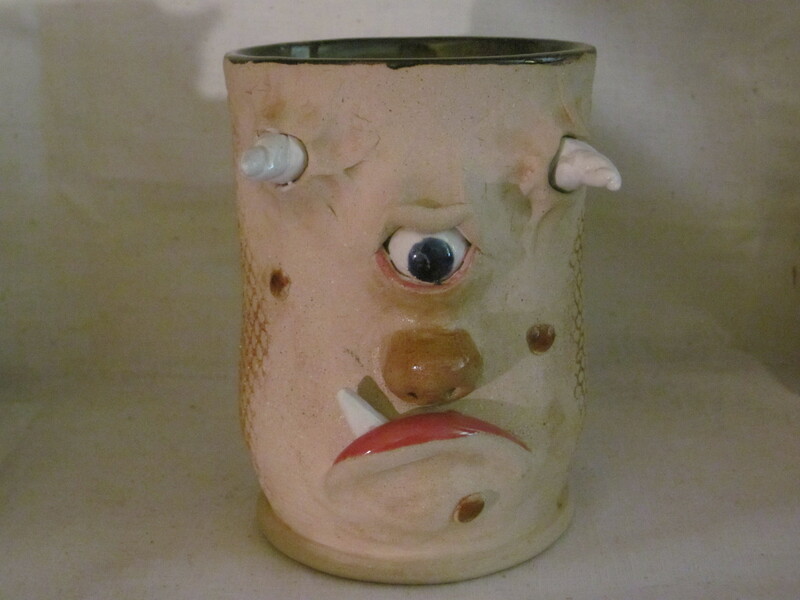 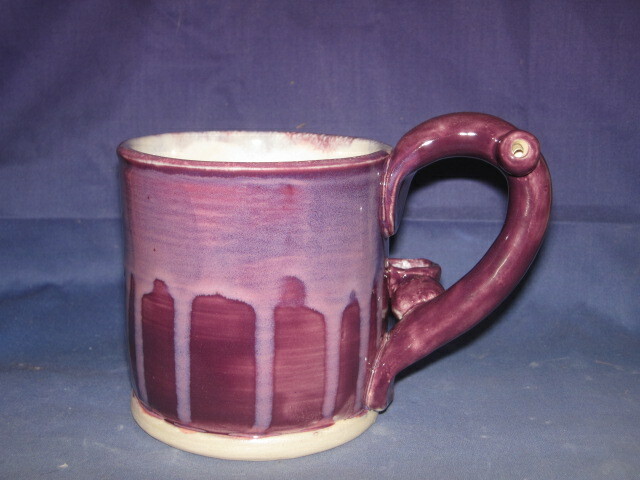 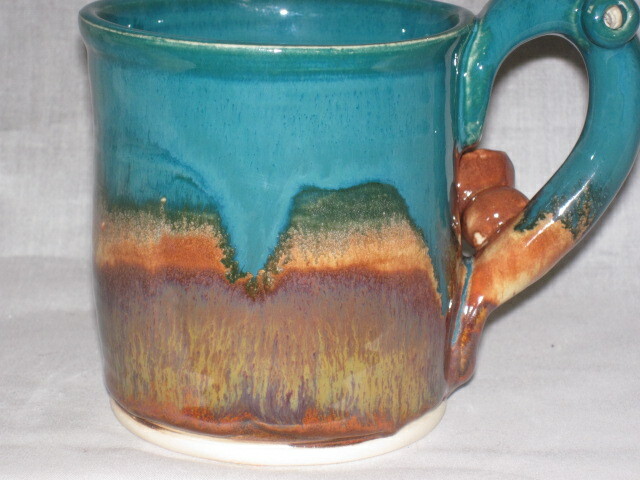 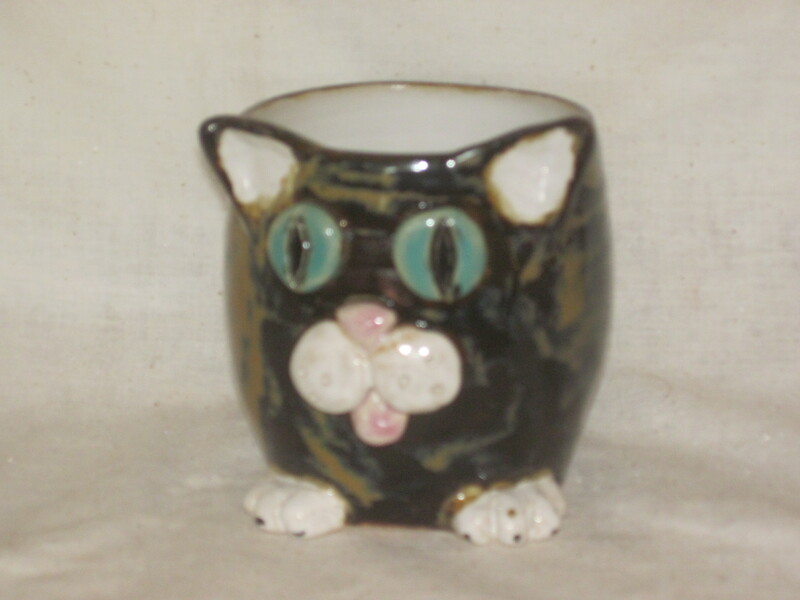 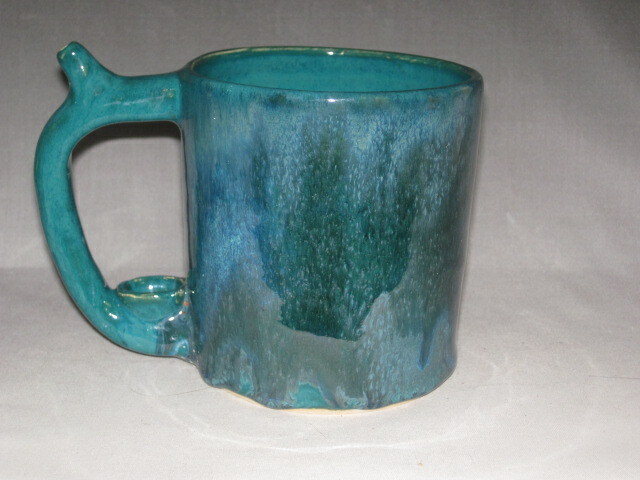 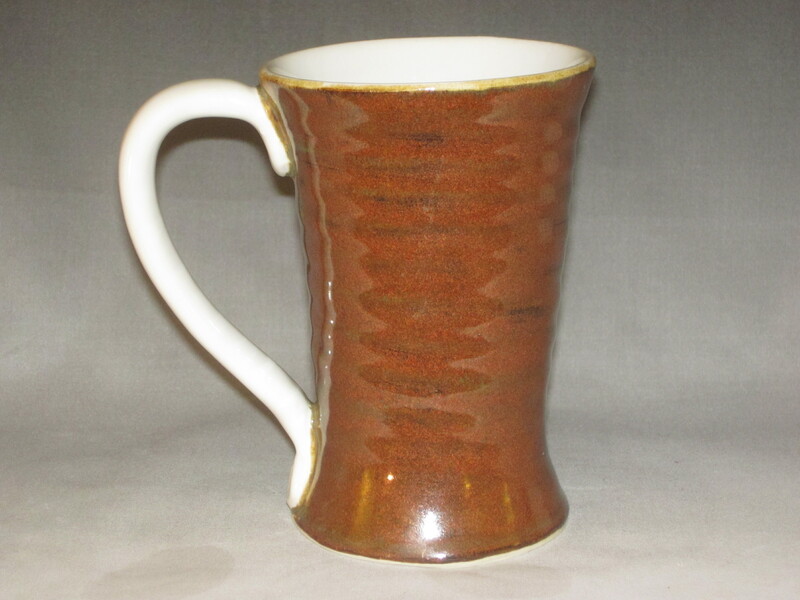 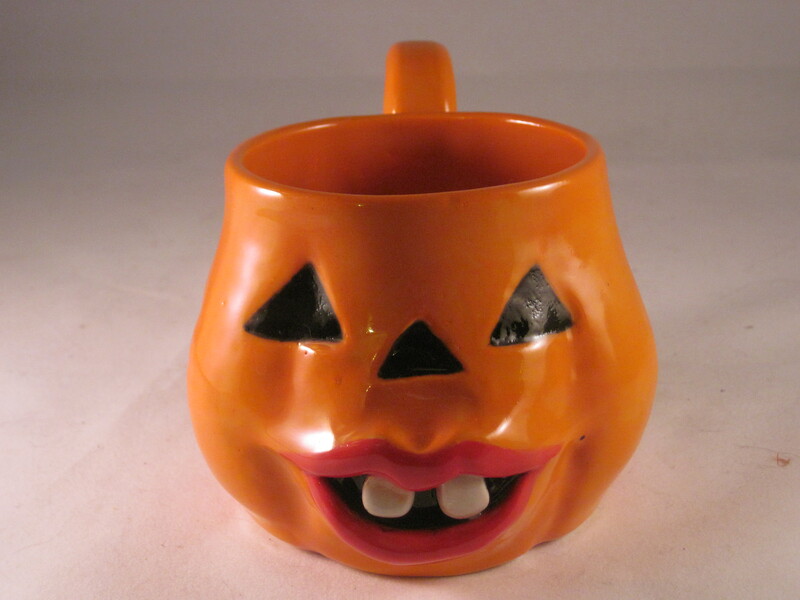 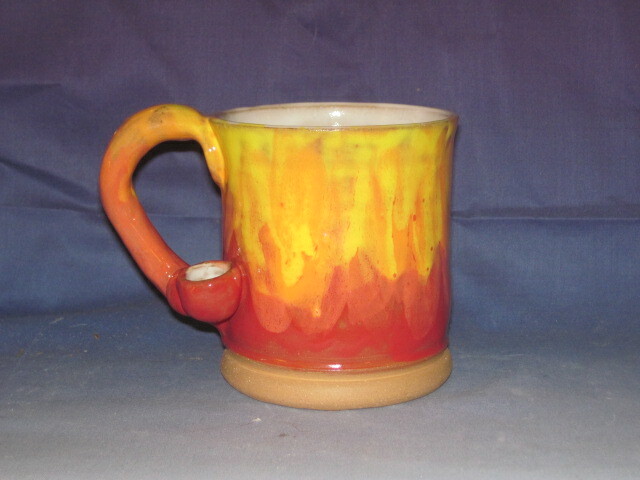 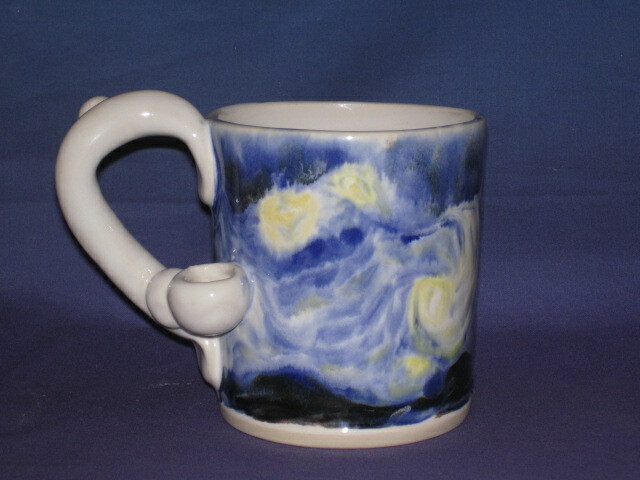 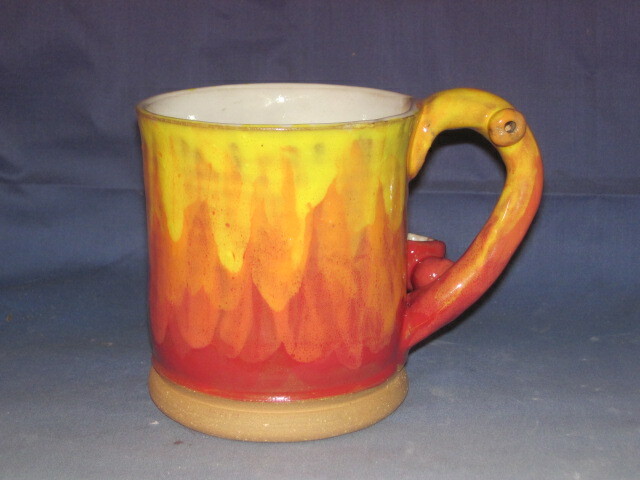 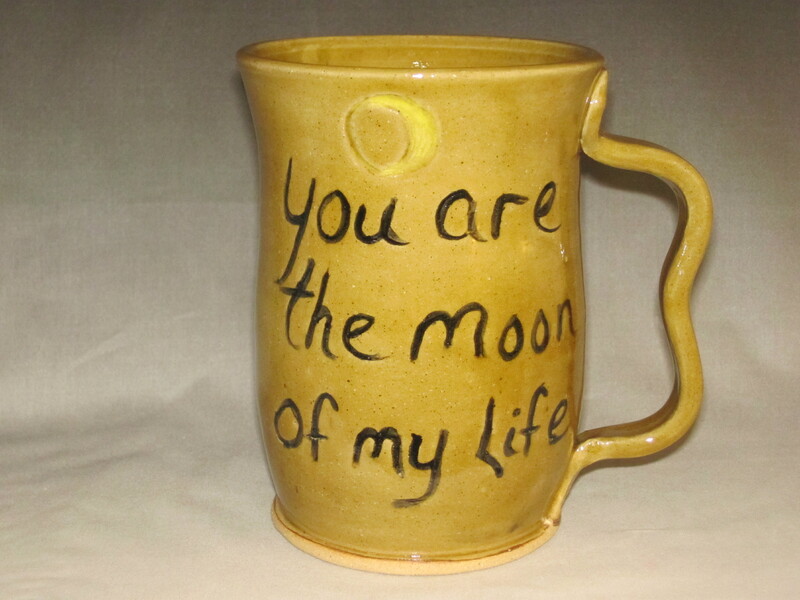 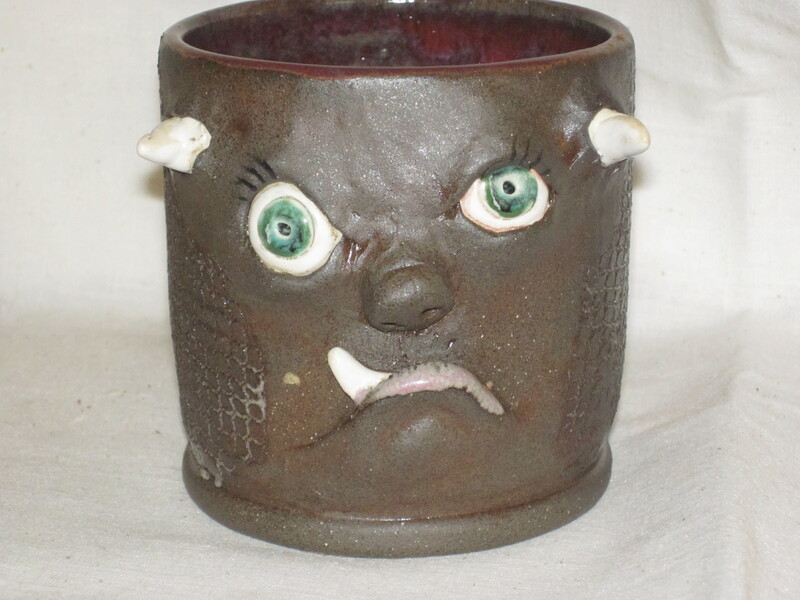 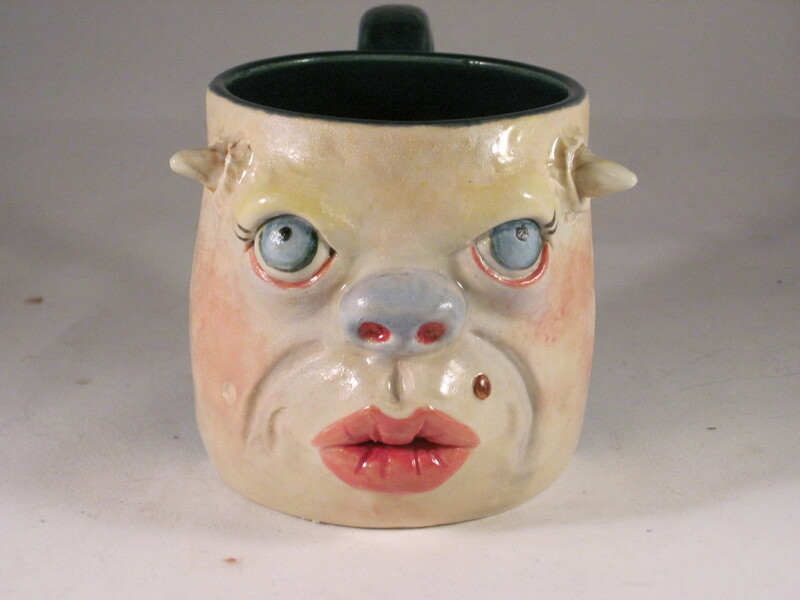 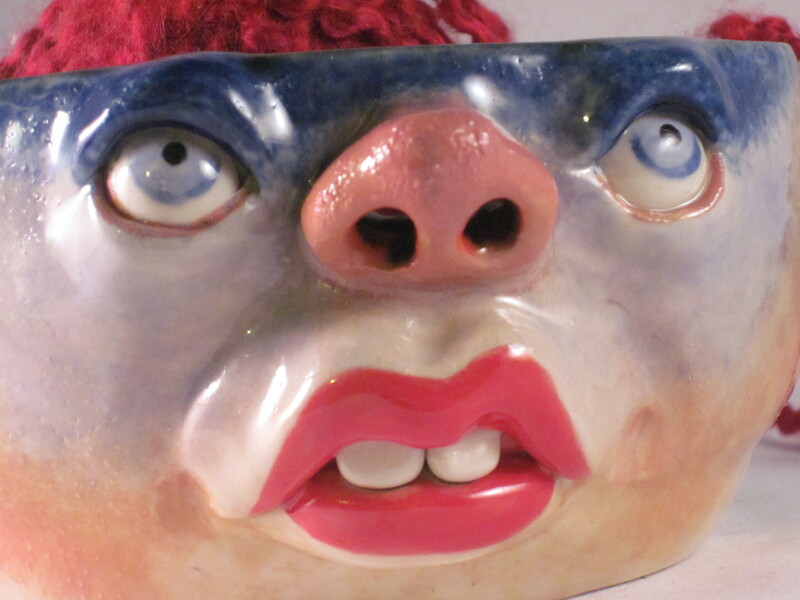 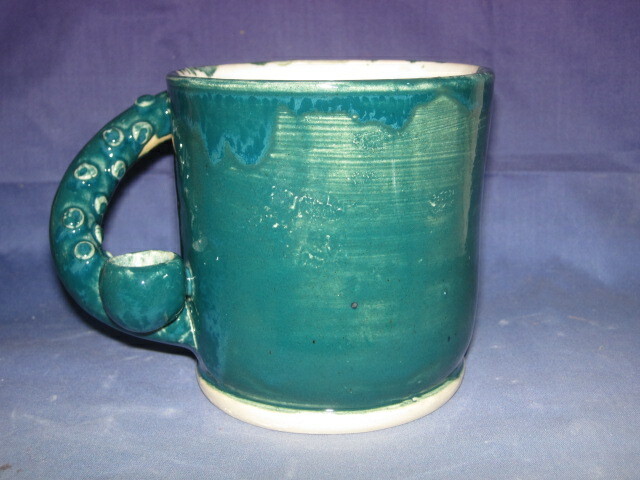 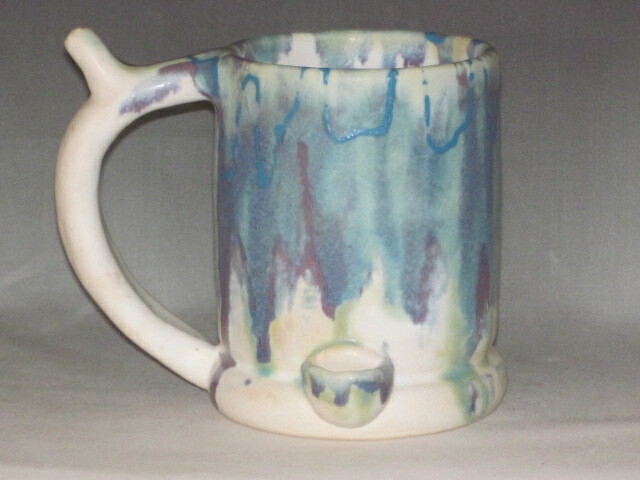 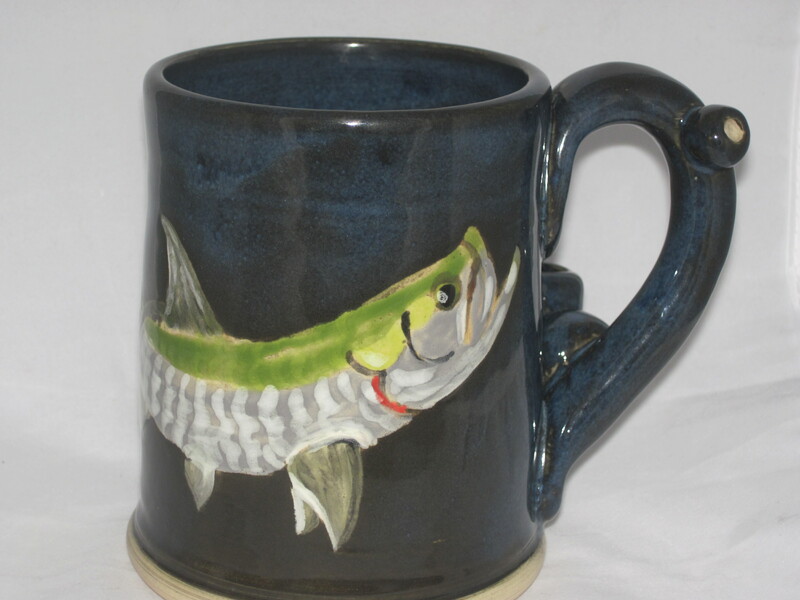 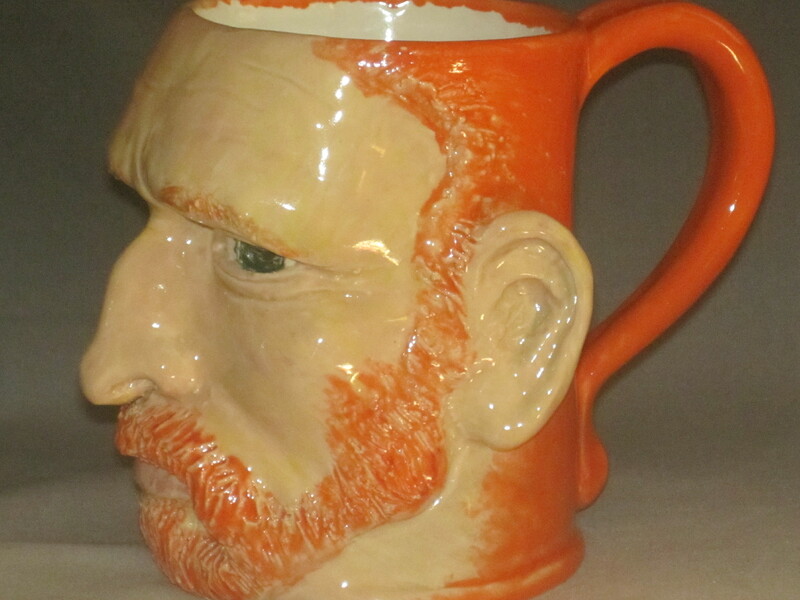 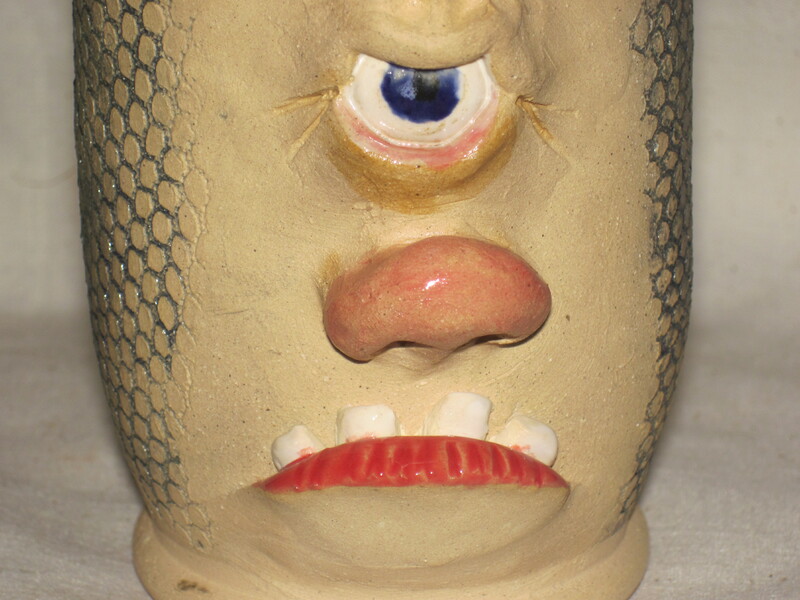 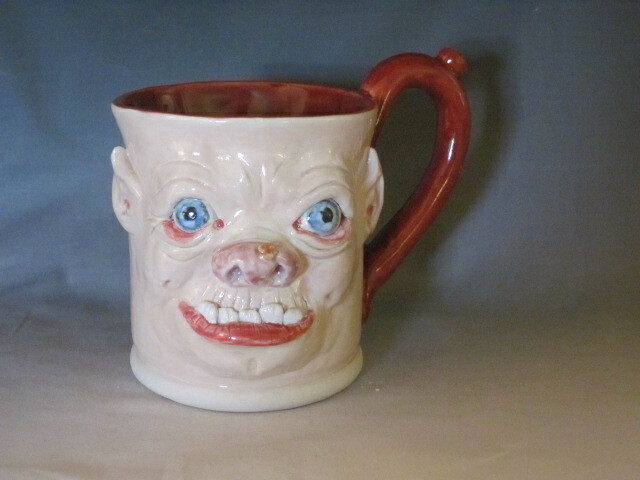 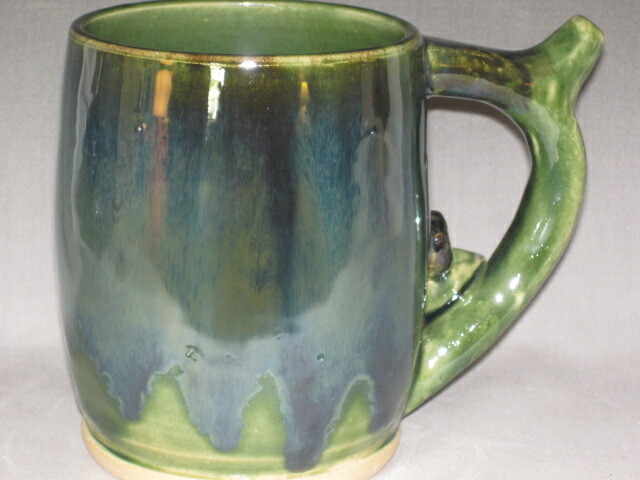 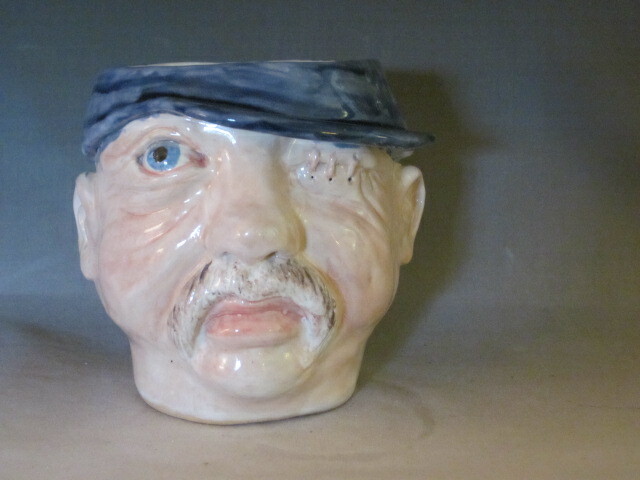 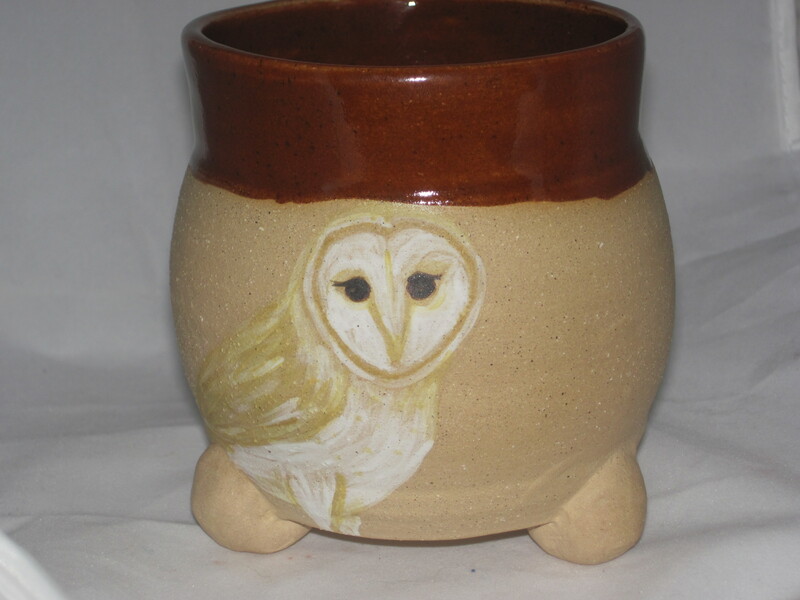 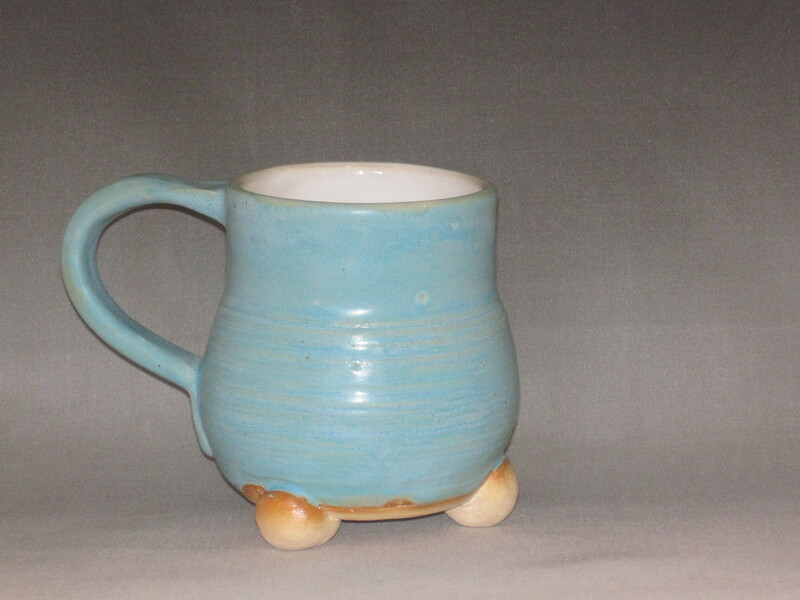 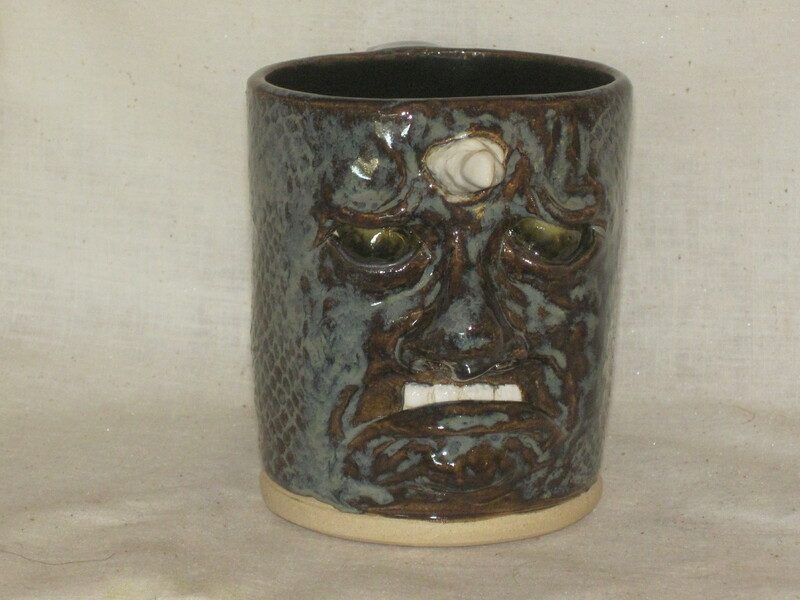 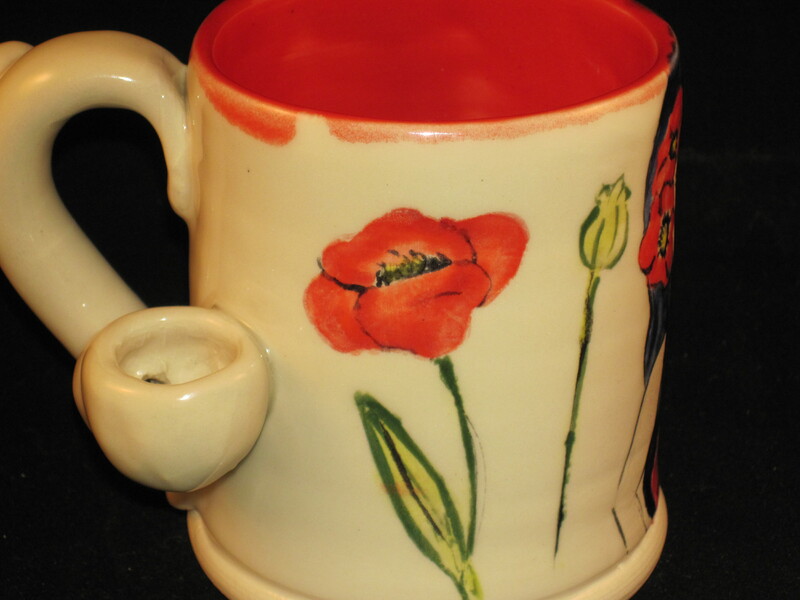 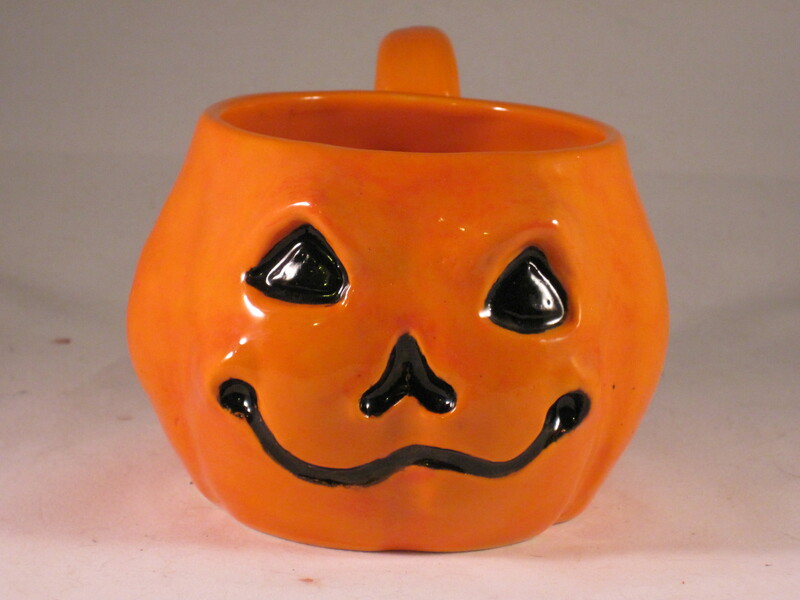 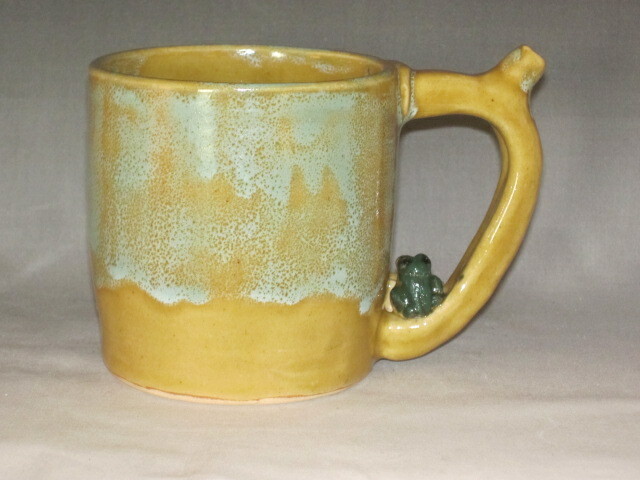 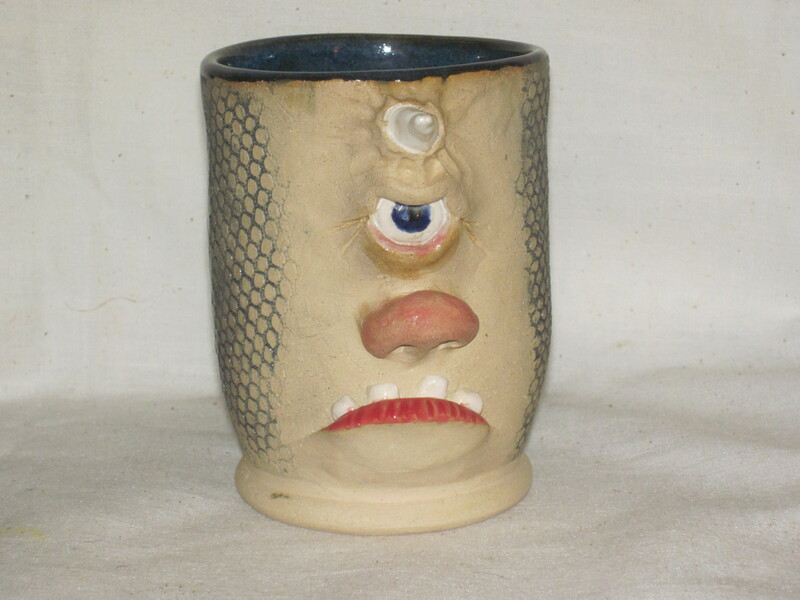 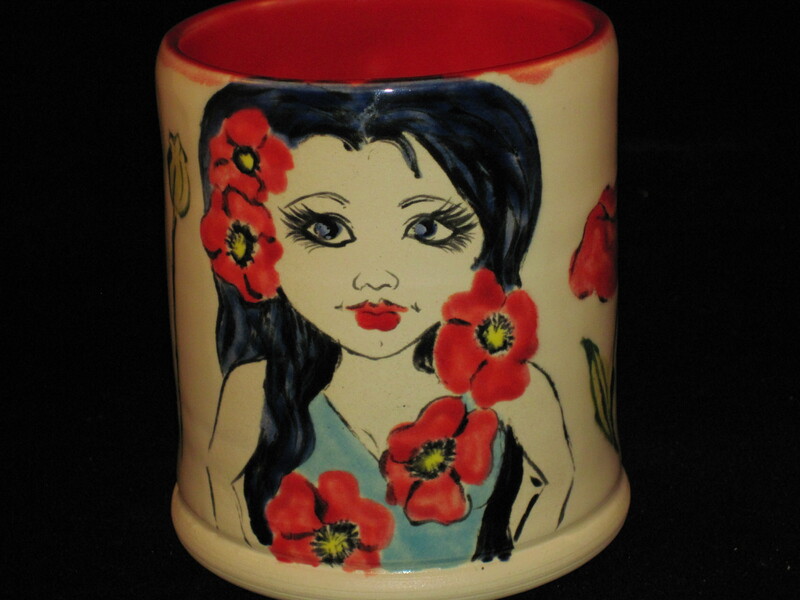 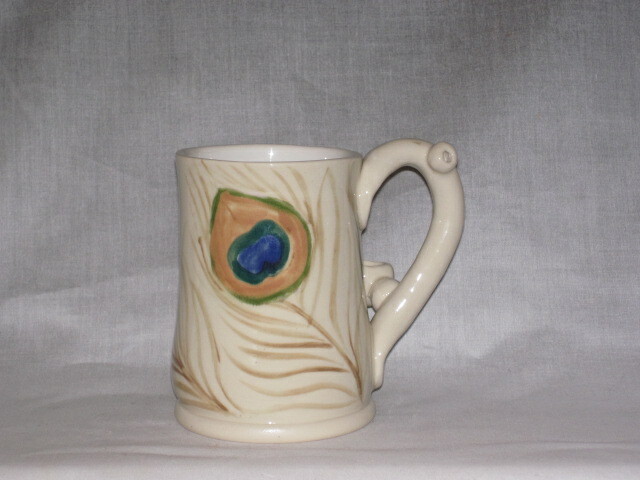 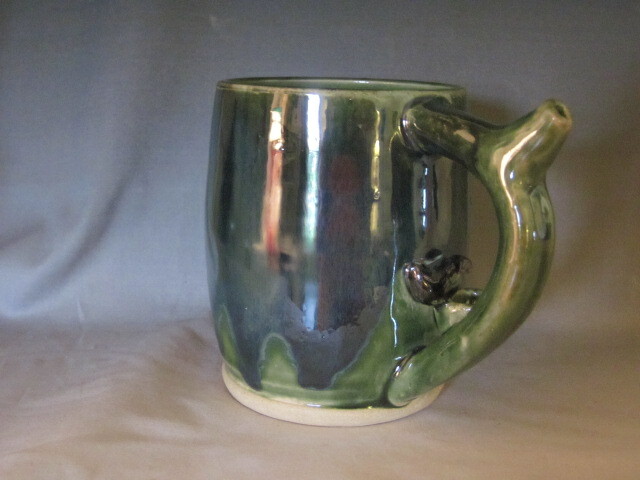 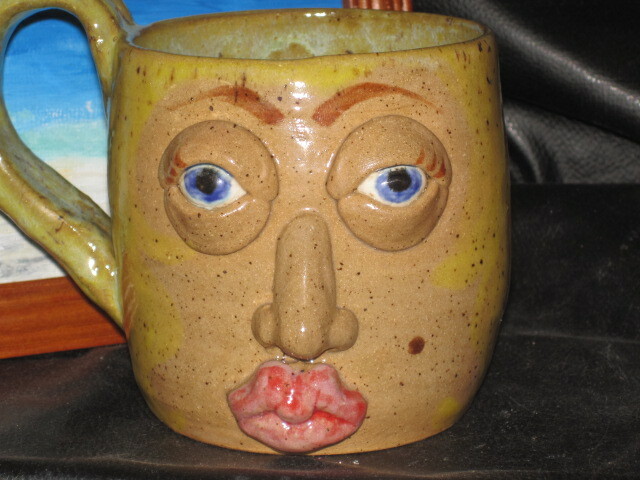 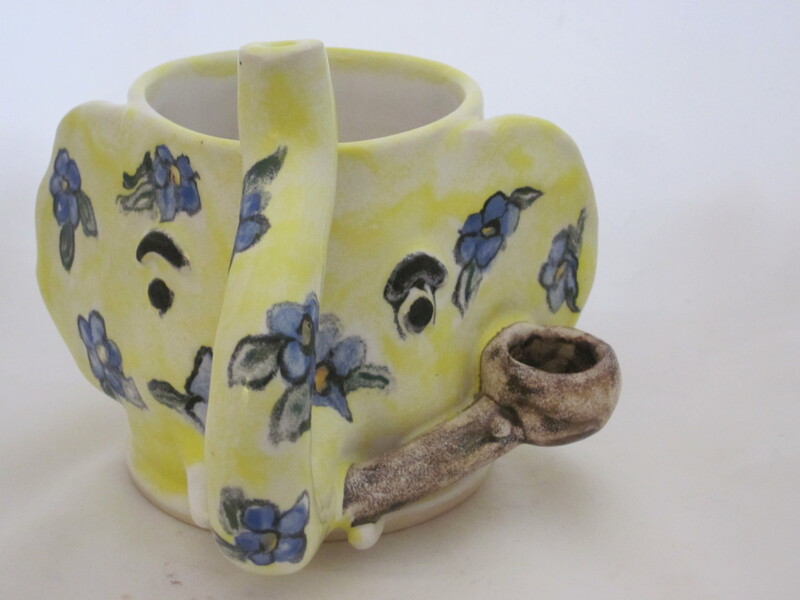 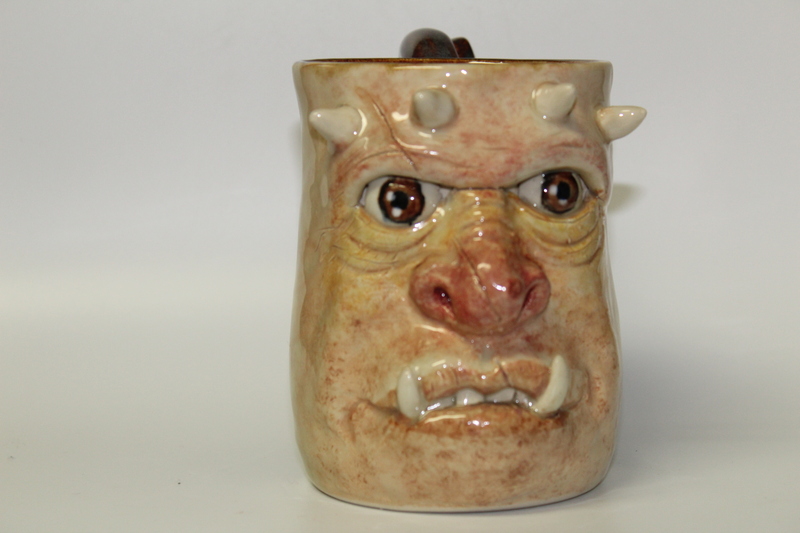 I made a new mug, I am hoping that it makes it through the firing stages. 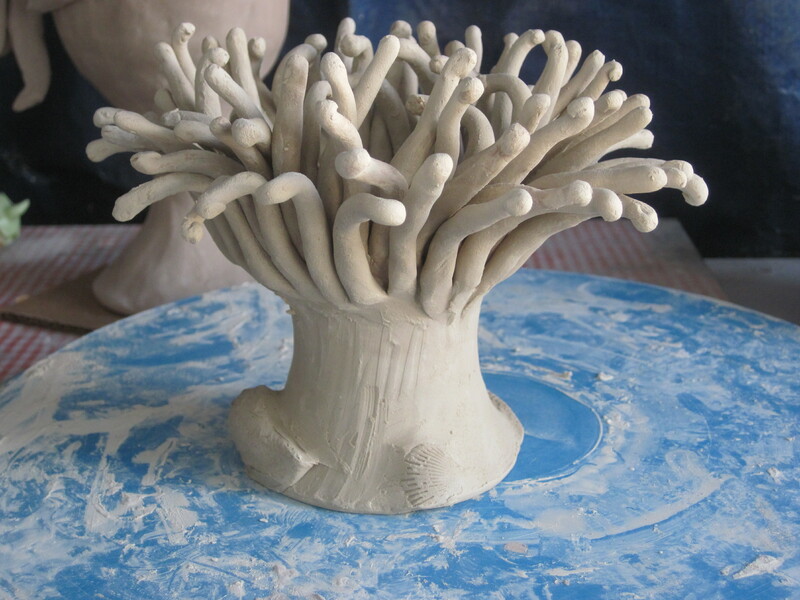 I will allow it to dry for a couple of weeks first. 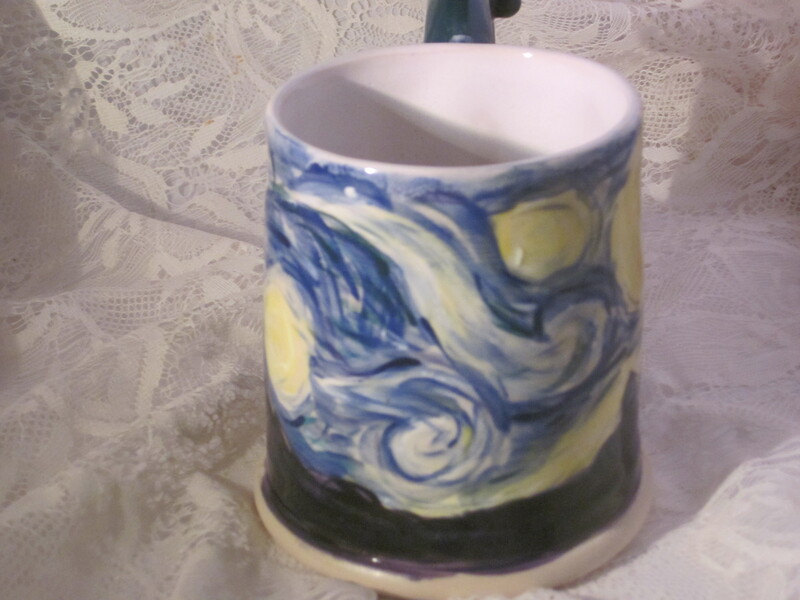 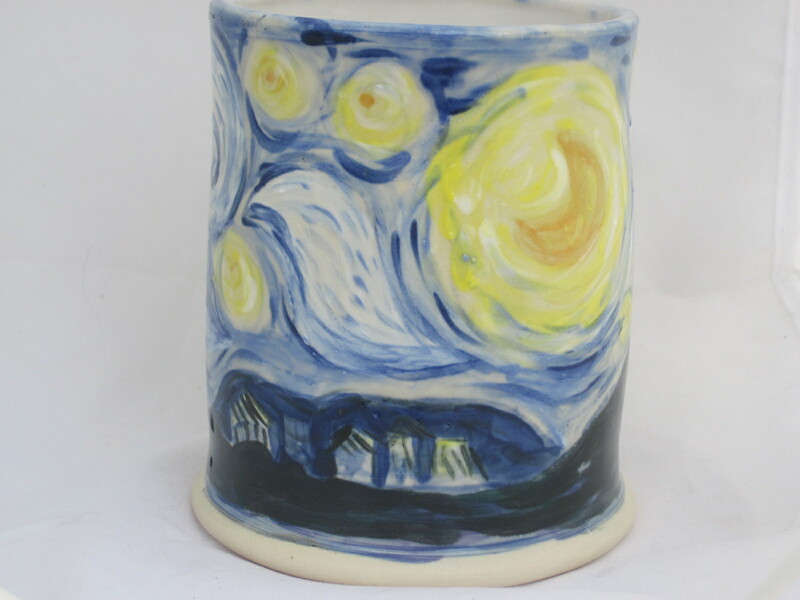 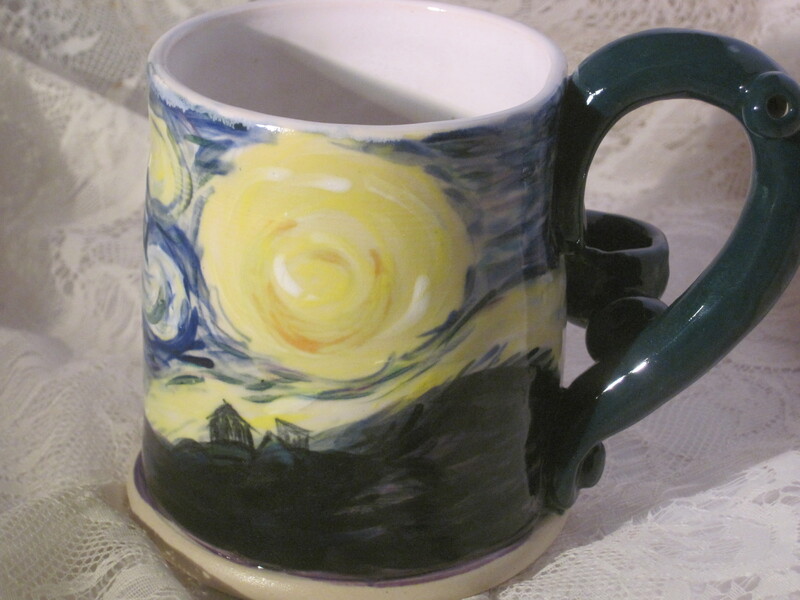 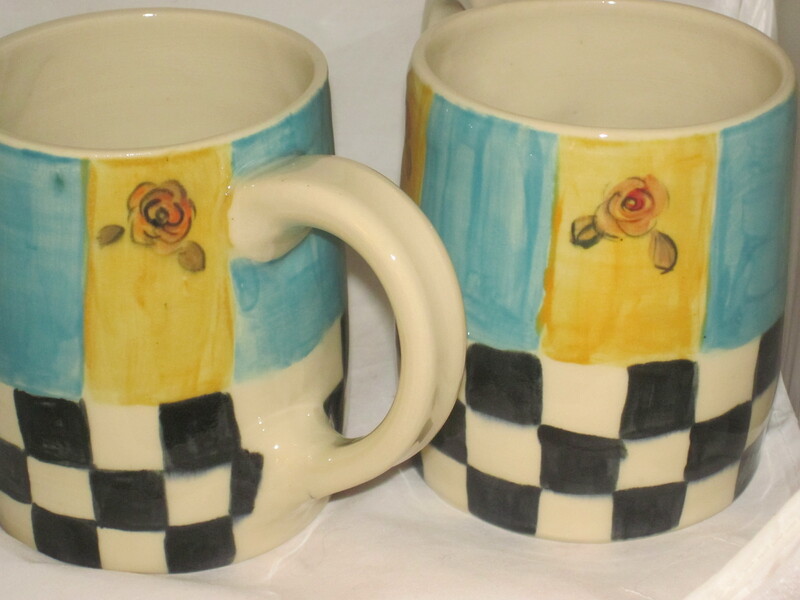 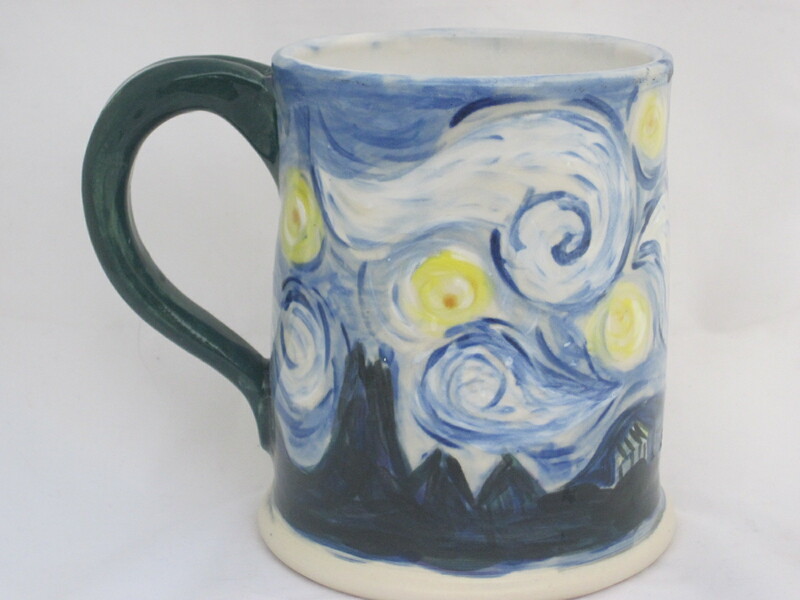 I will pull out the old underglazes and try painting it in vincent style. 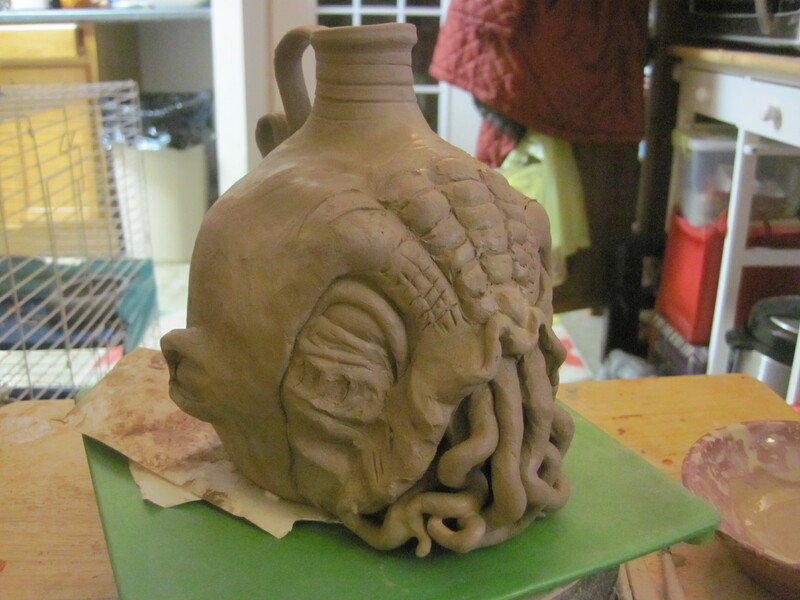 I am not sure I can do it justice but we will see. 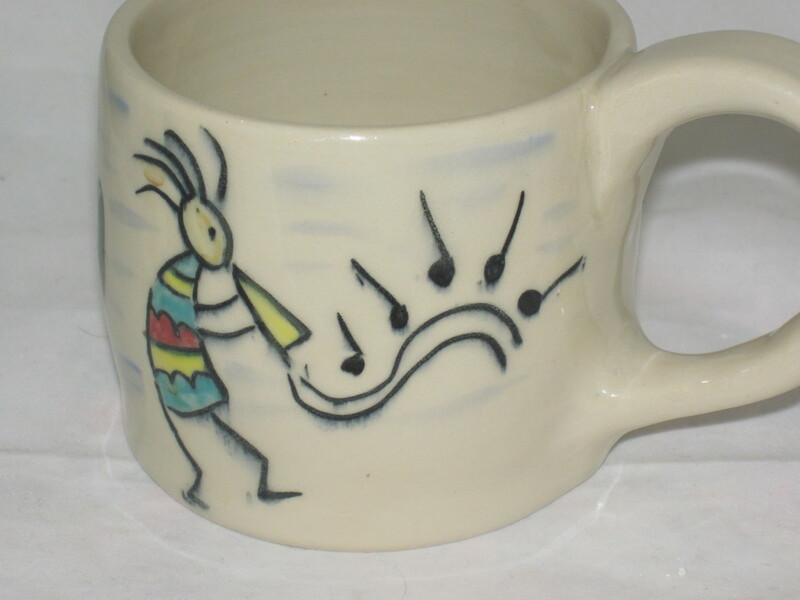 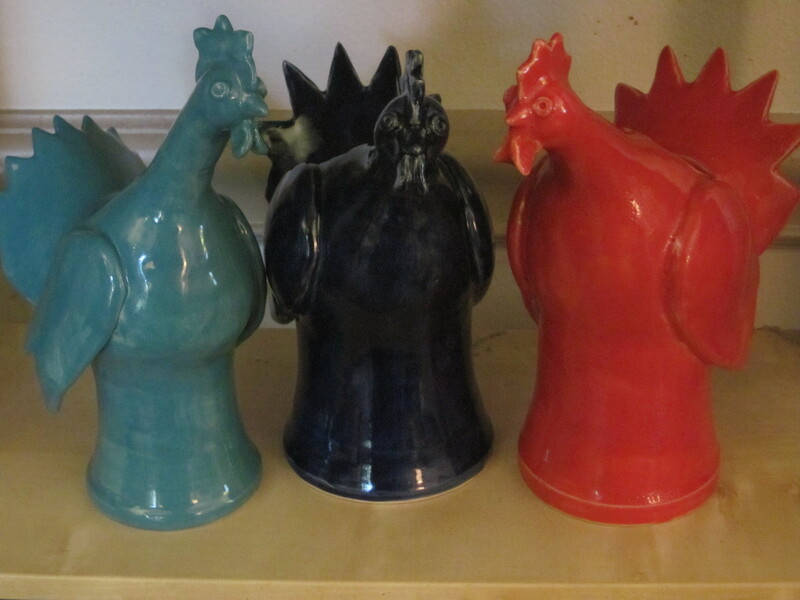 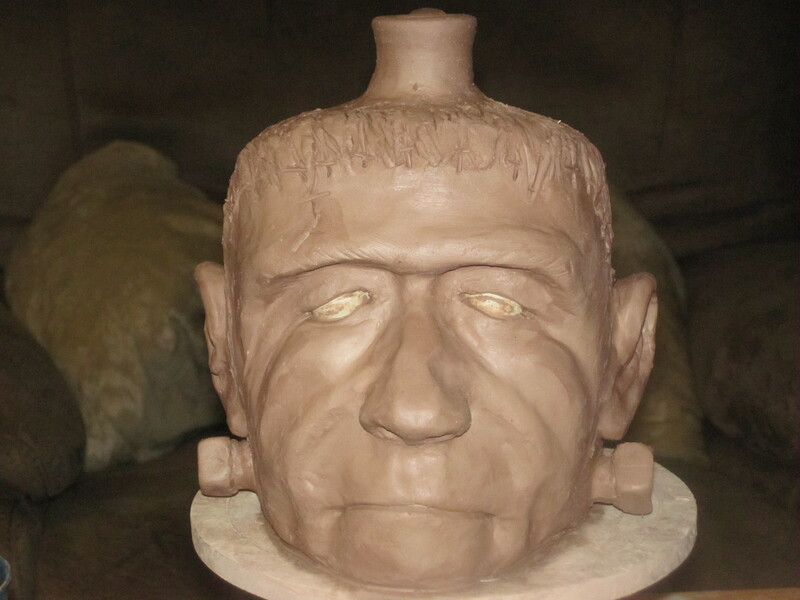 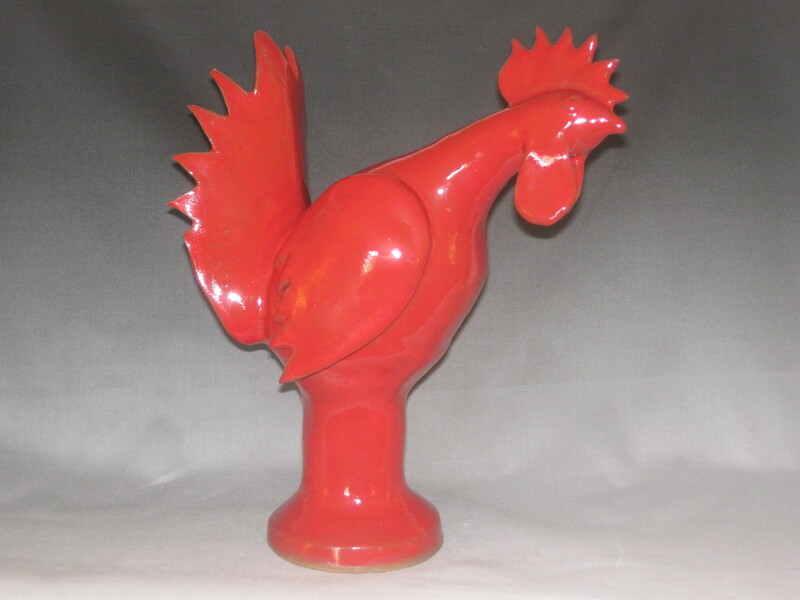 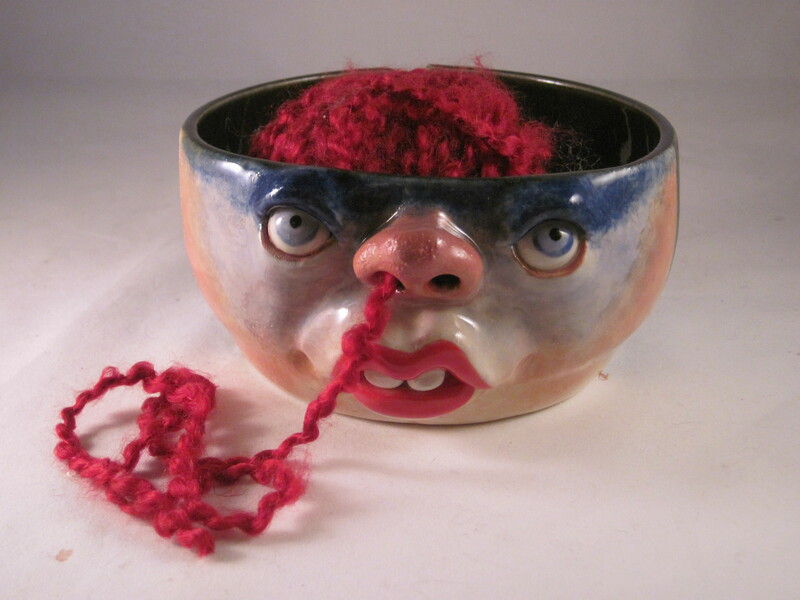 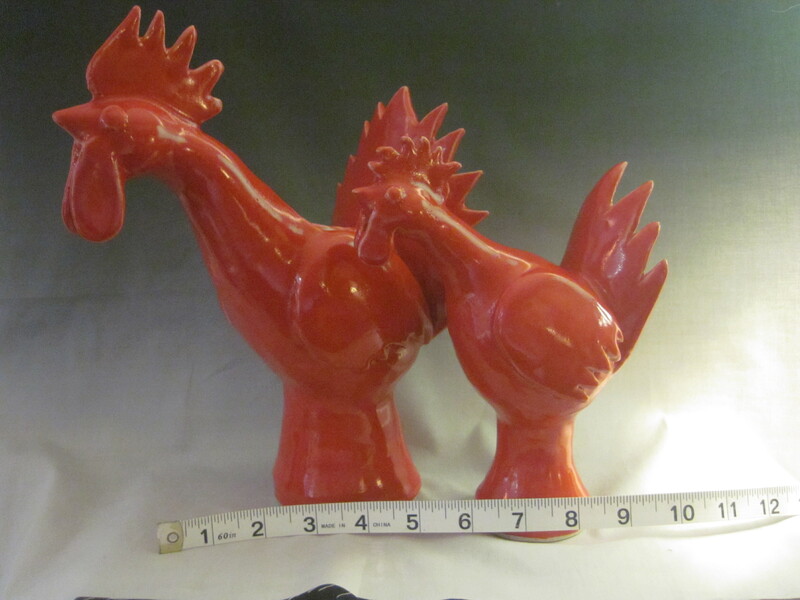 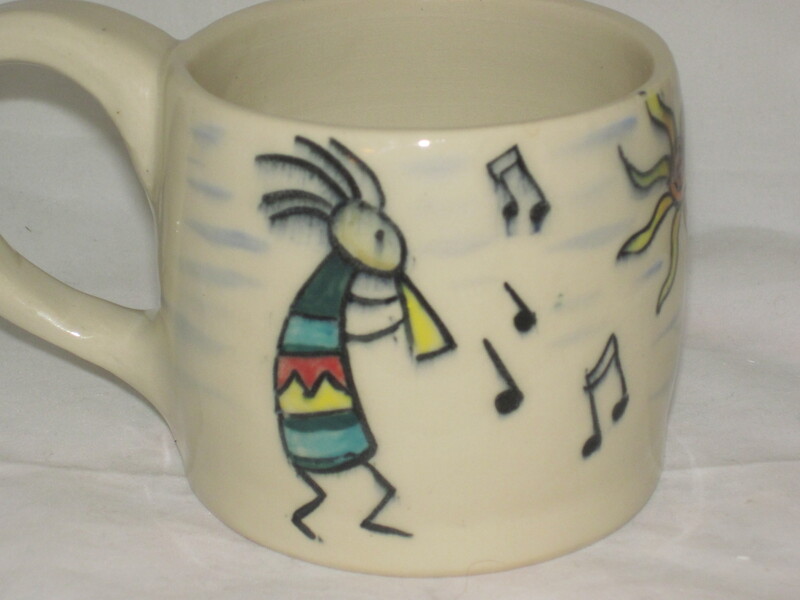 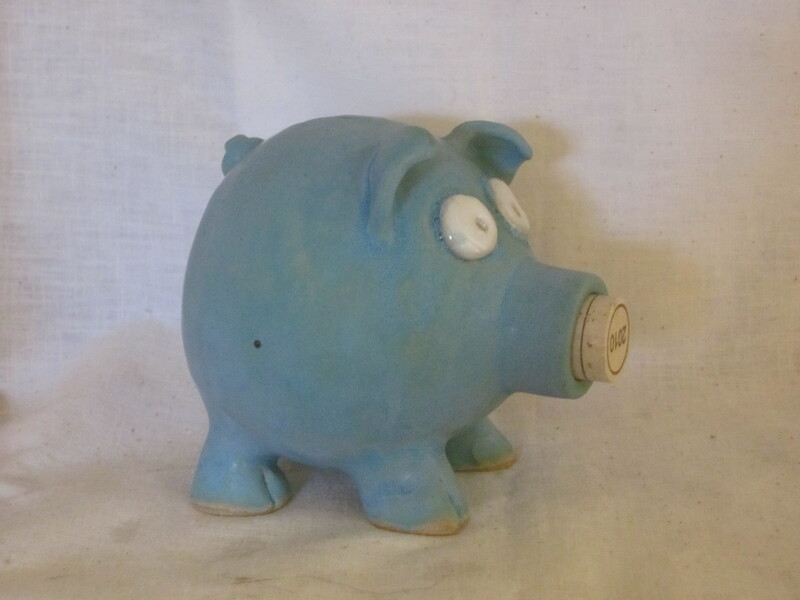 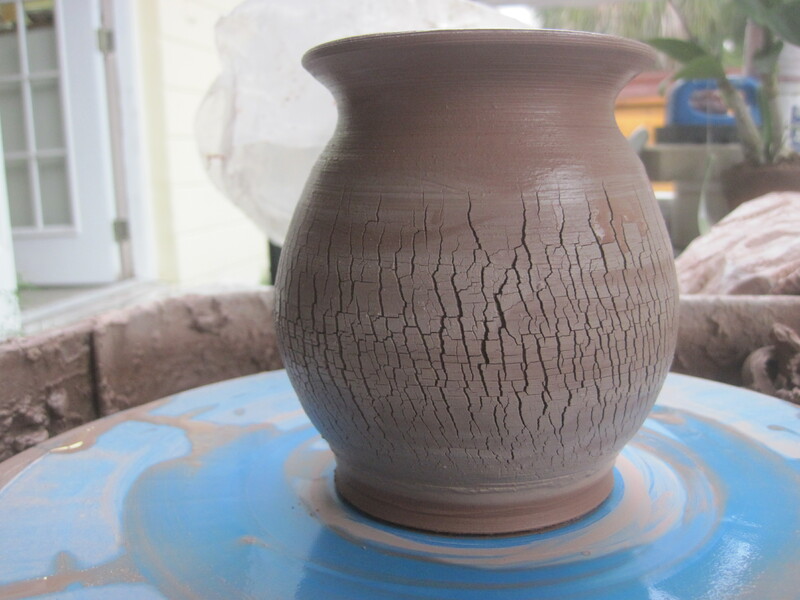 The bane of all potters….. Don’t say it, don’t ask it and don’t hum it! 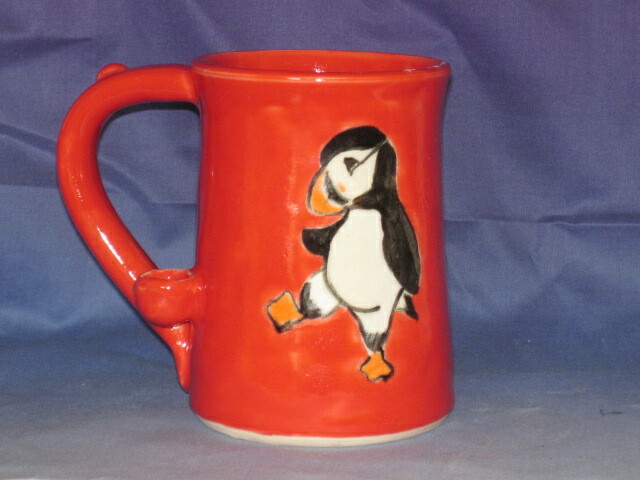 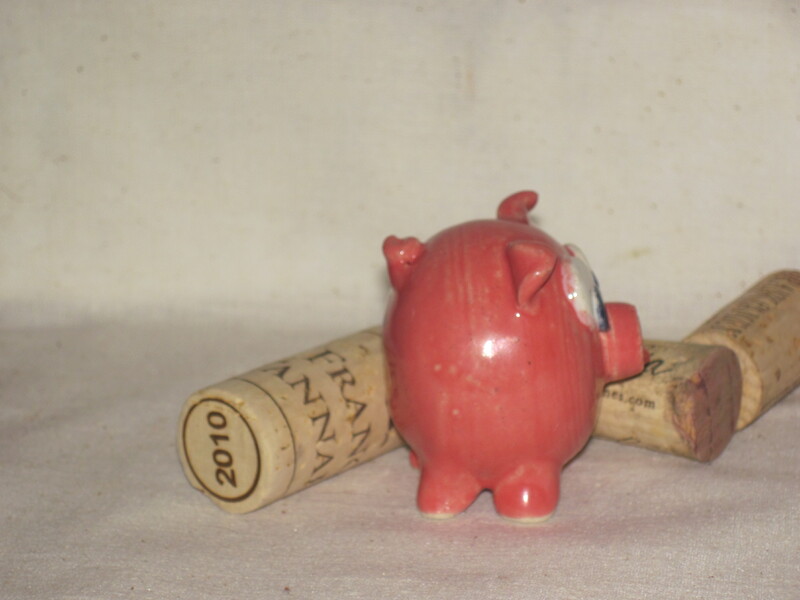 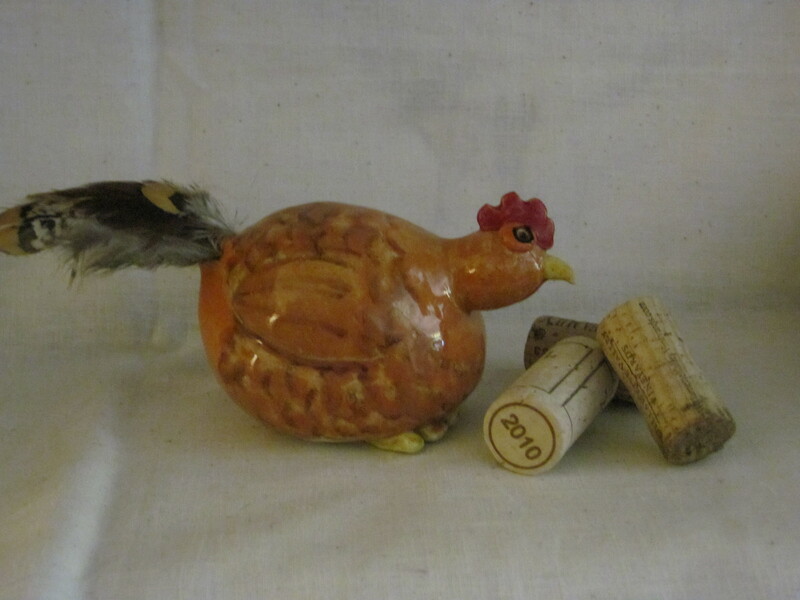 I am getting over the Christmas rush and restocking supplies. 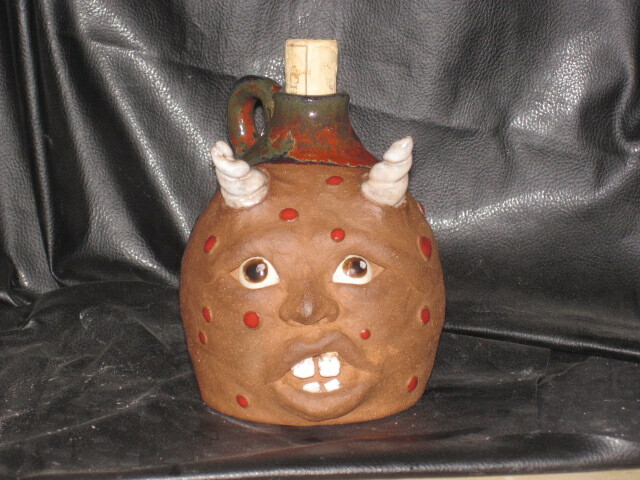 I have been trying new things. 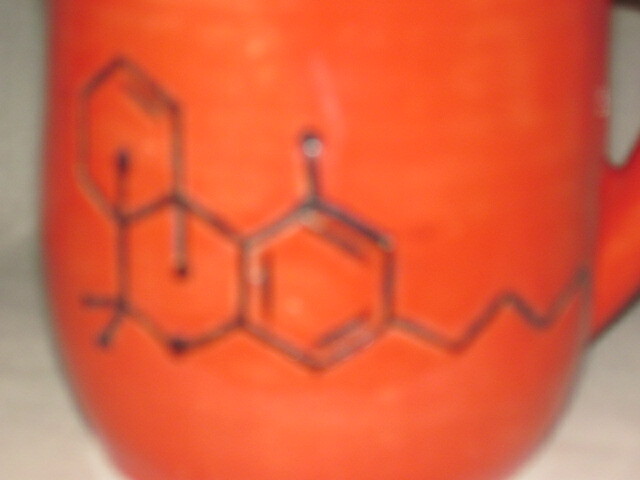 I am working witrh chemicals to enhance my work. 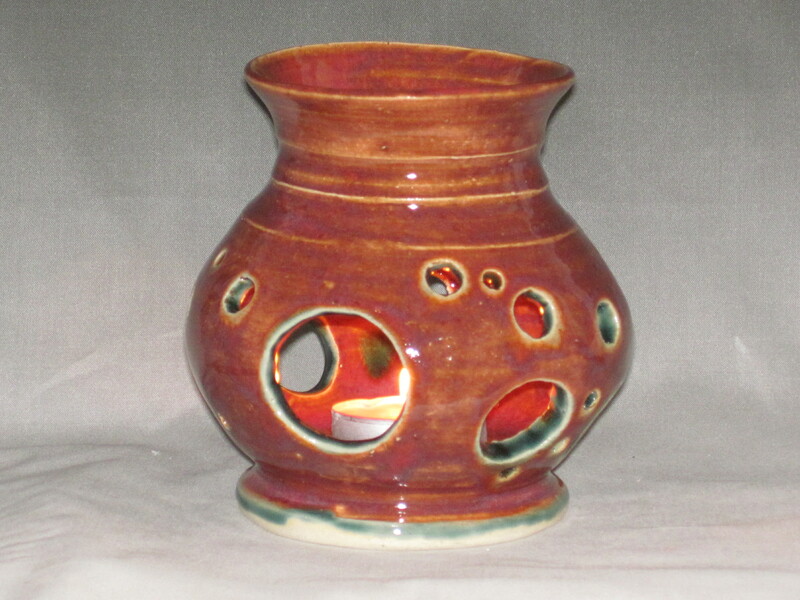 Here is an example of this weeks focus. 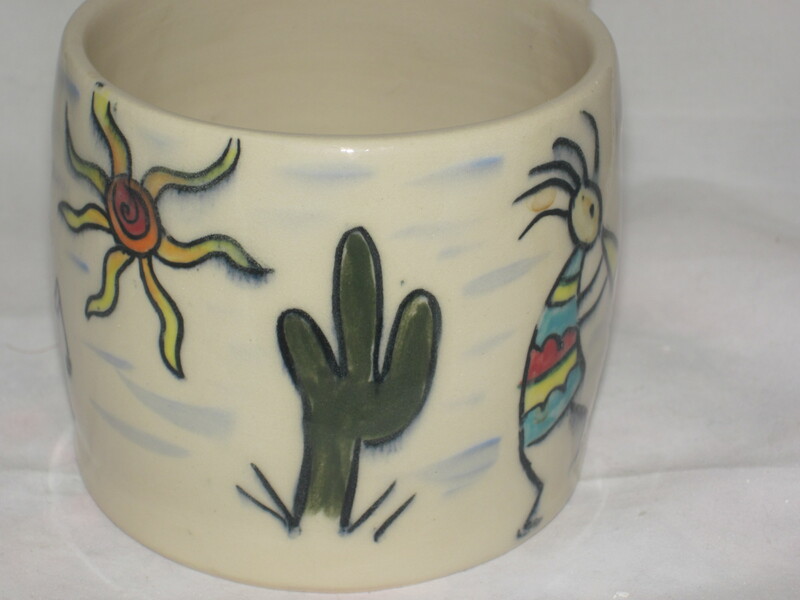 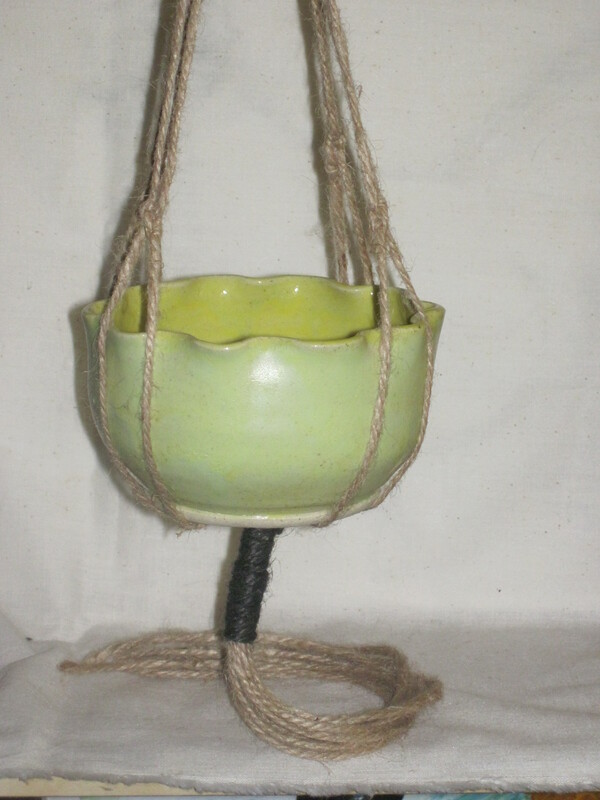 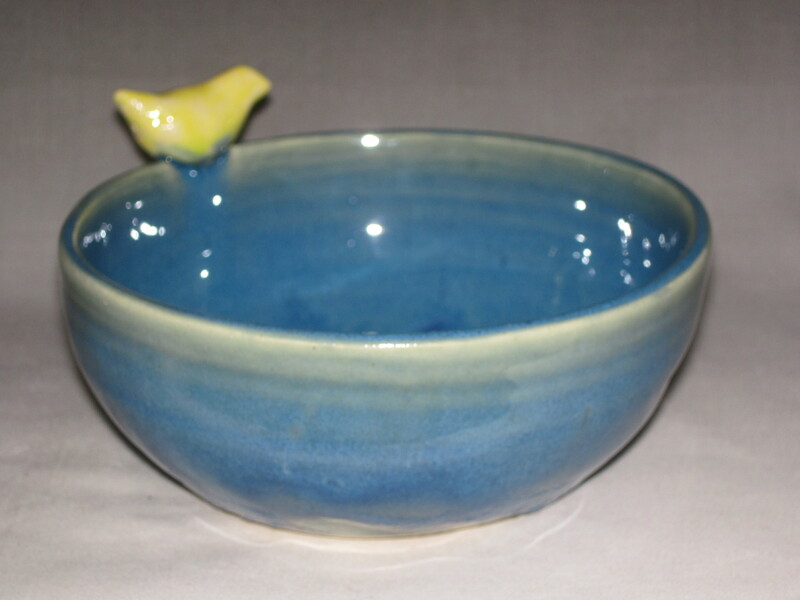 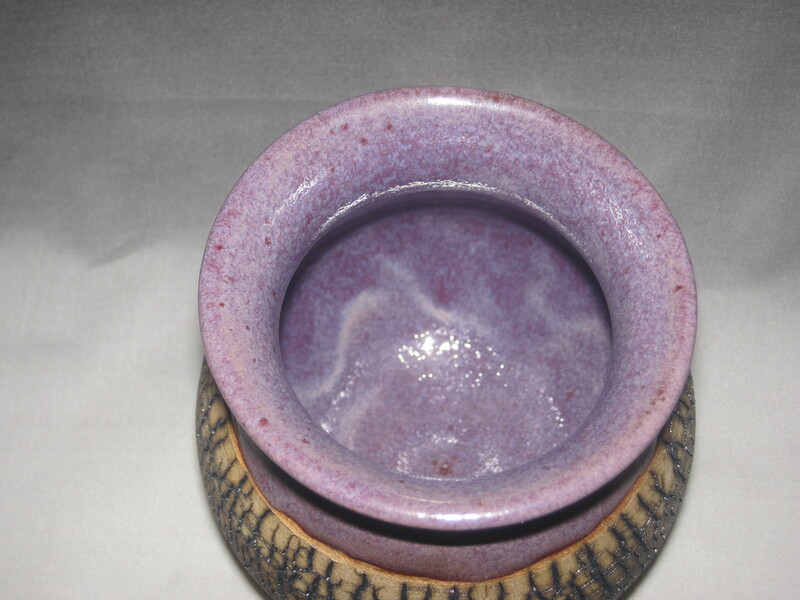 What I am doing is applying sodium silicate to the surface of the pot after I throw it and then I dry the surface with a heat gun just slightly. 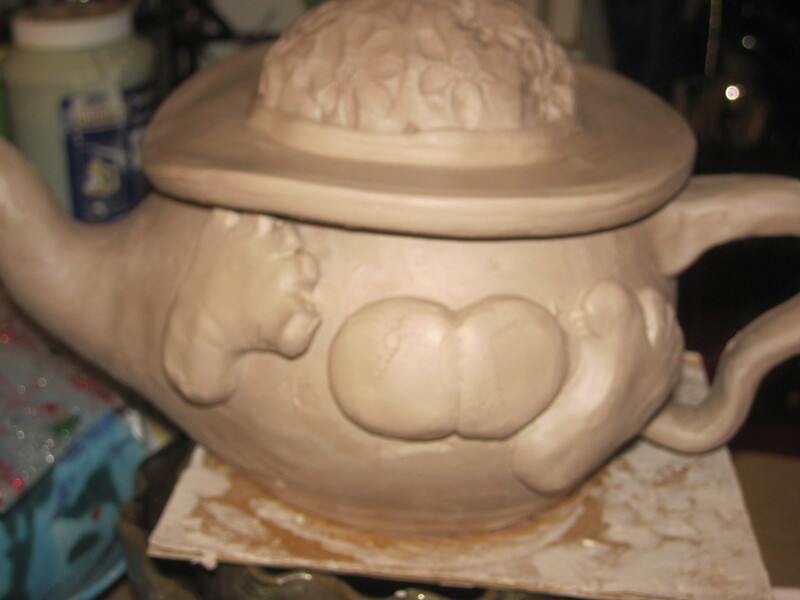 Working from the inside only I veryu slowly stretch out the pot and it creates a wonderful texture. 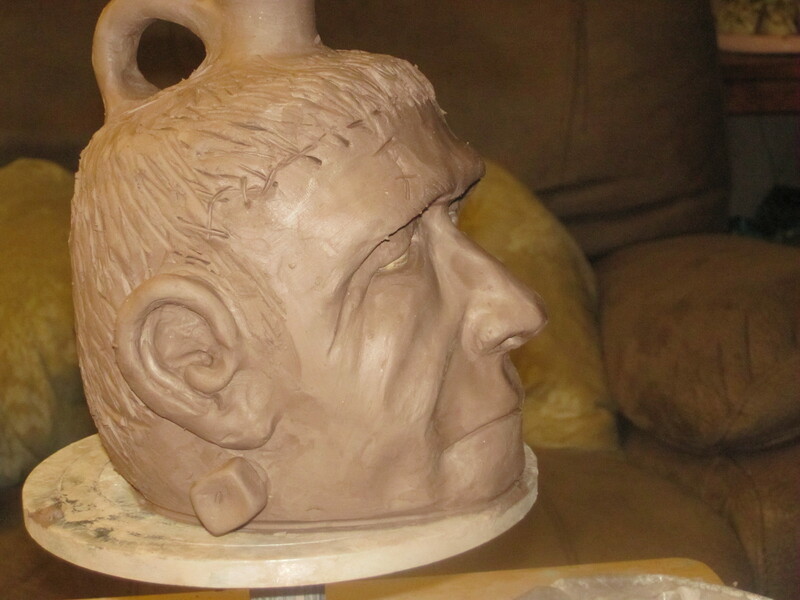 I will do a video of this technique and upload it in the next week. 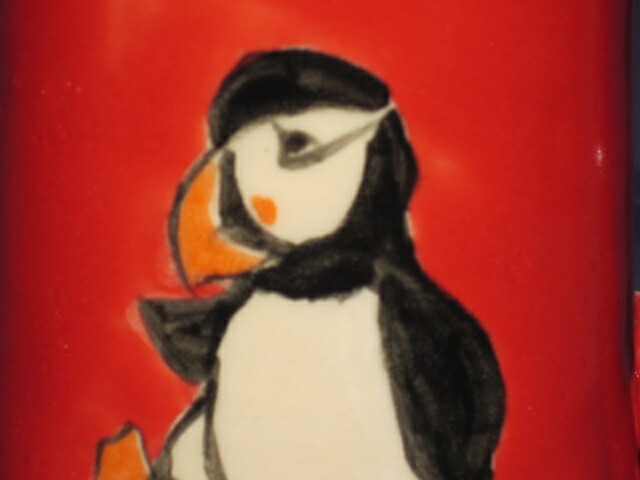 I made this great little fabric design to make my pictures look nicer. 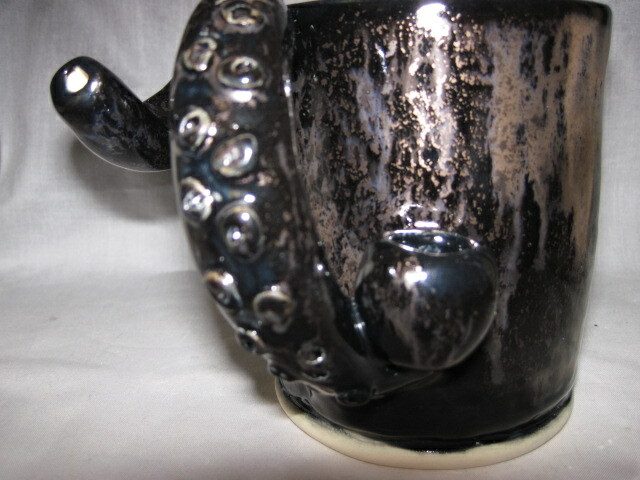 It is for sale on Spoonflower. 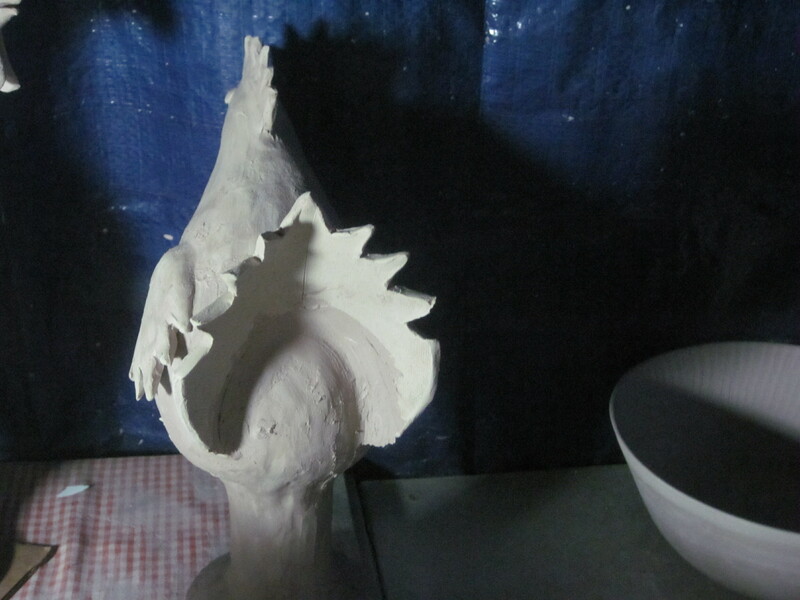 Doesnt that look more professional? 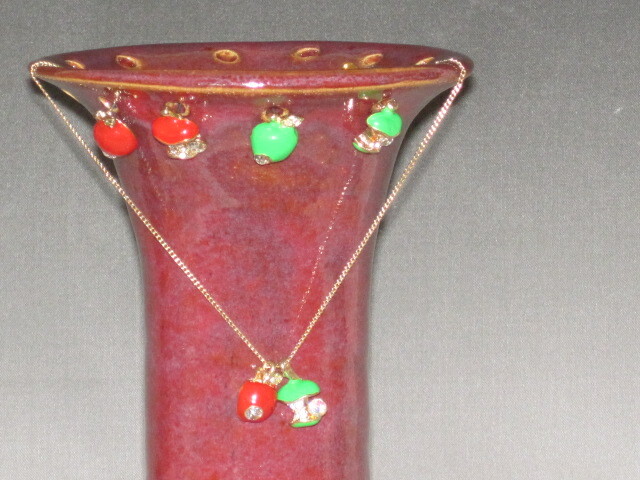 Just after christmas and I am working hard to get my inventory filled with fun things. 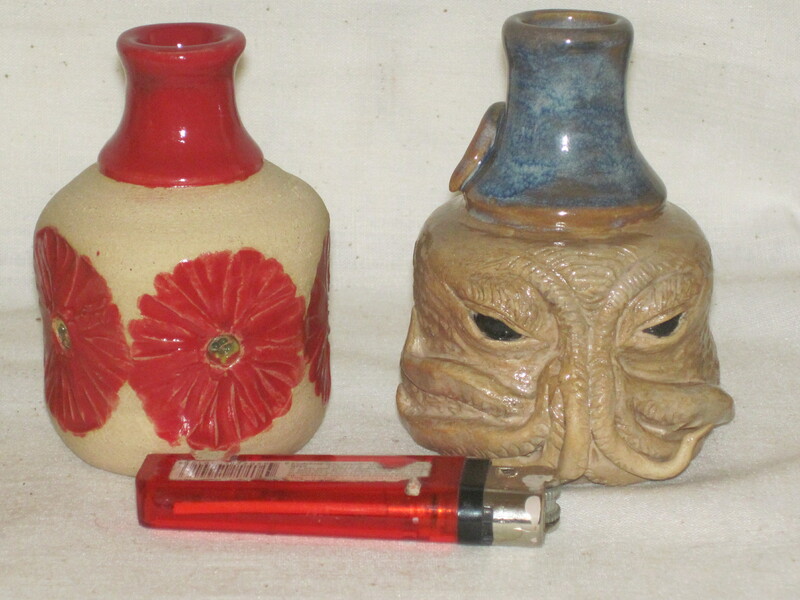 Sales were good this year. 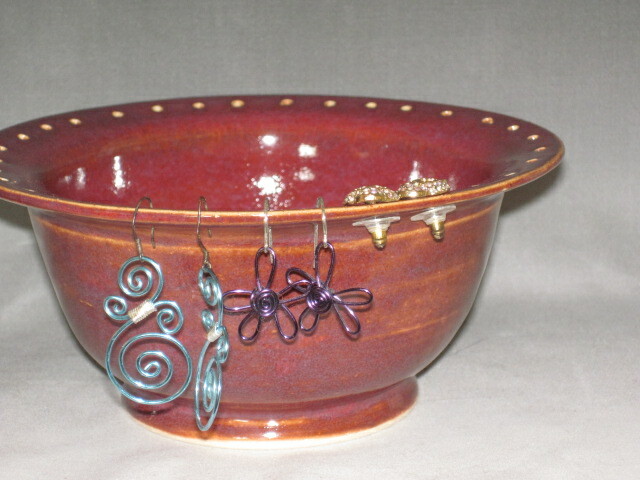 Here are a few new things. 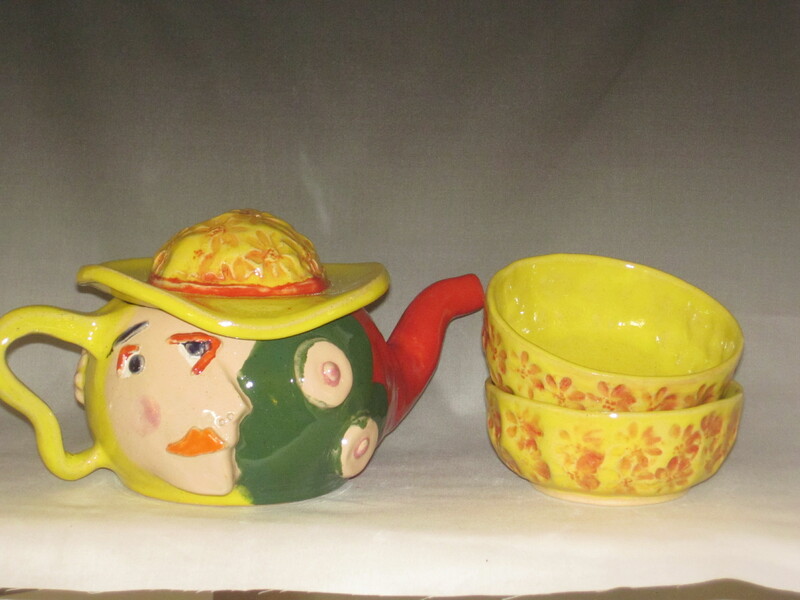 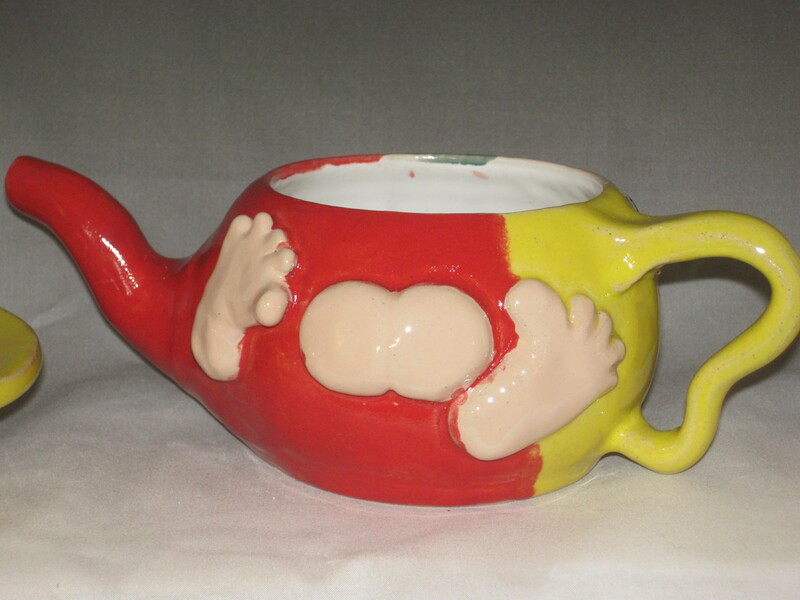 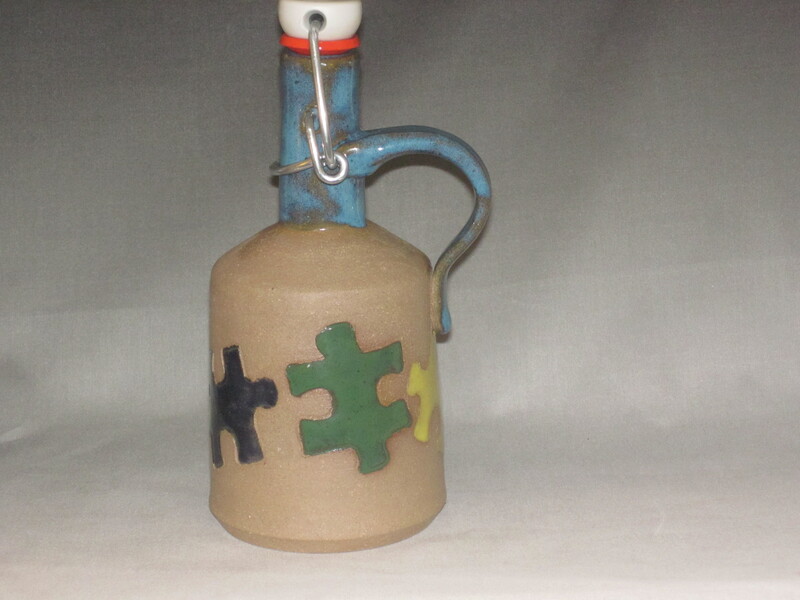 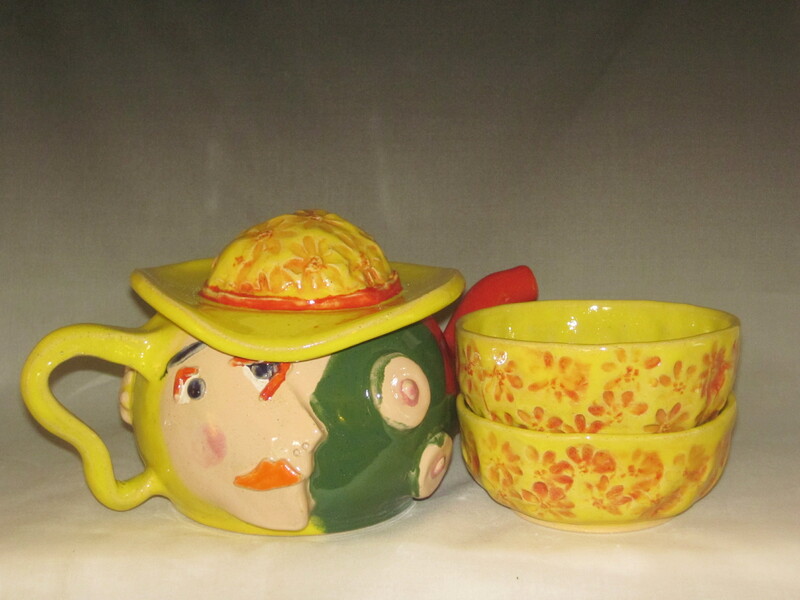 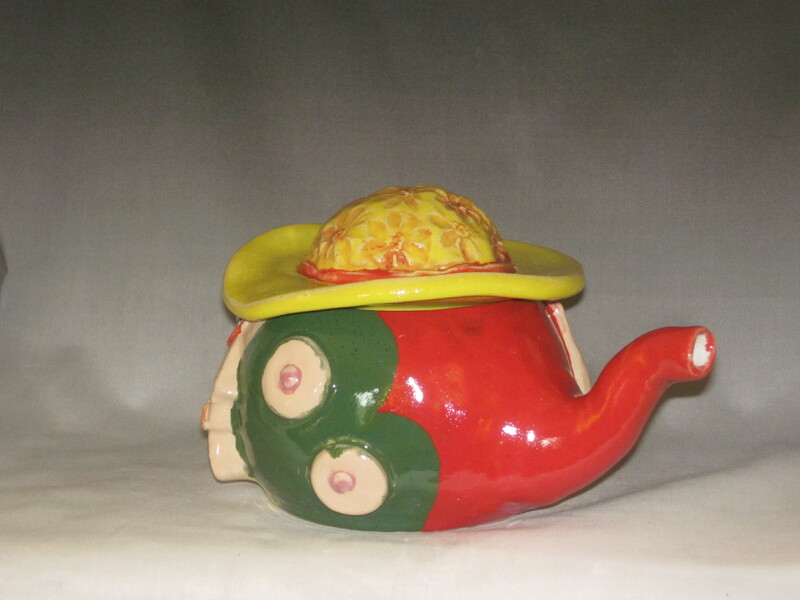 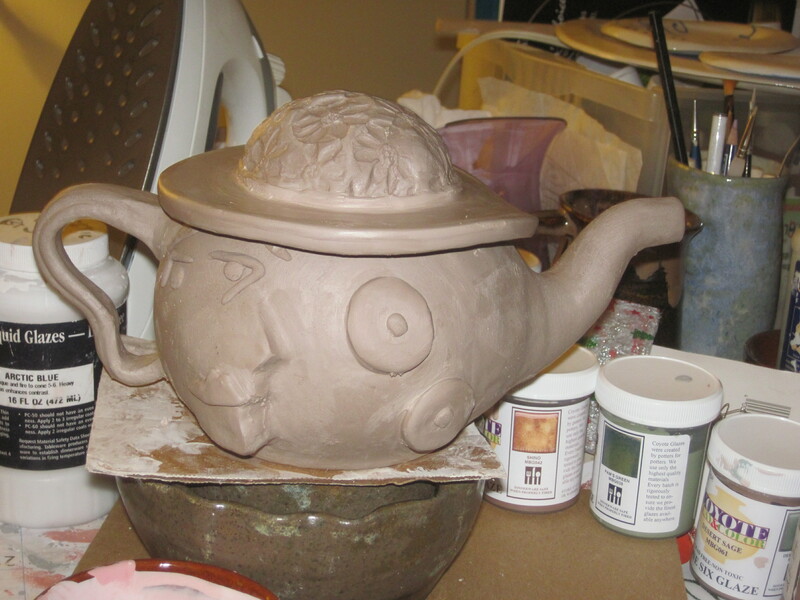 Teapot with a little picasso influence, not yet fired. 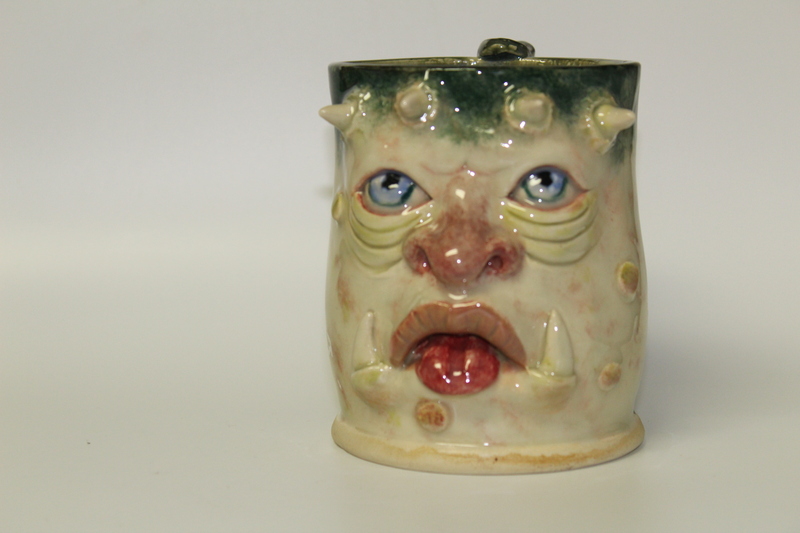 Happy Thanksgiving week Everyone, Here are a couple of finished pieces for you to gander at. 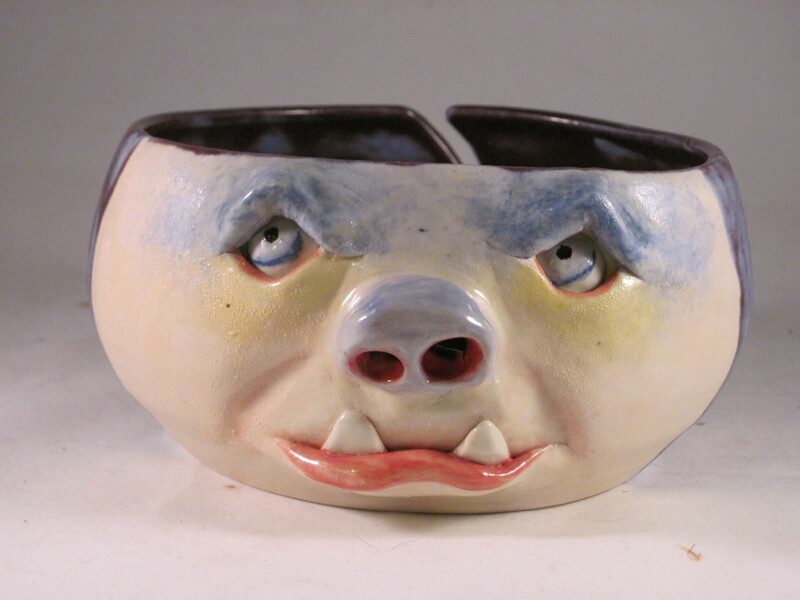 I am presently working hard to get caught up with everything. 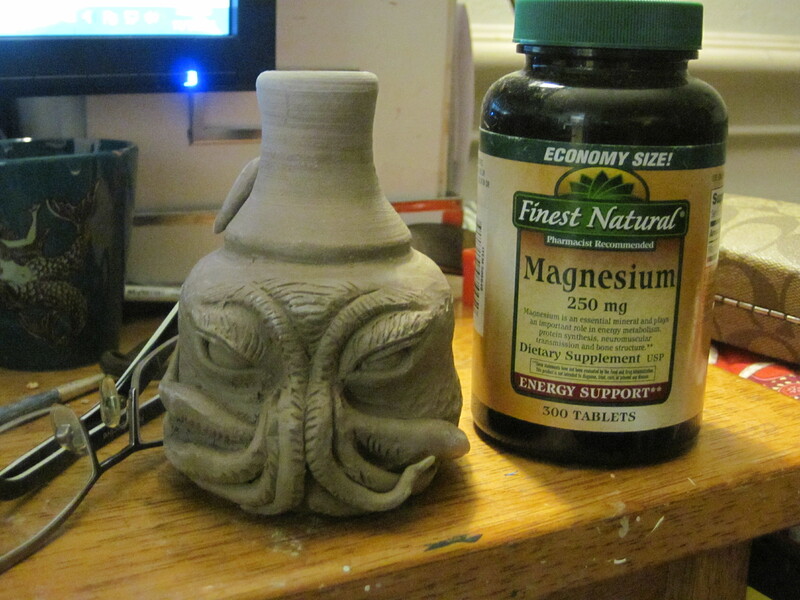 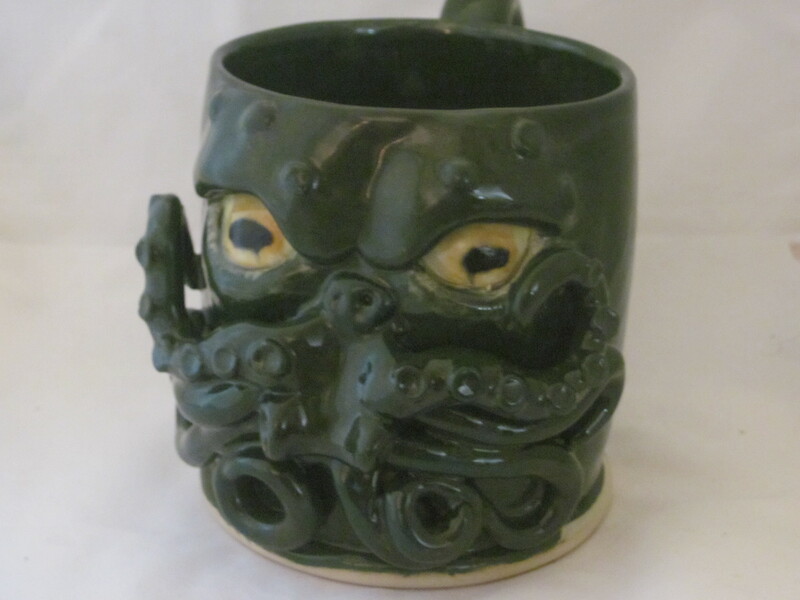 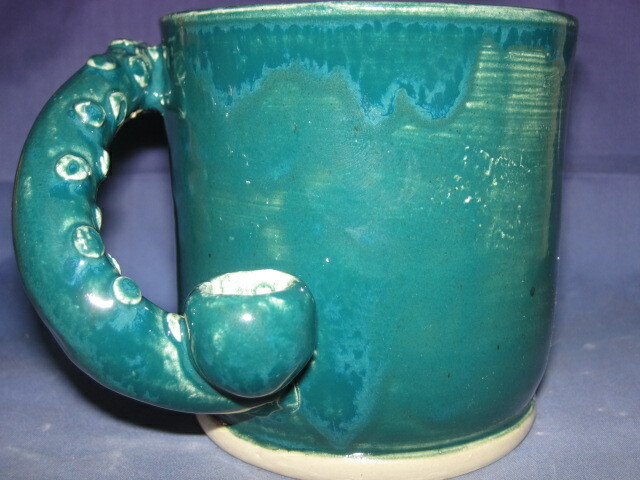 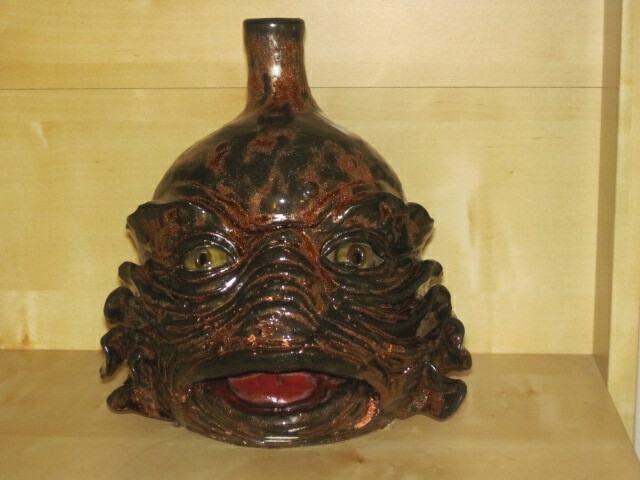 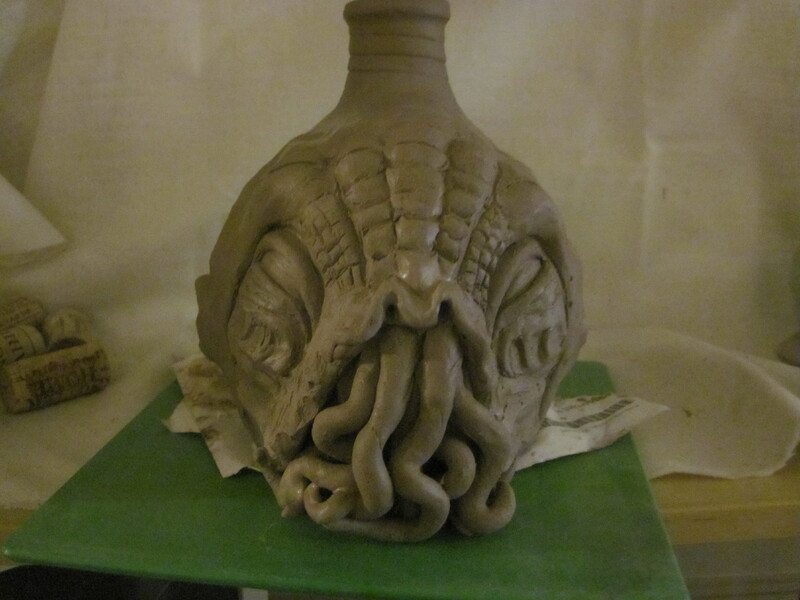 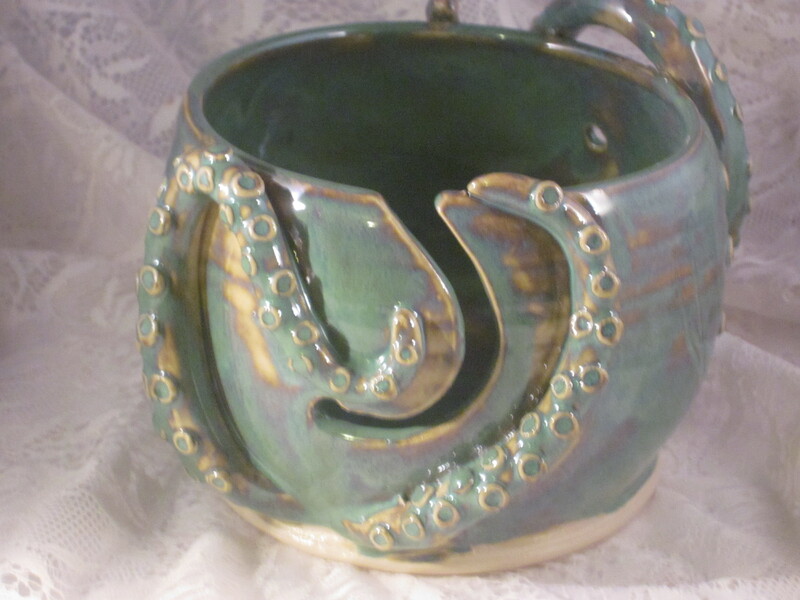 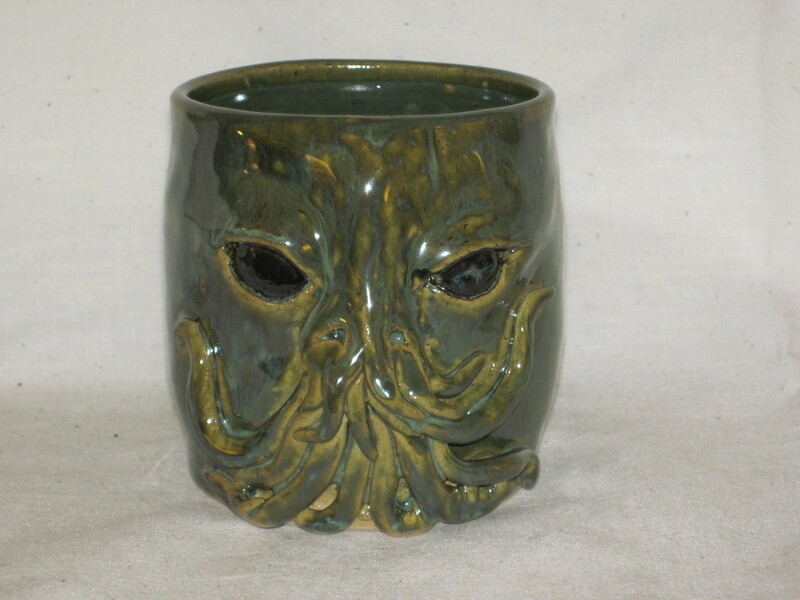 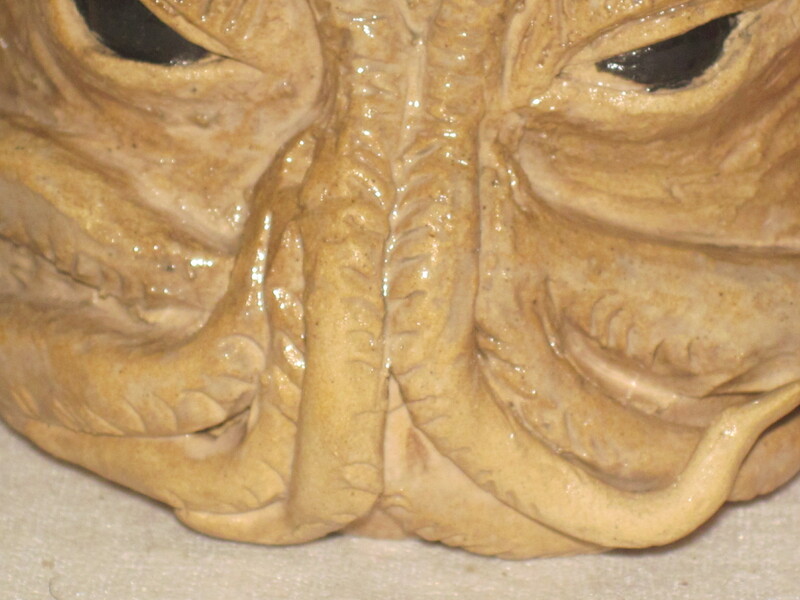 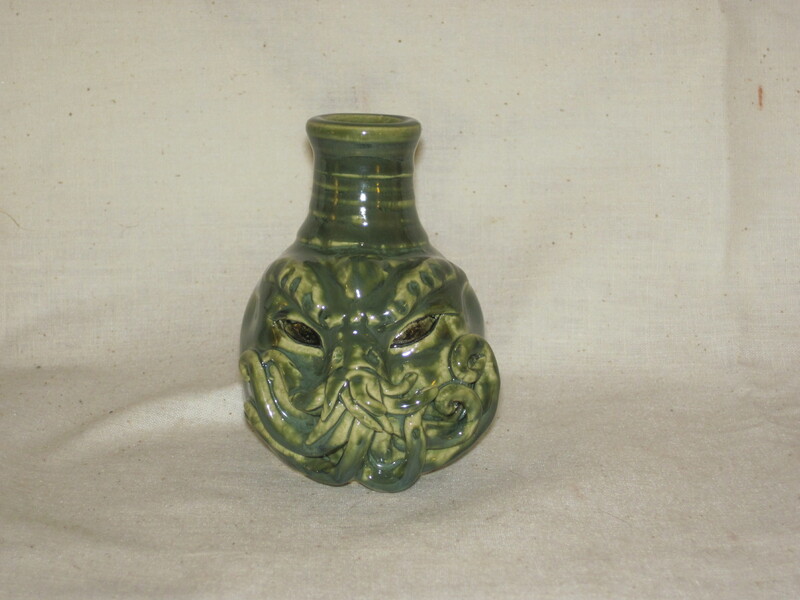 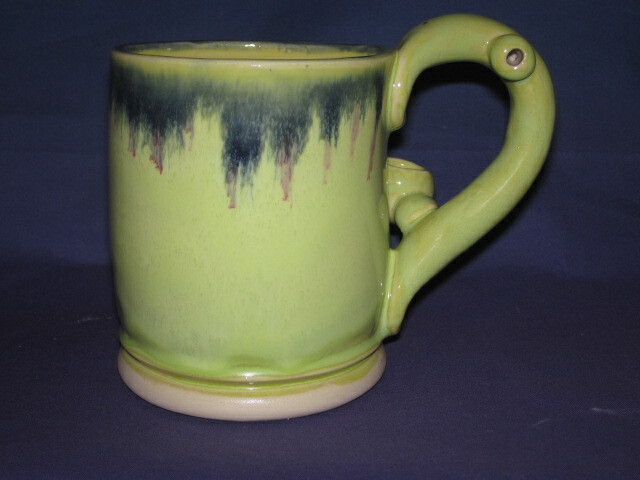 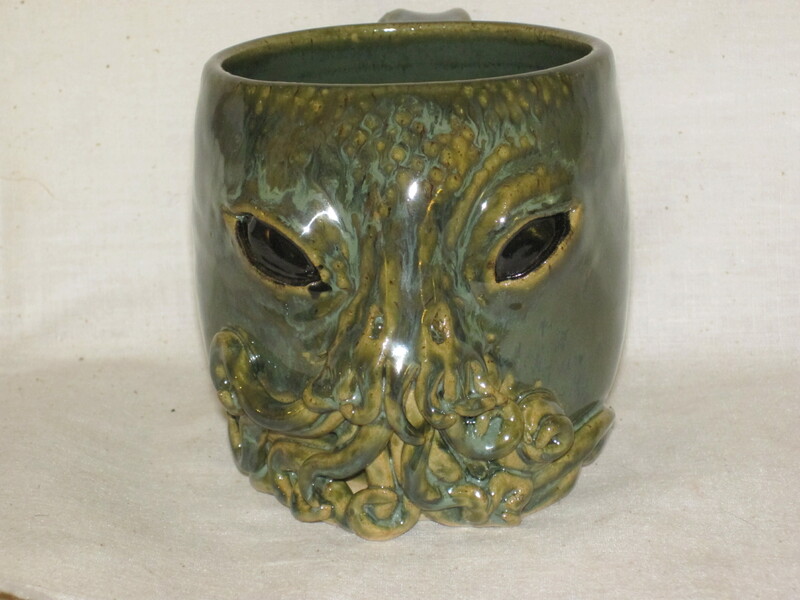 I love the glaze color on Cthulhu. 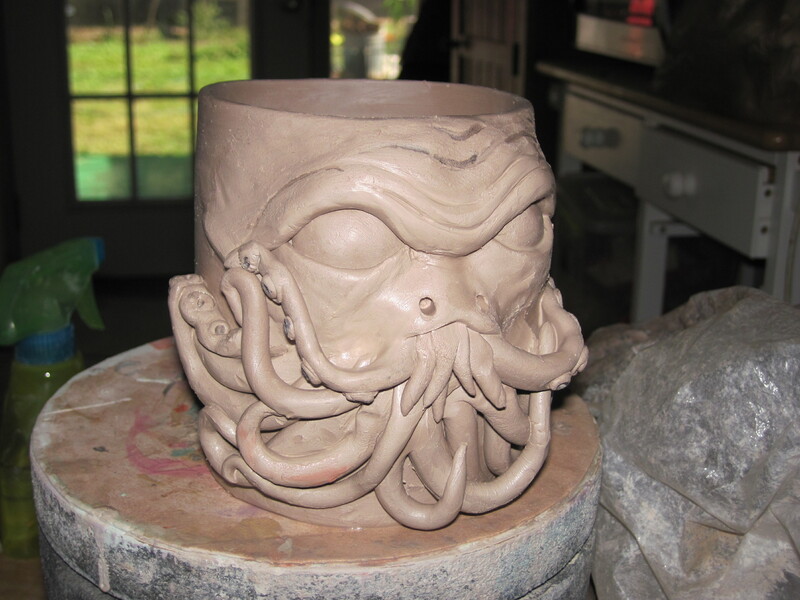 I have been on a serious Cthulhu kick lately, Cthulhu is great to do because open to interpretation, since Lovecraft didn’t have a real clear picture of him. 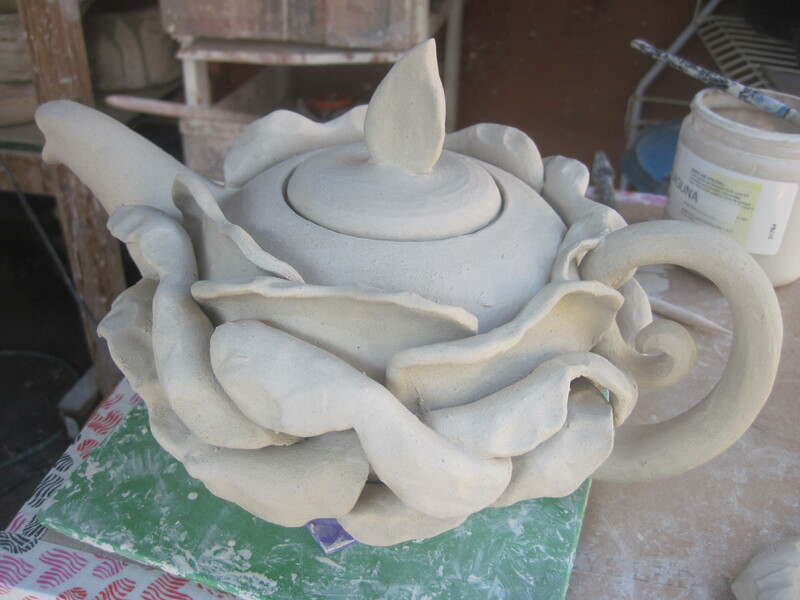 Yesterday I spend all afternoon working on this new piece. 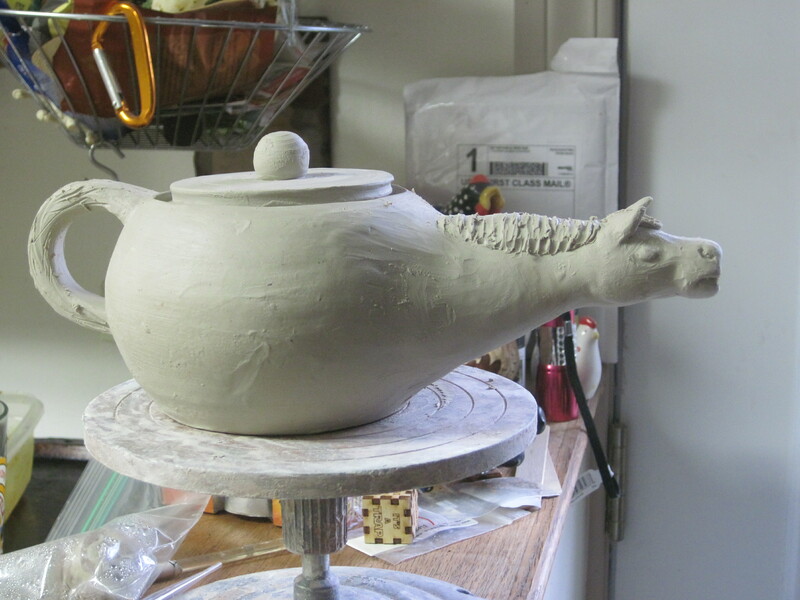 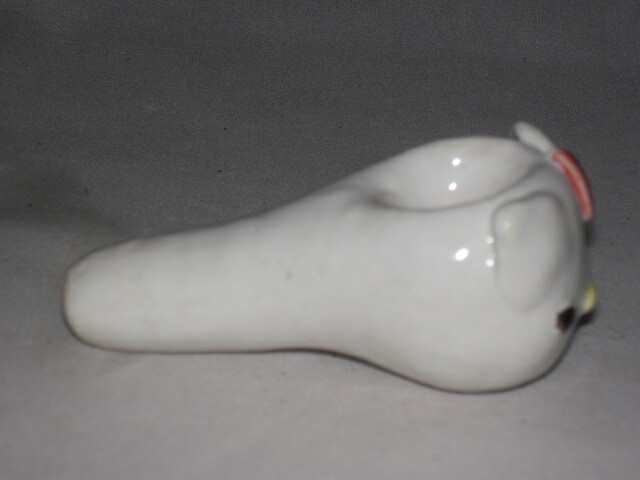 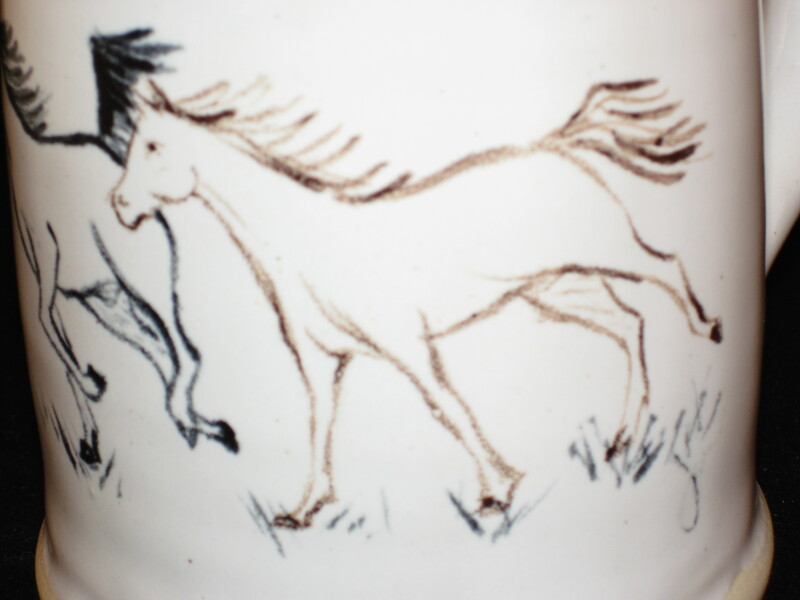 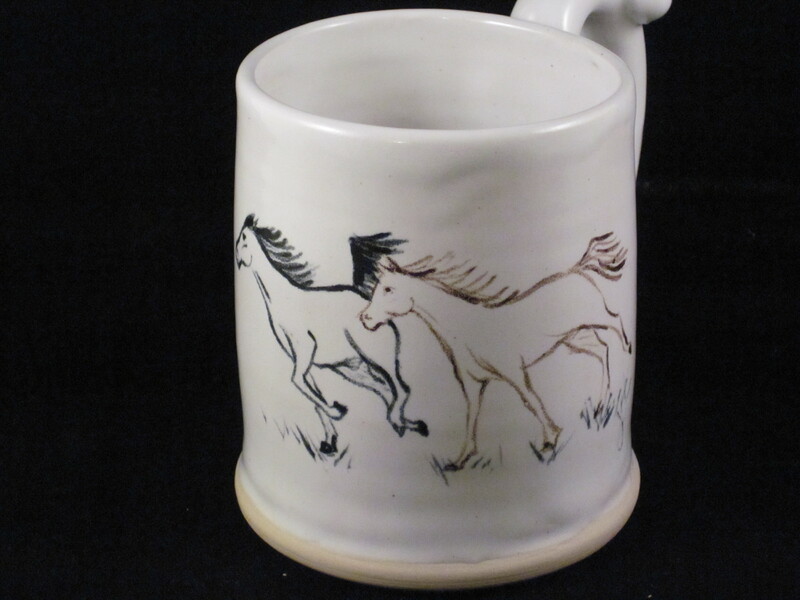 As you see it is a horse teapot. 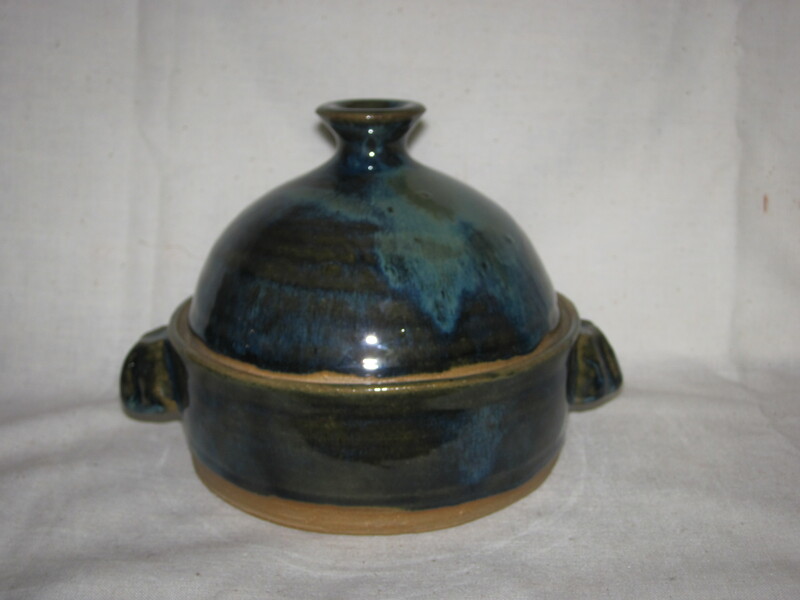 The lid is a little small so I threw a new one today and it will fit alot nicer. 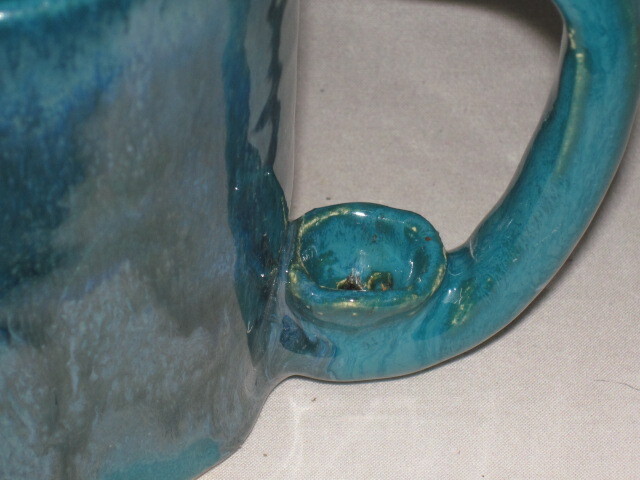 Then I threw a tea/herb/stash jar to fit the old lid. 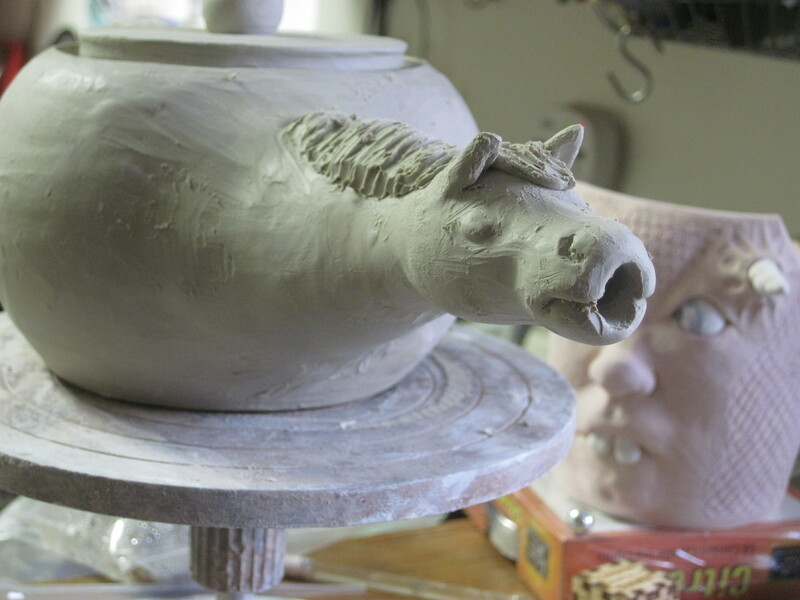 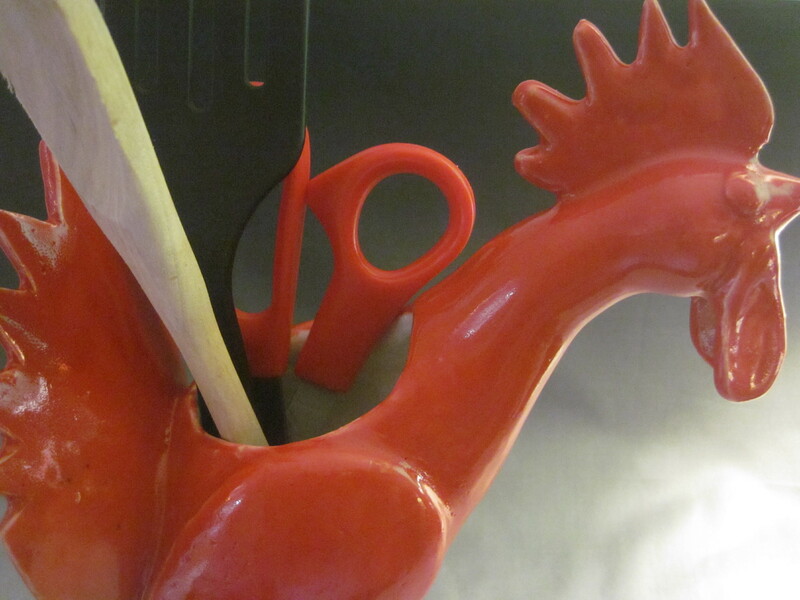 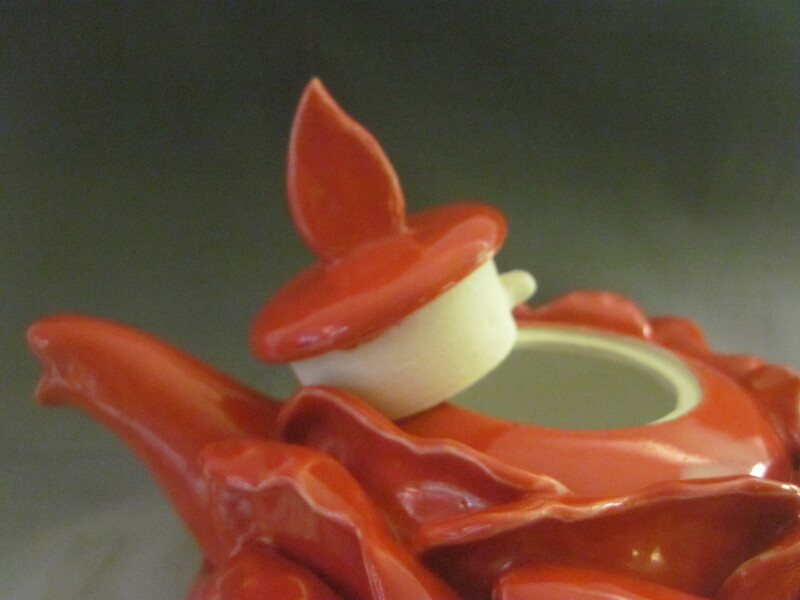 I took pics of the pony teapot for you. 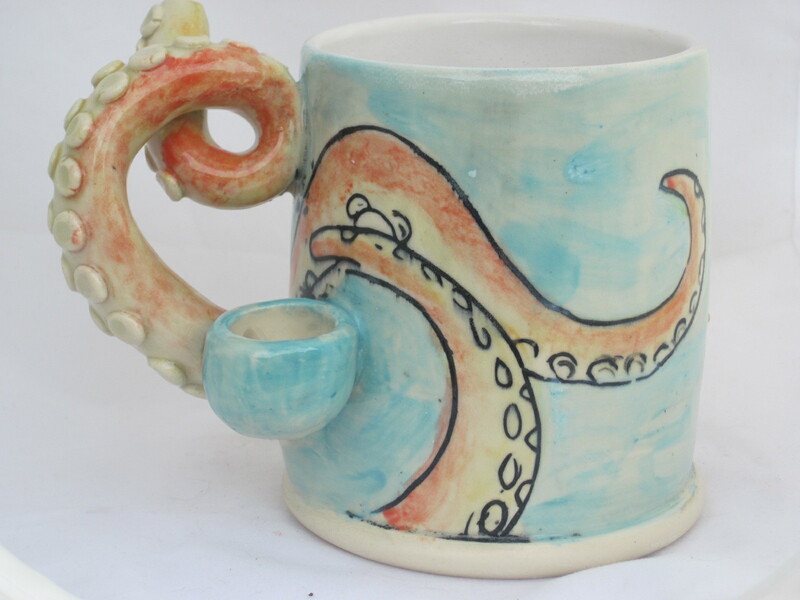 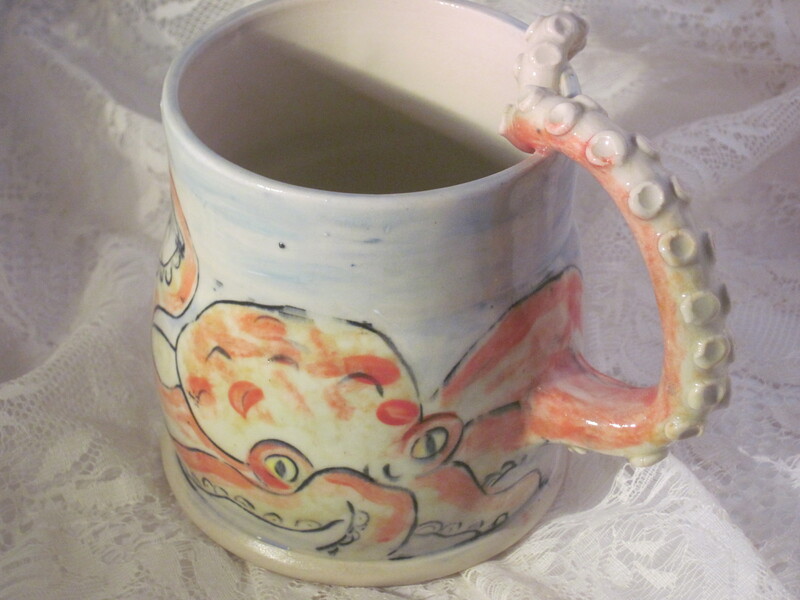 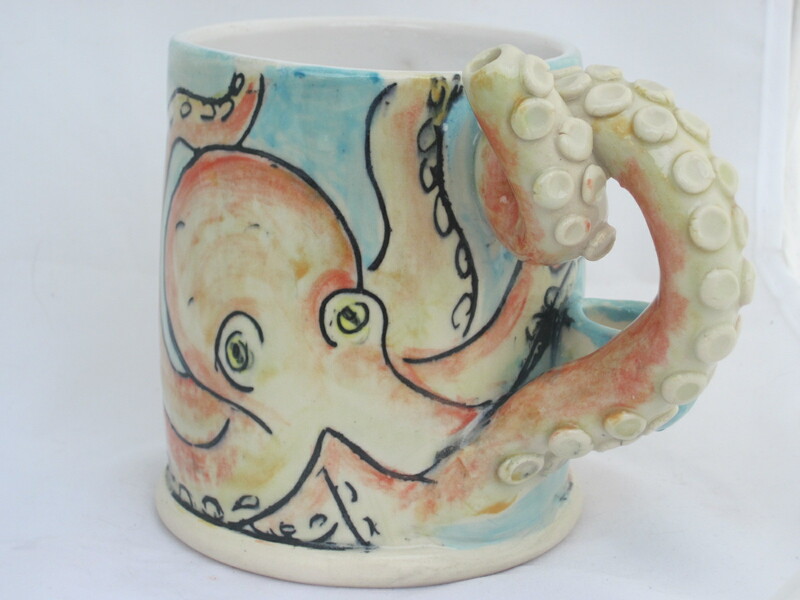 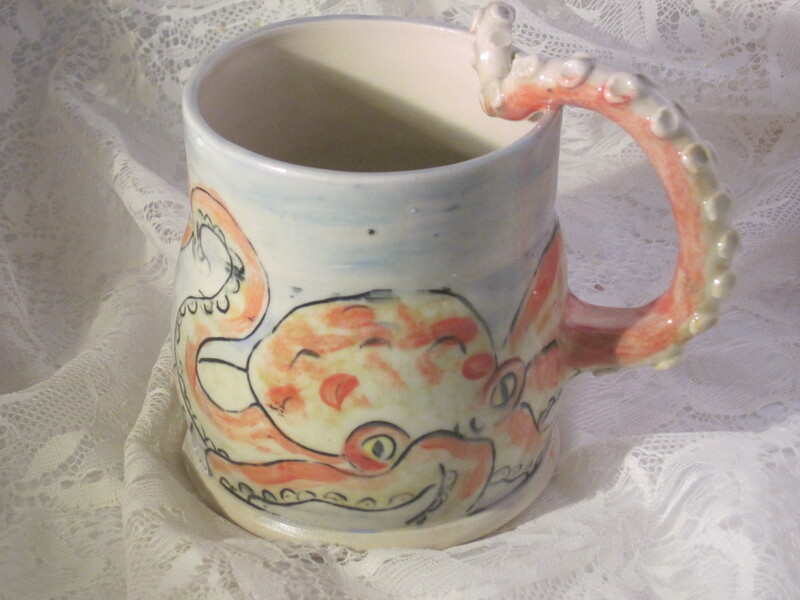 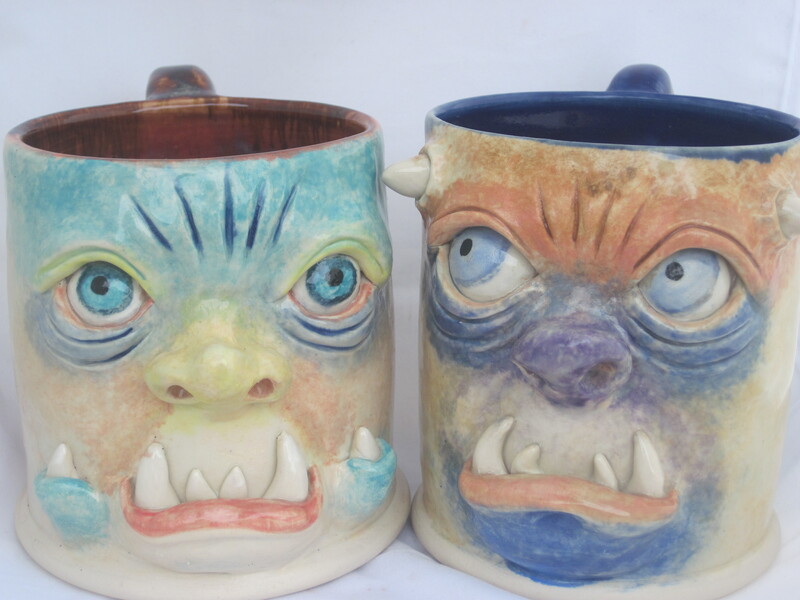 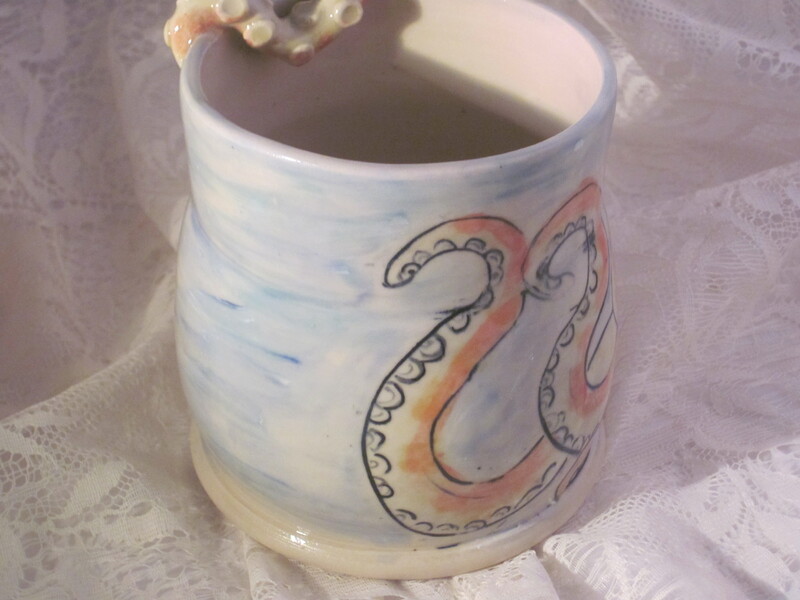 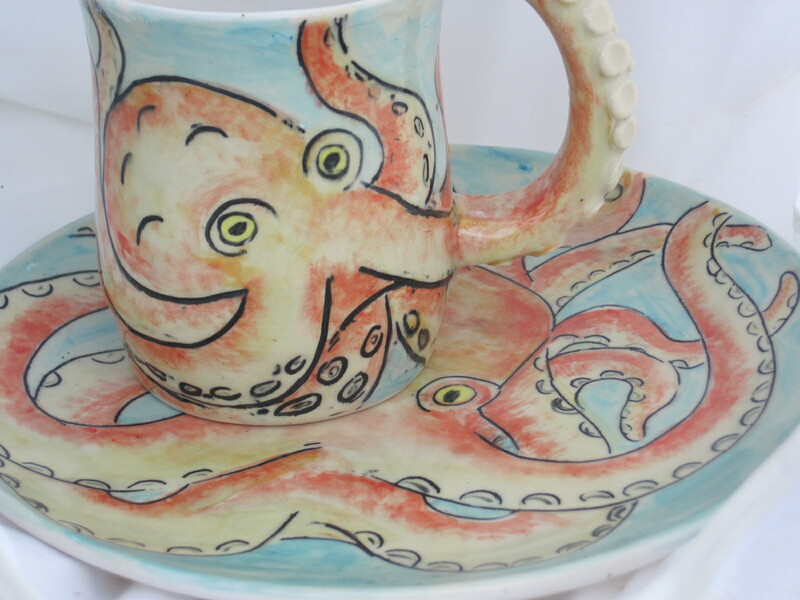 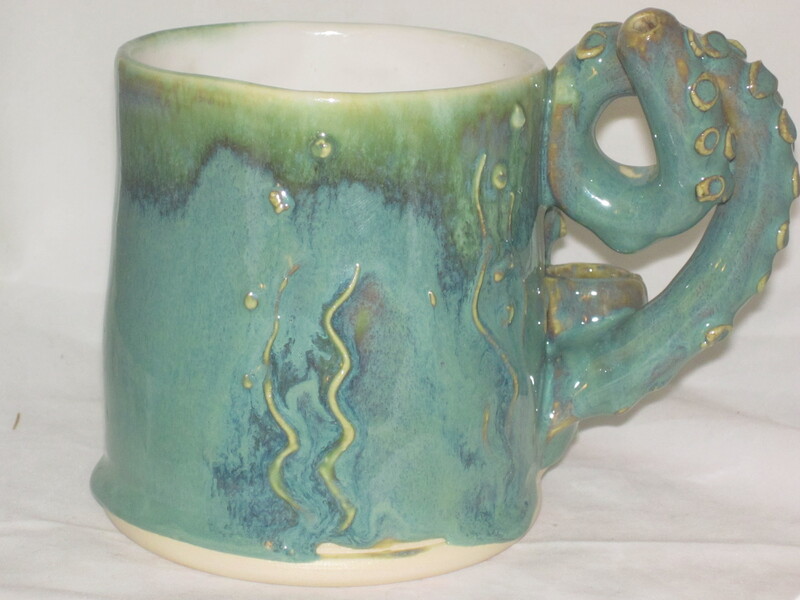 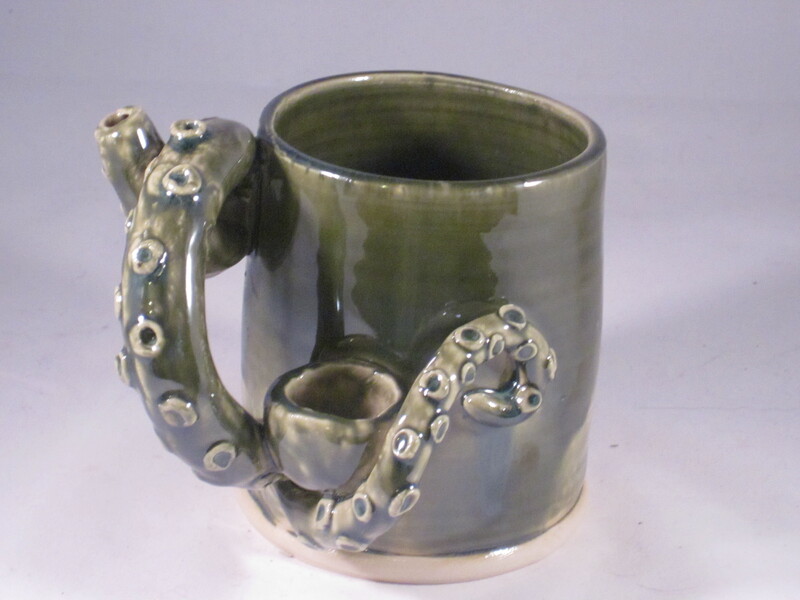 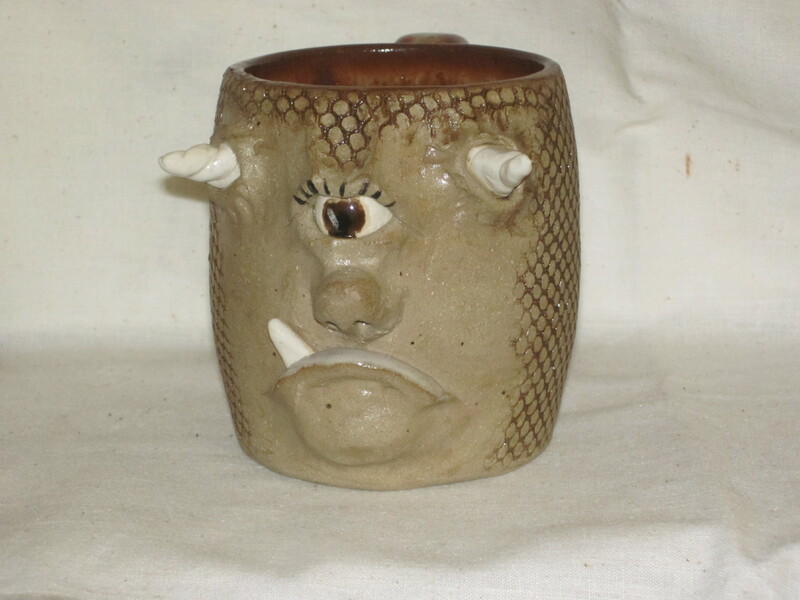 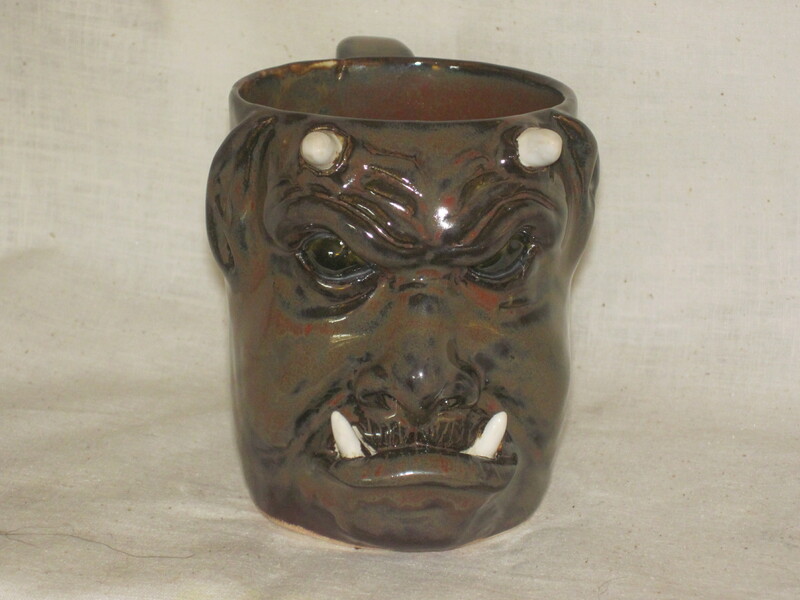 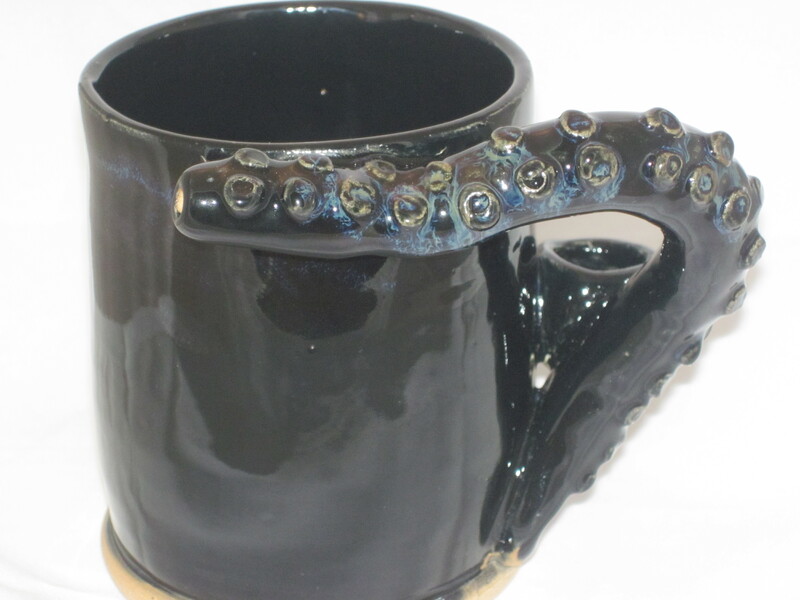 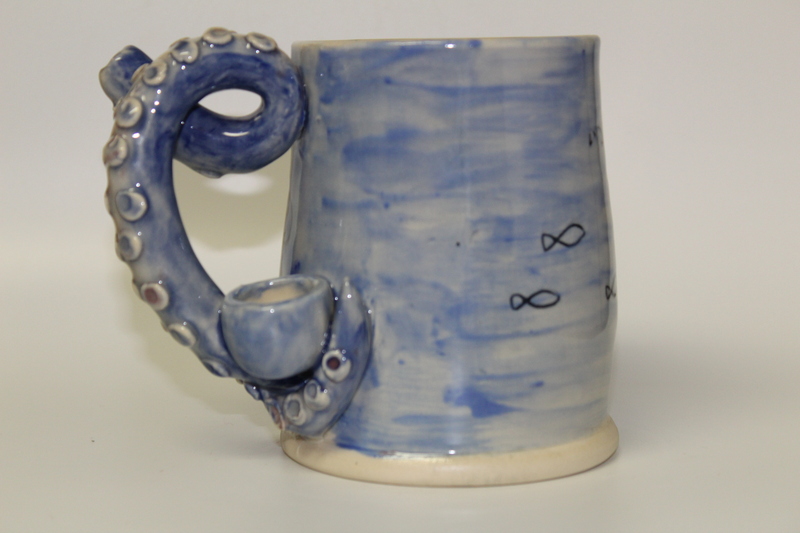 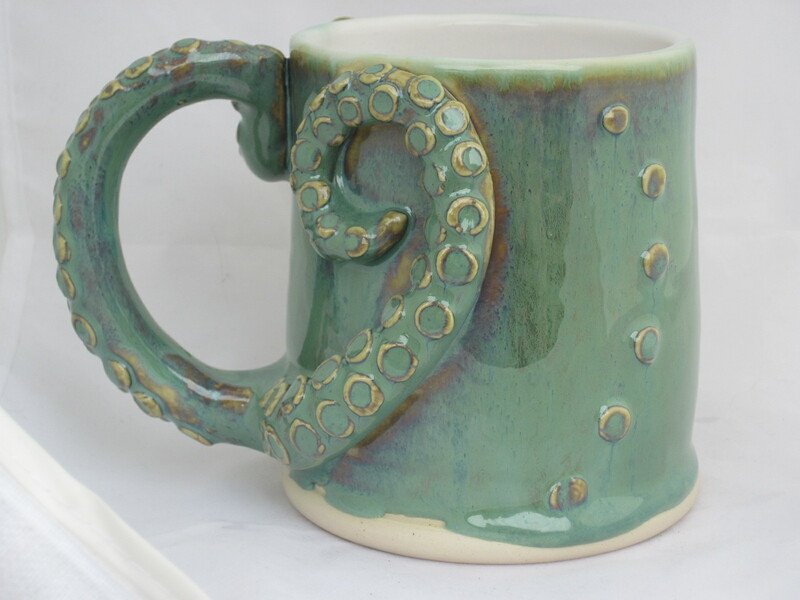 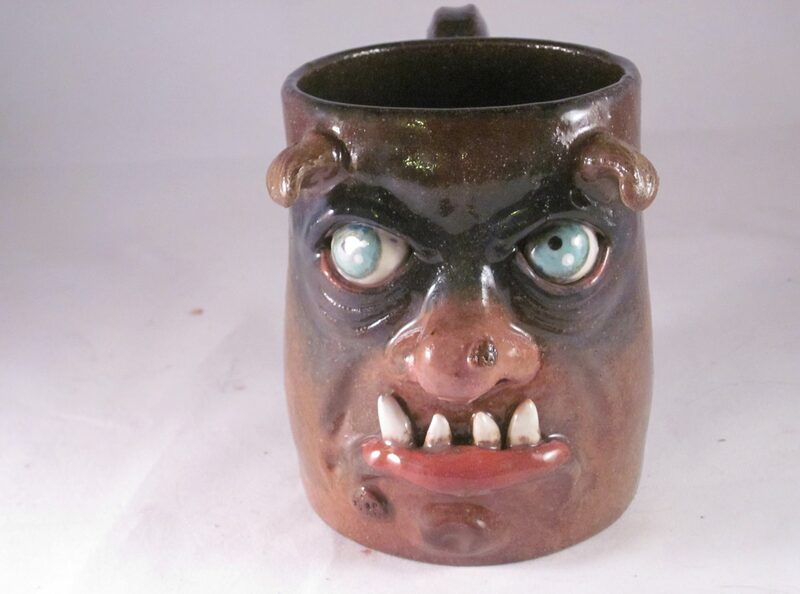 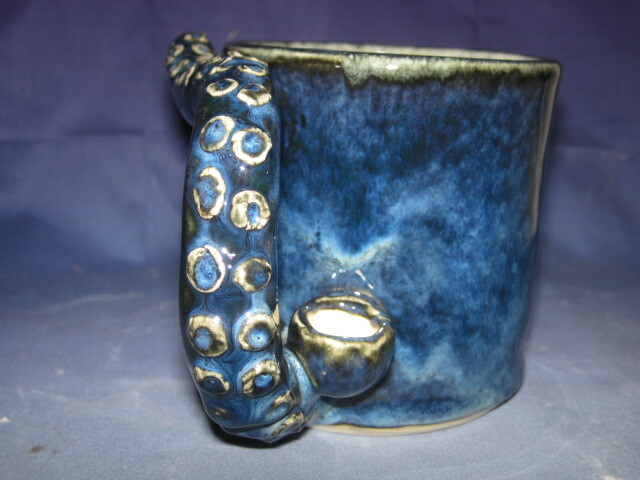 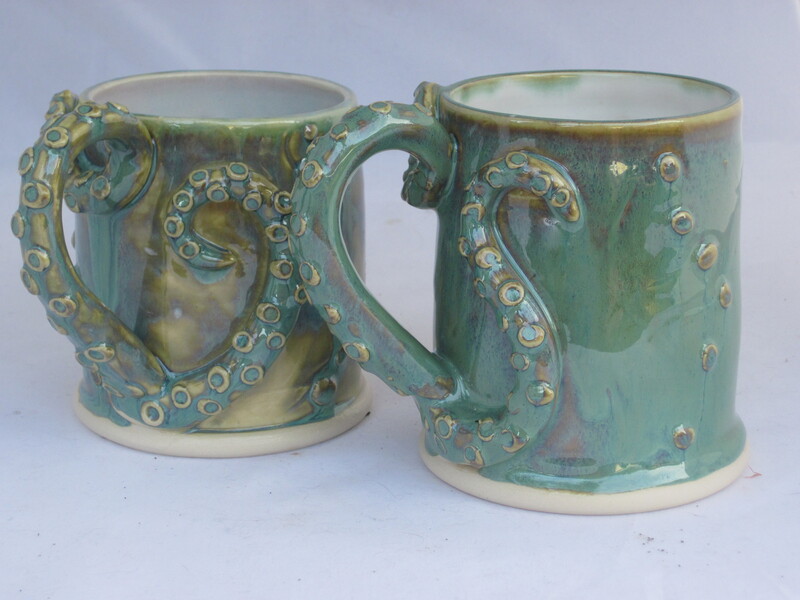 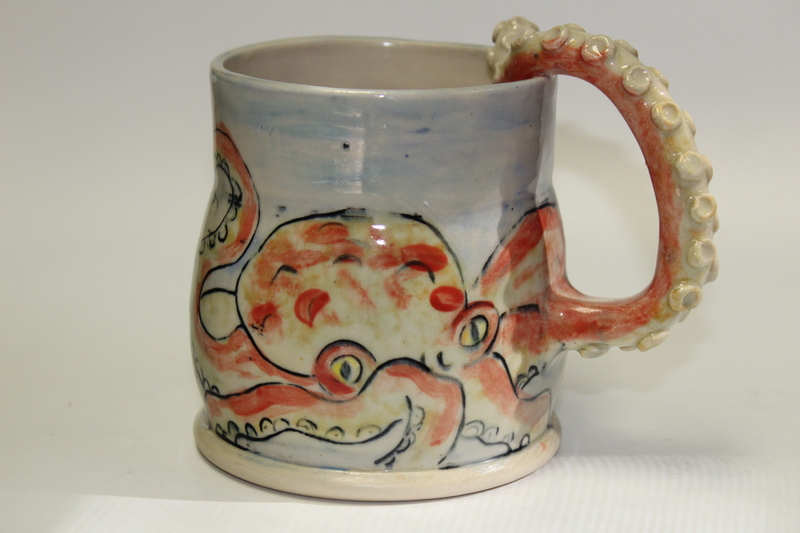 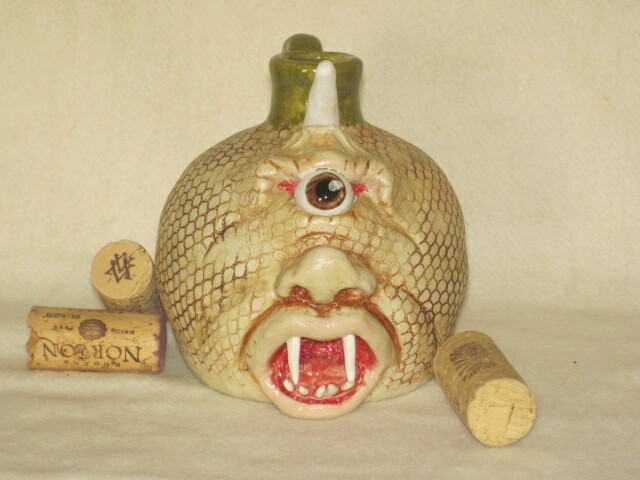 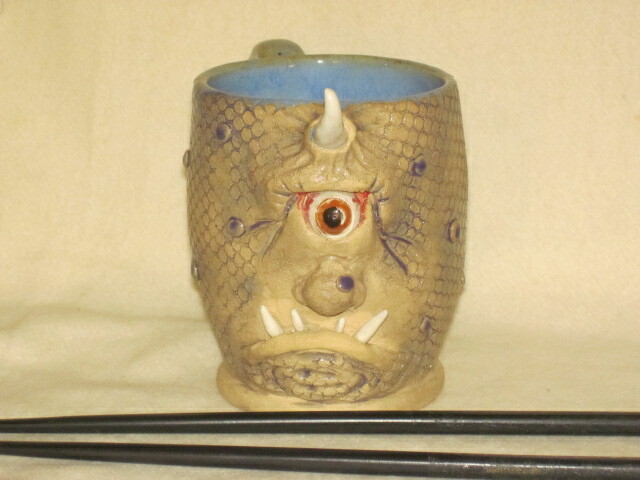 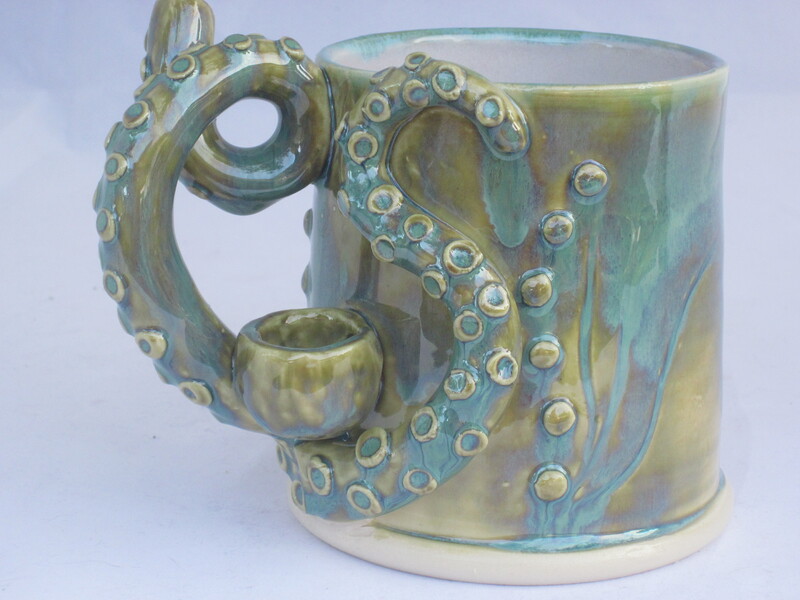 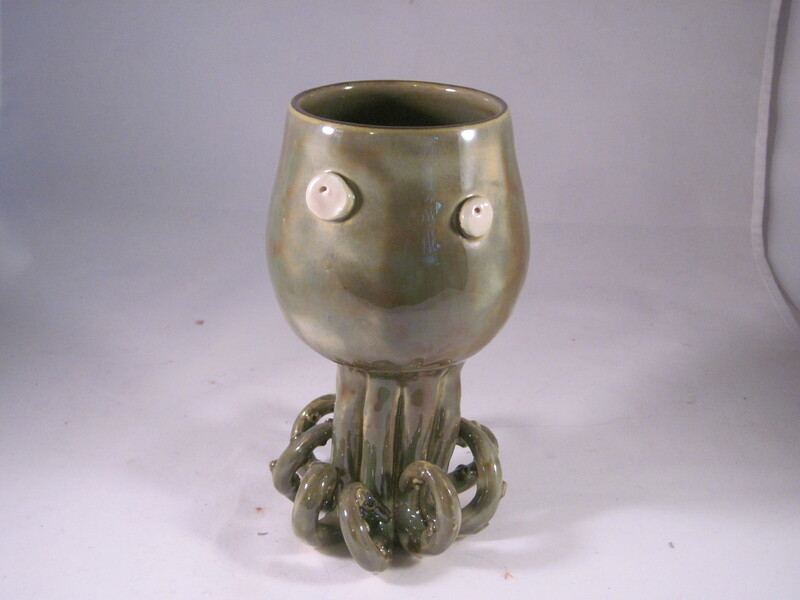 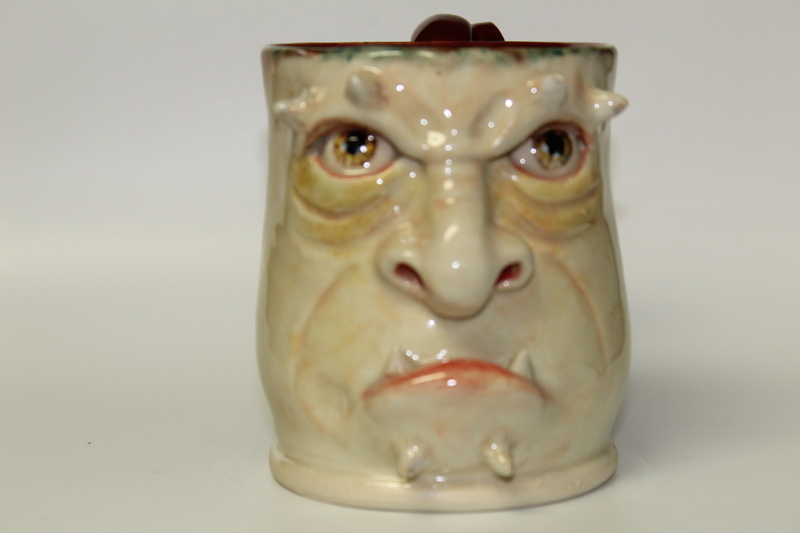 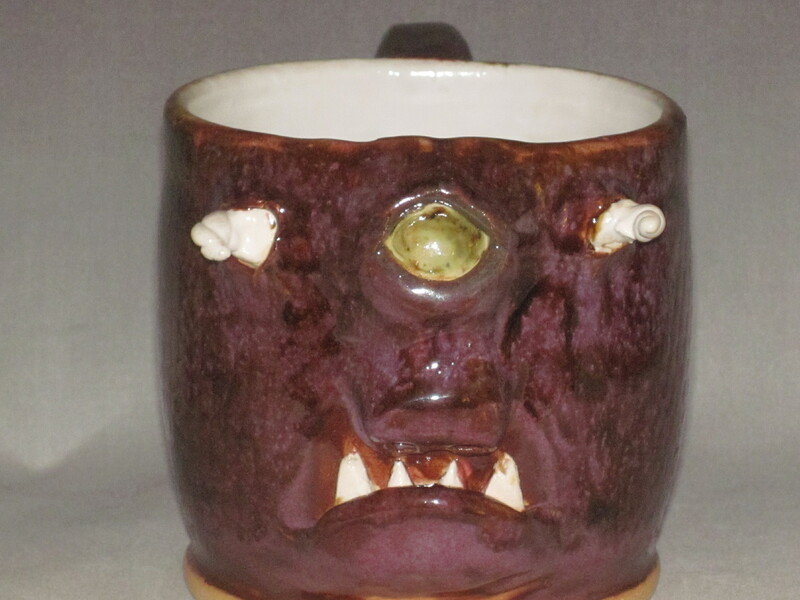 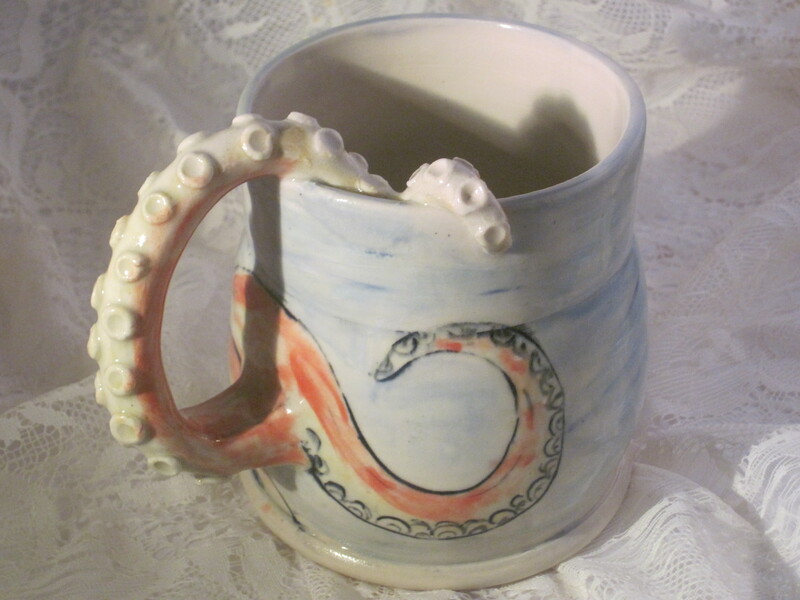 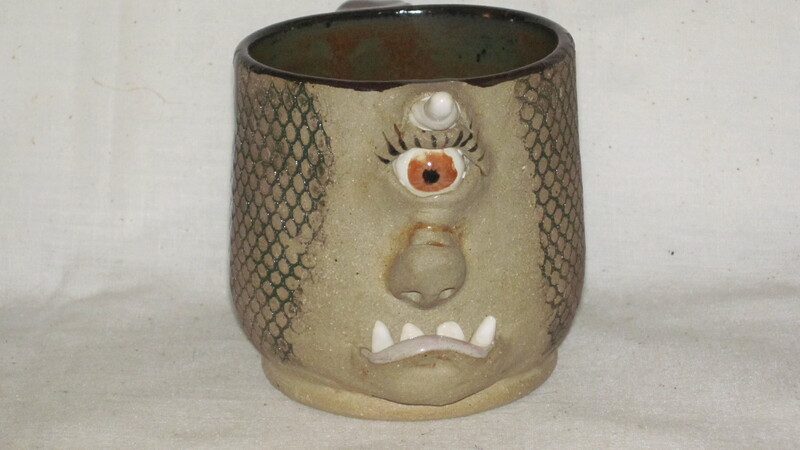 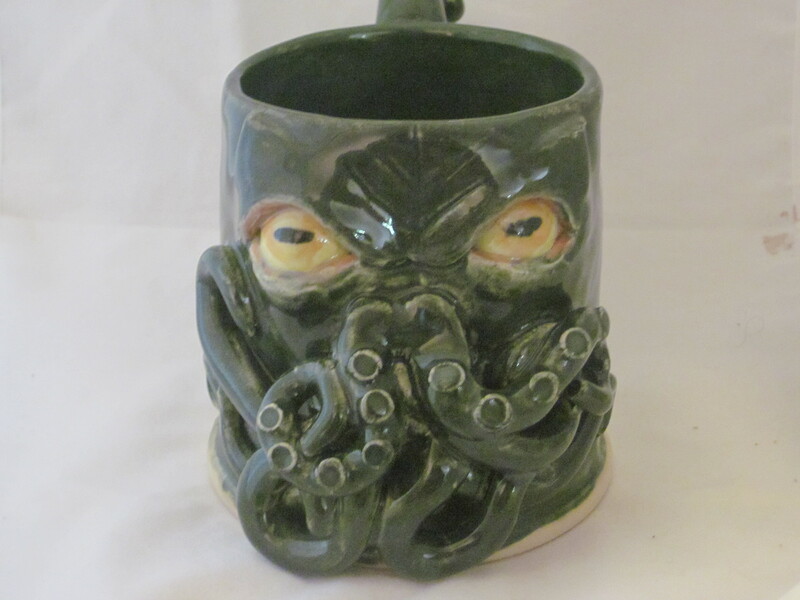 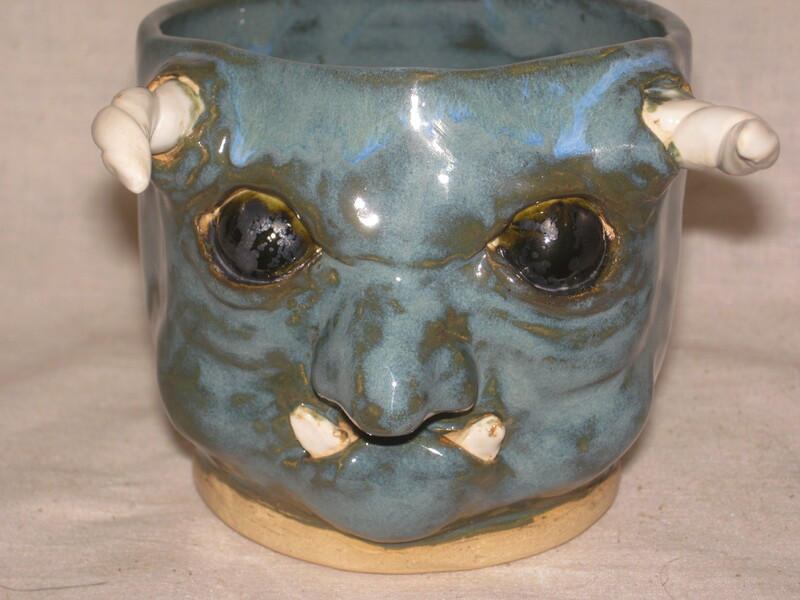 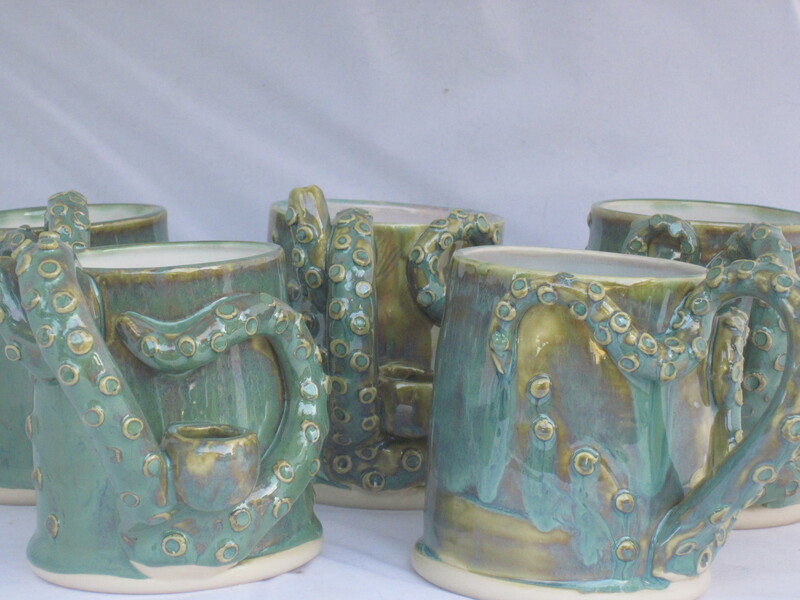 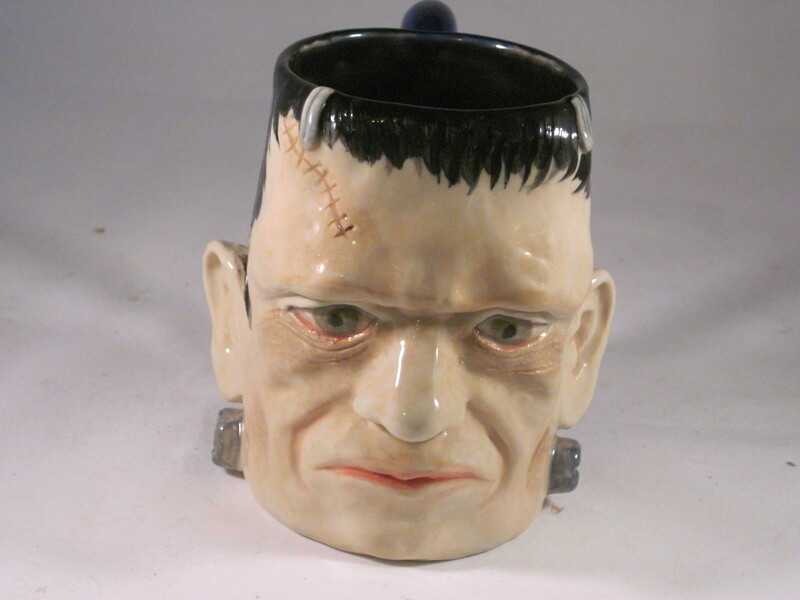 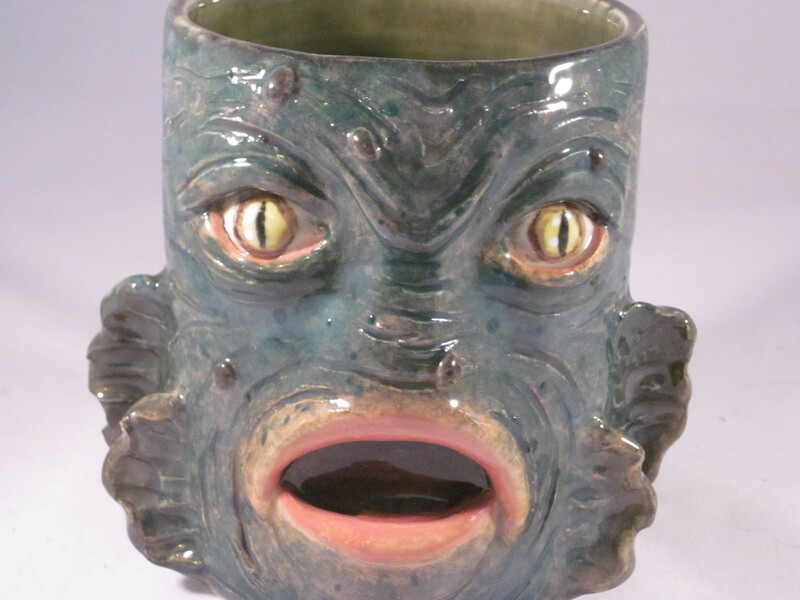 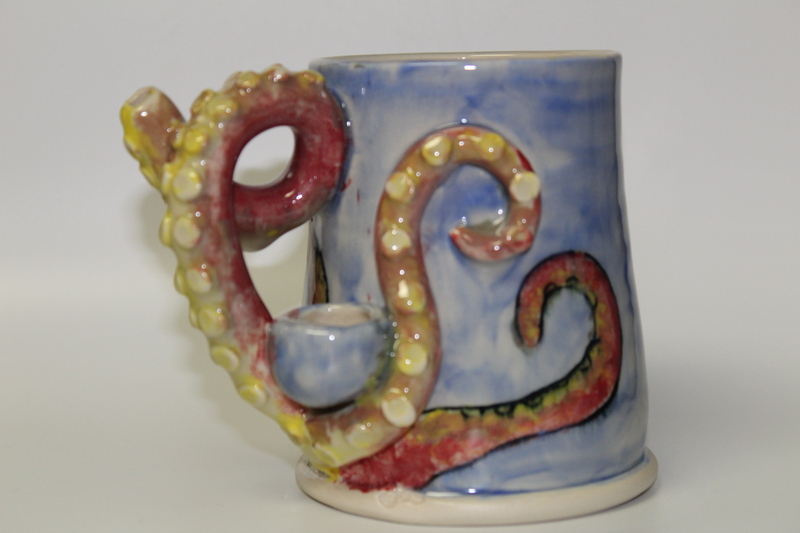 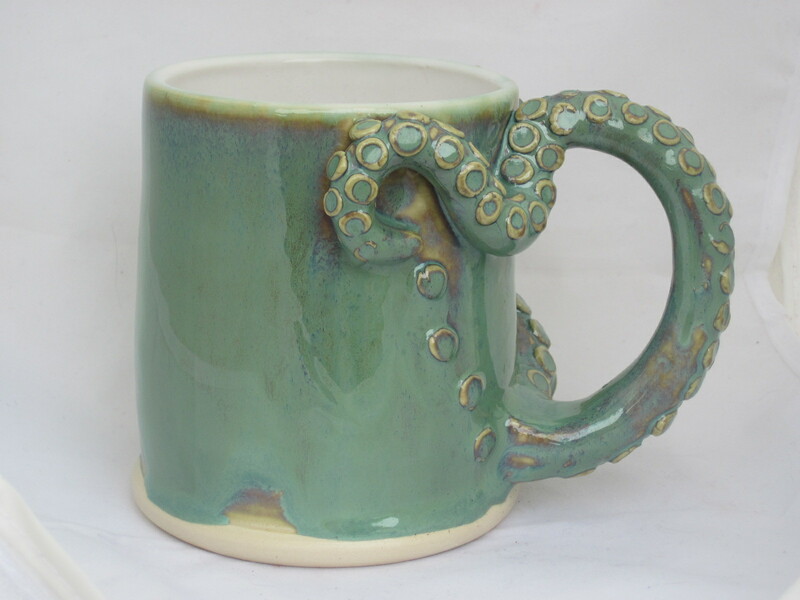 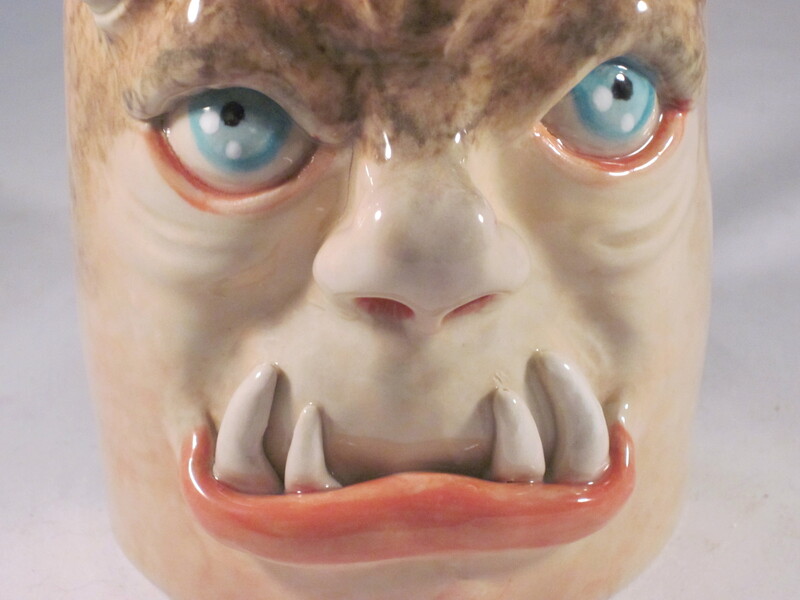 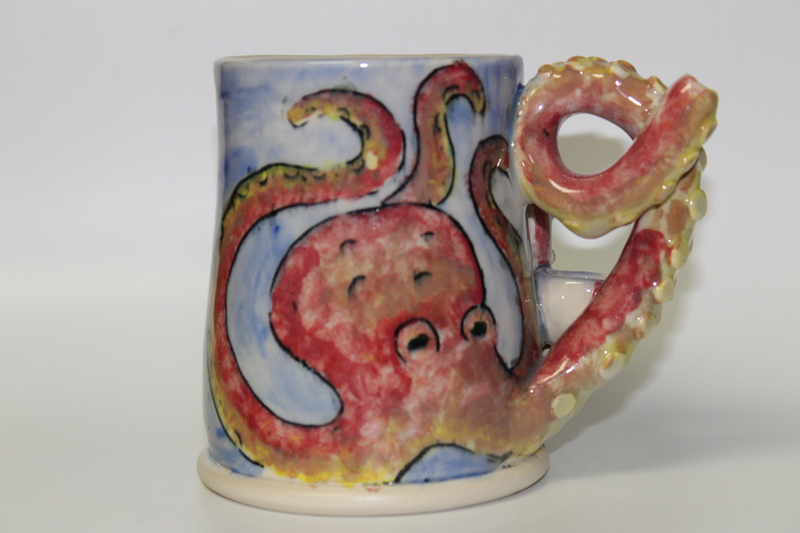 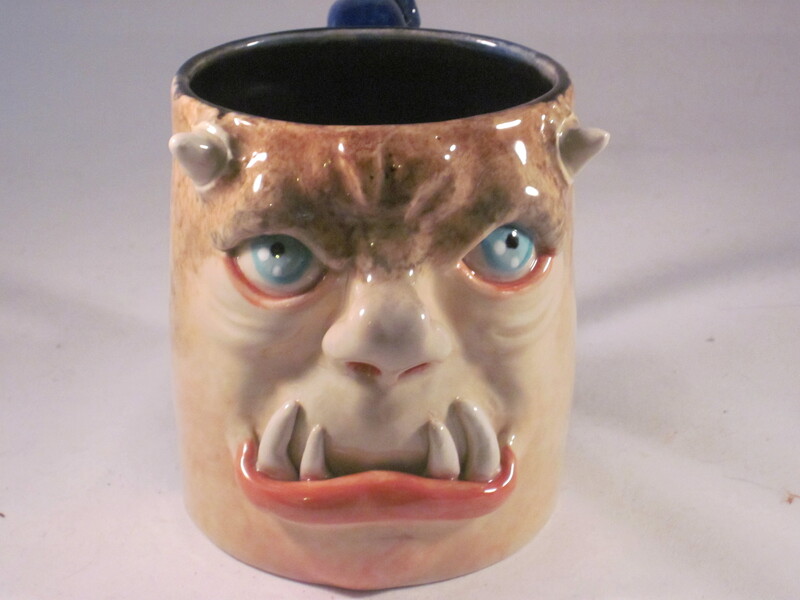 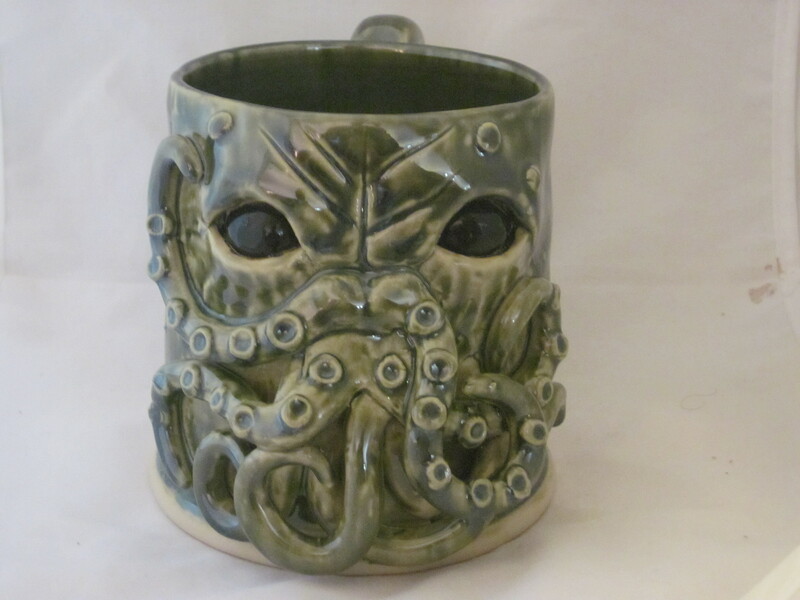 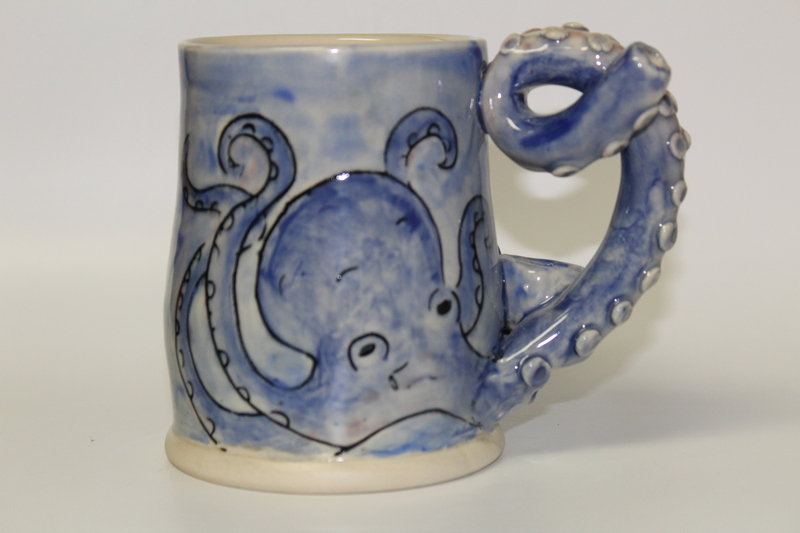 I pulled a few new things from the kiln, my tiny Cthuhlu turned out well, as did my new mugs. 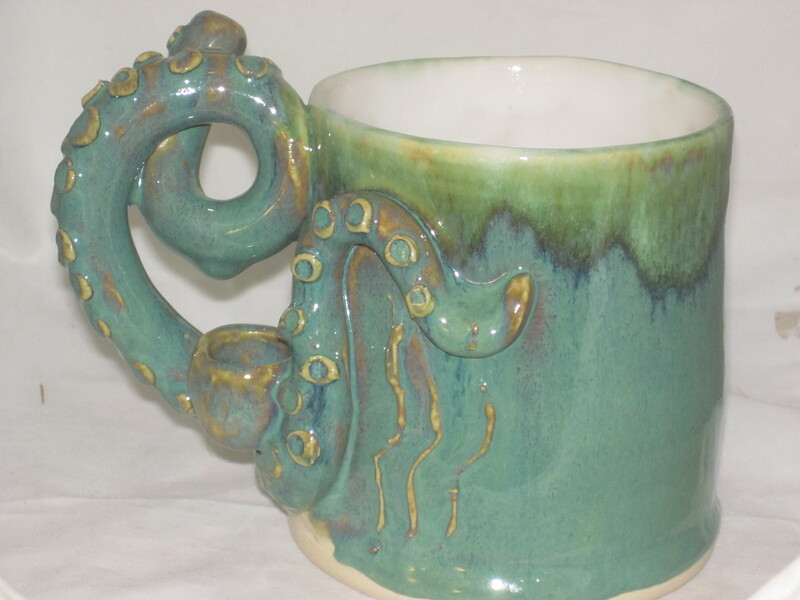 Color me pleased. 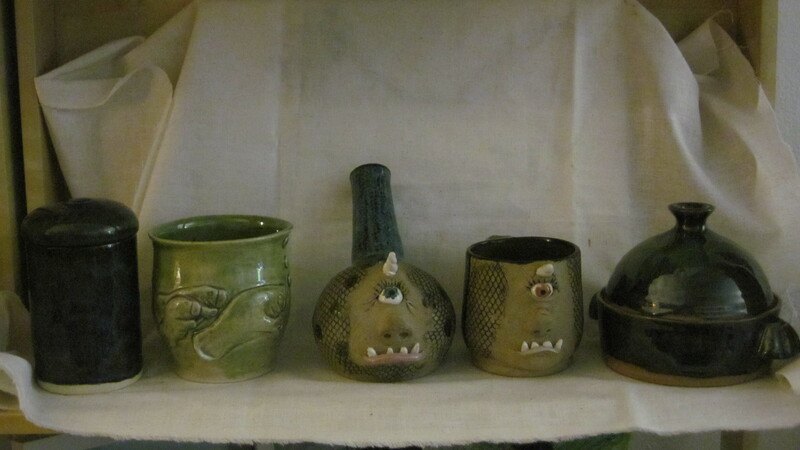 A couple new lil monsters. 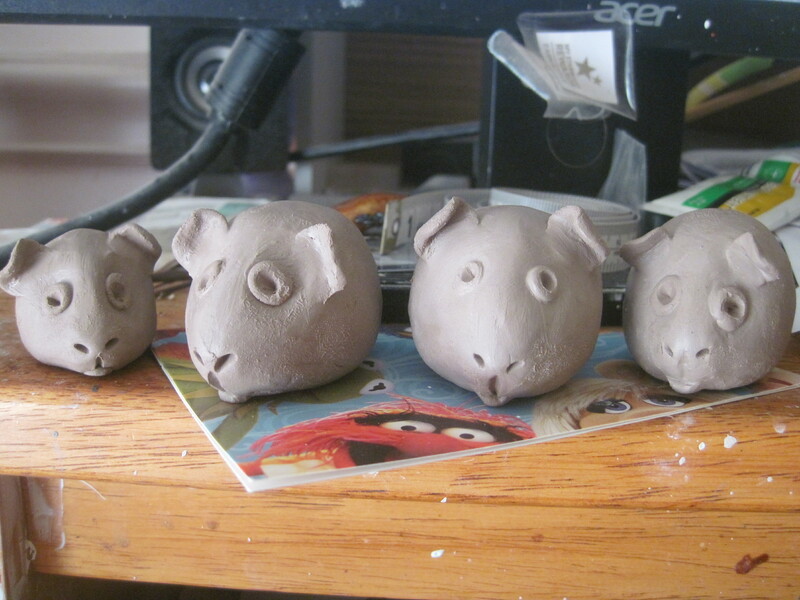 2 of these are in a dark brown clay. 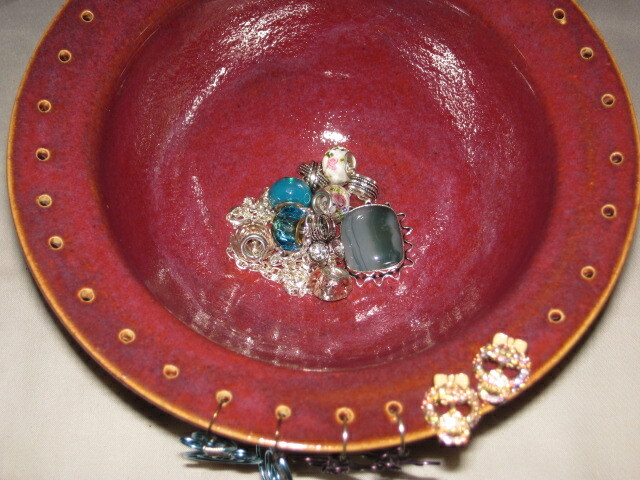 Availability of items is subject to change. 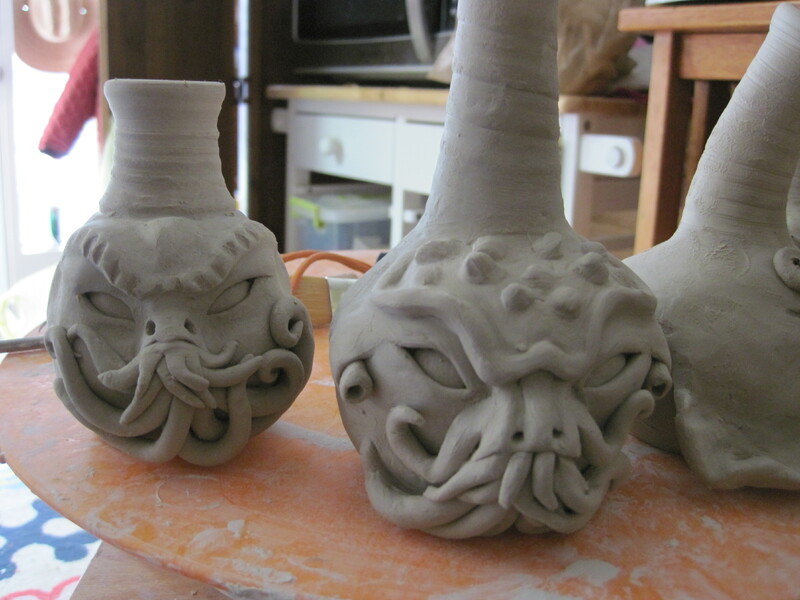 These Items finished in September 2014. 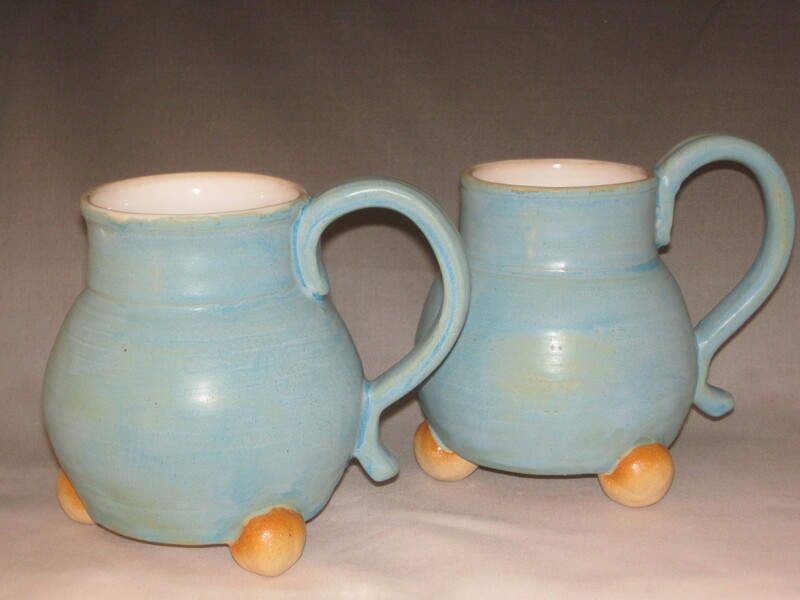 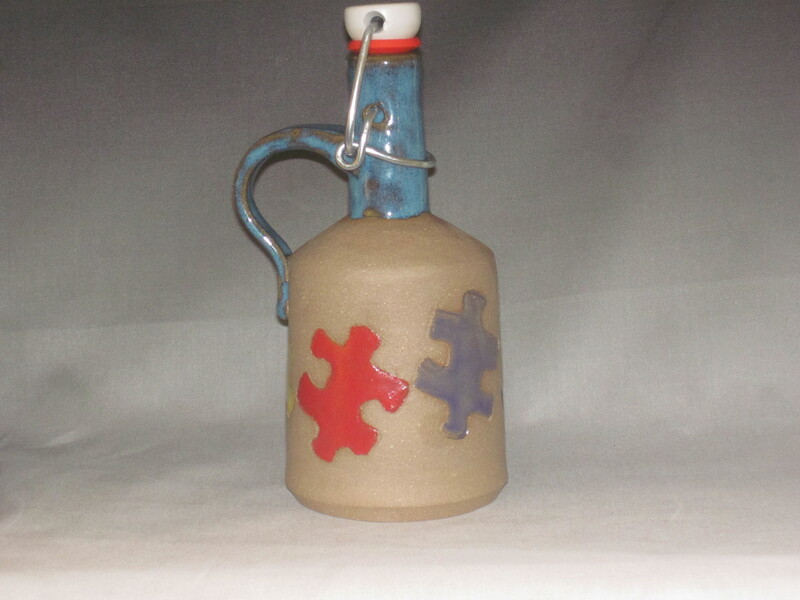 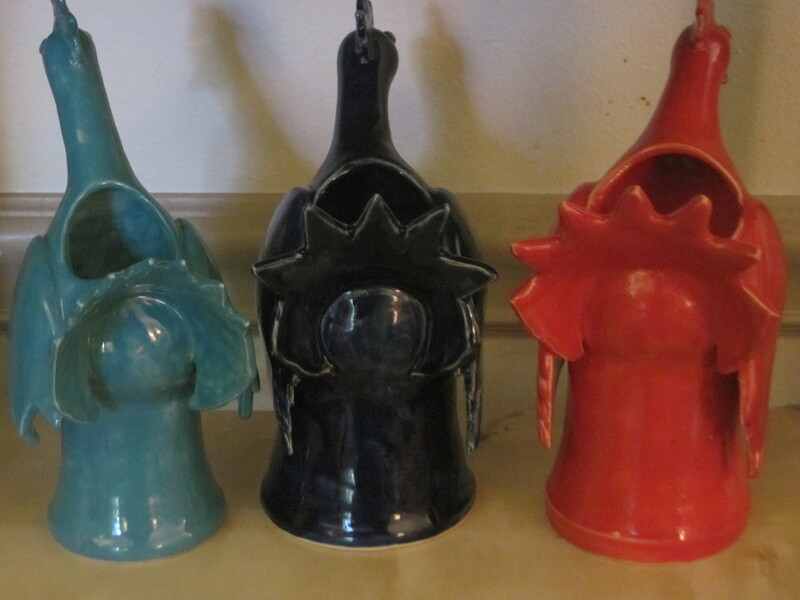 I need to make more jugs. 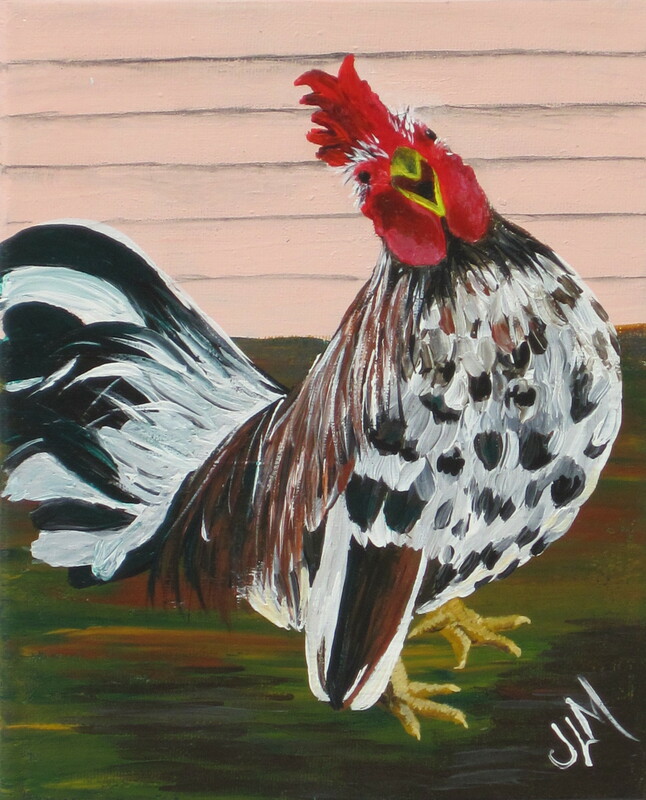 A pretty Speckled Sussex Roo. 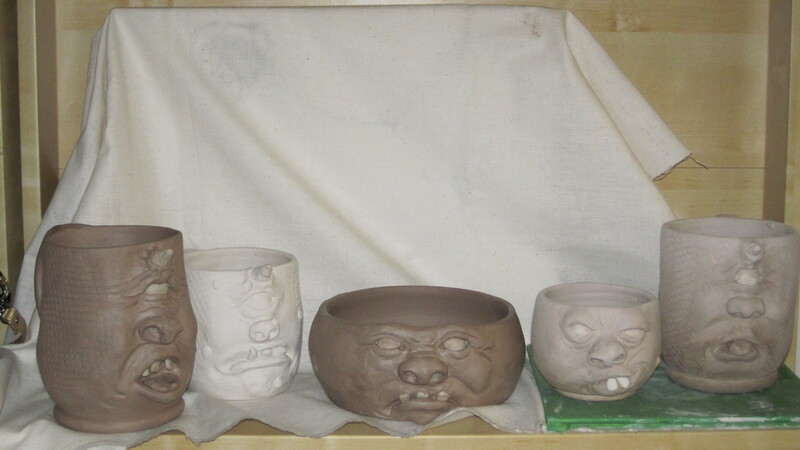 Here are a few pieces that are waiting to be finished. 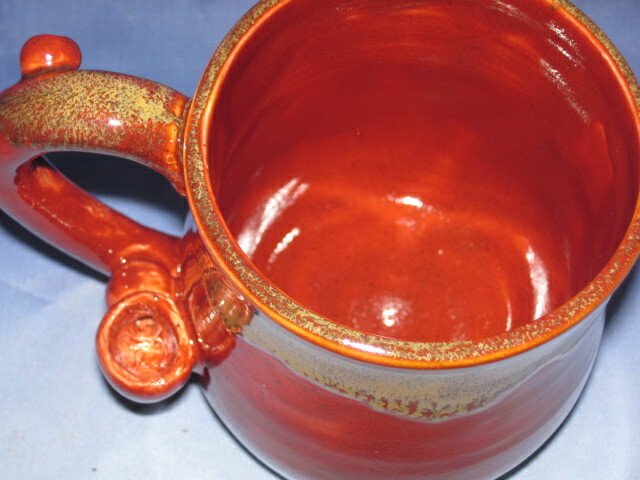 Feel free to drop me an email if you are interested in anything and we can talk about it. 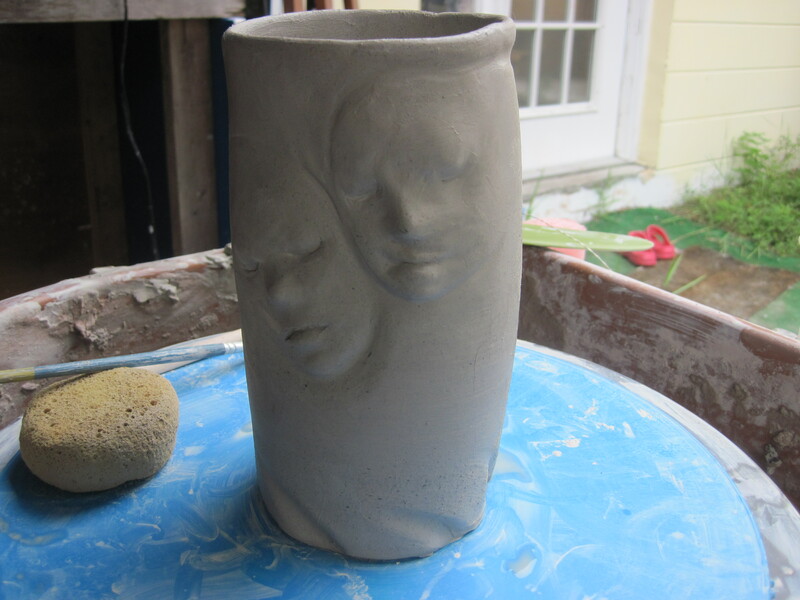 September 2014, a couple of guys just off the wheel. 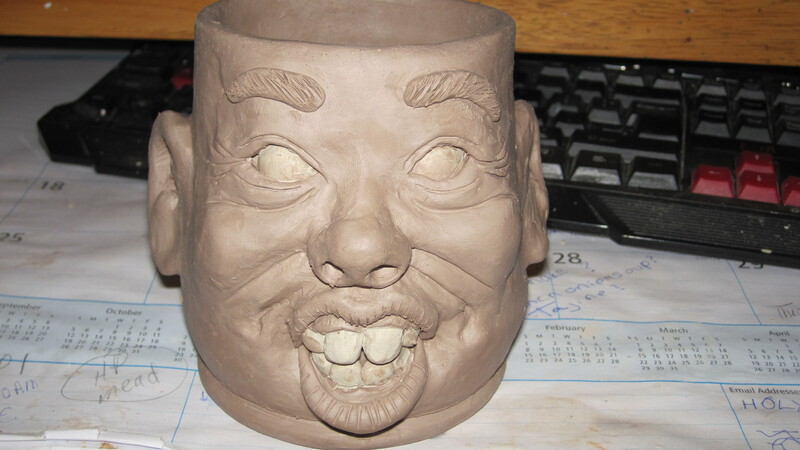 Posted 5 years ago by Jackie Maphis.